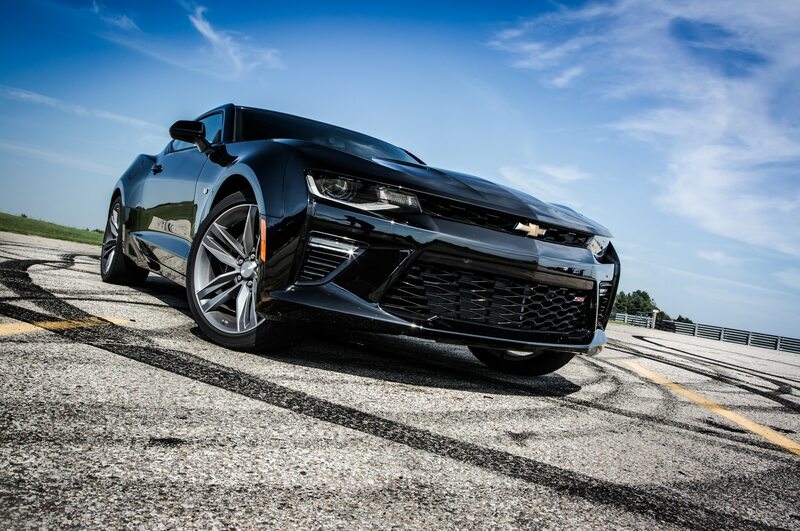 Getting tough at the track with the smaller, lighter, and better Camaro SS. 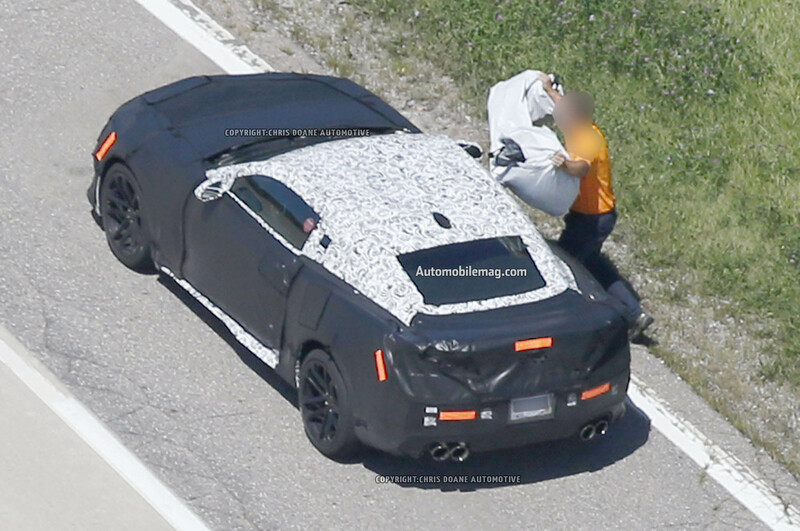 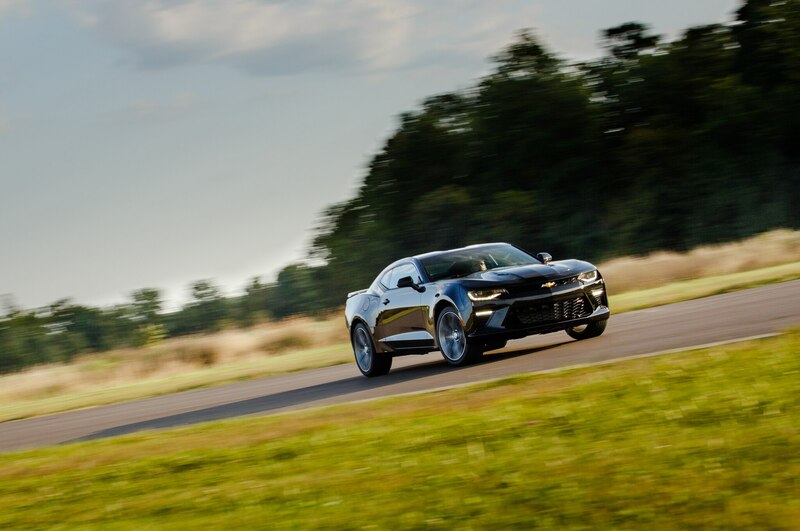 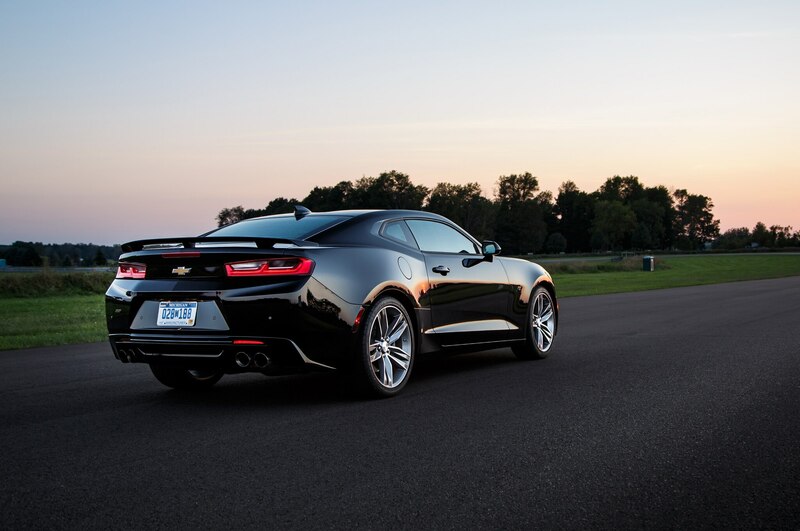 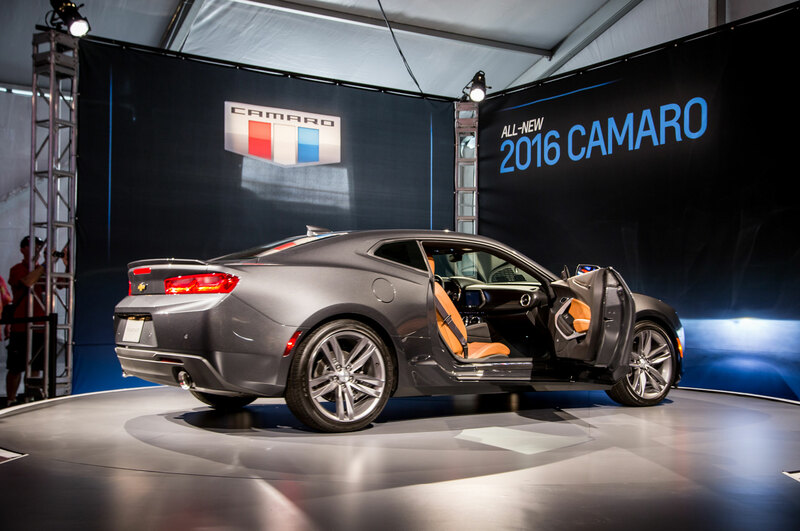 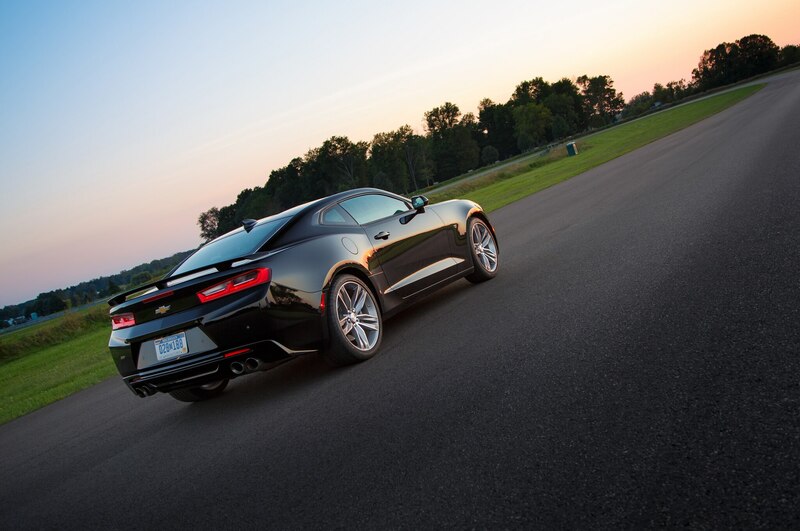 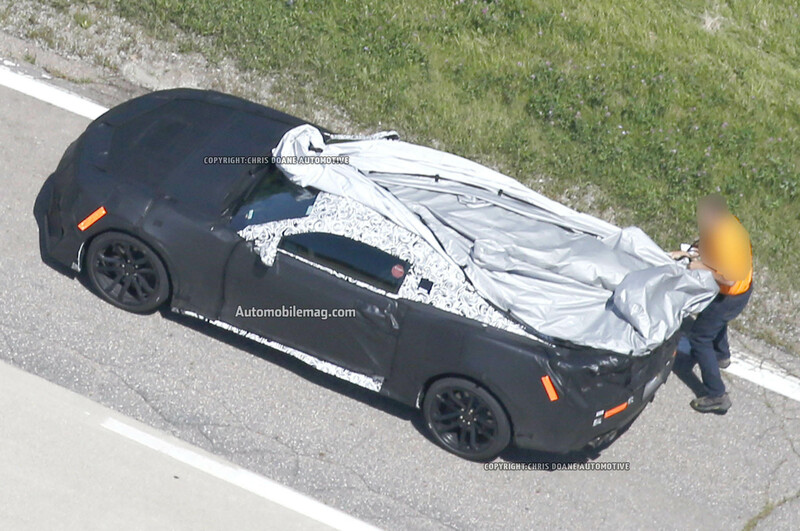 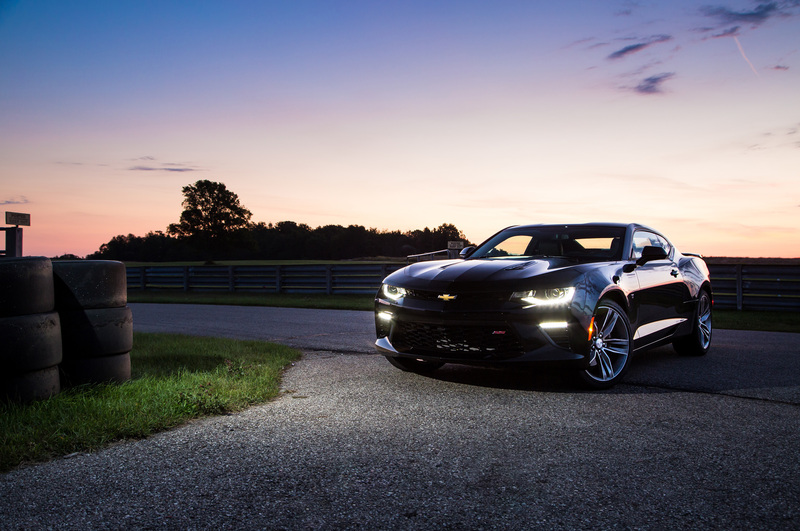 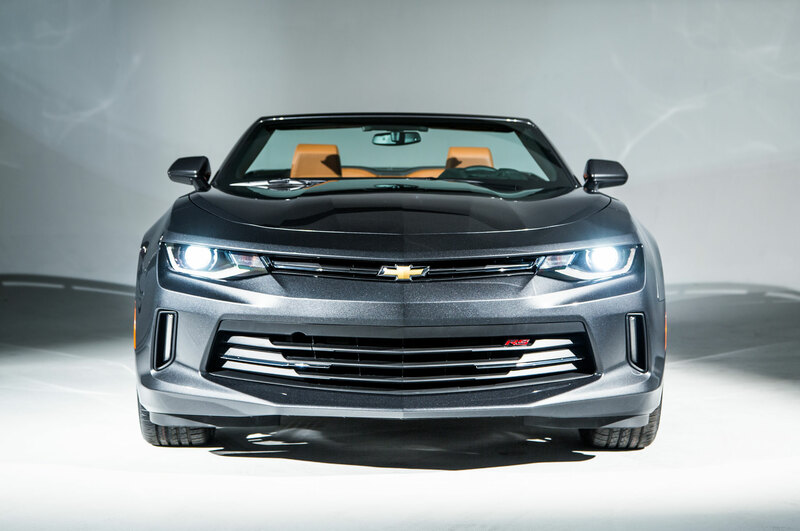 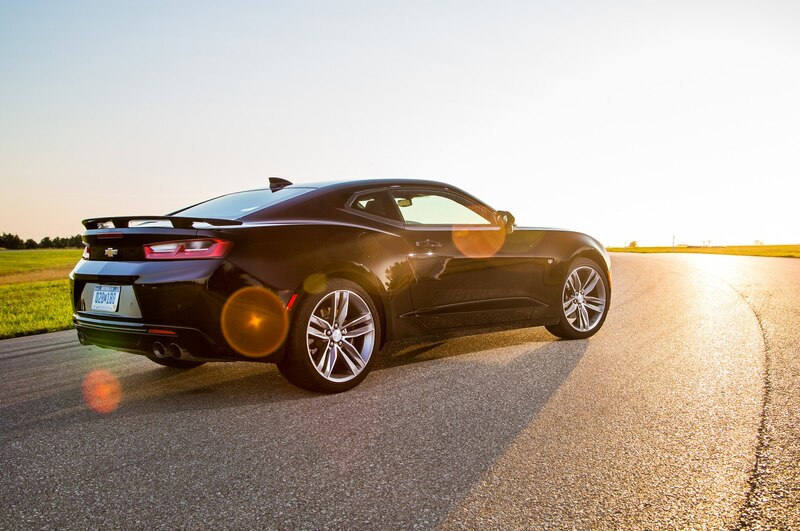 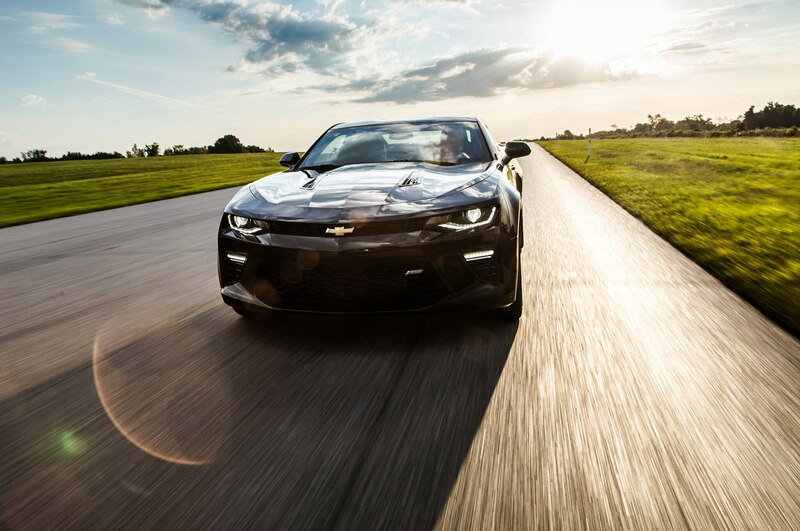 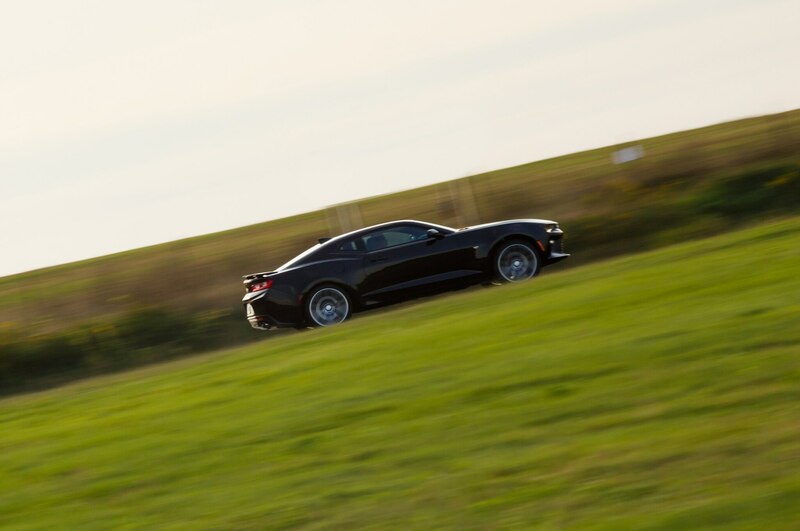 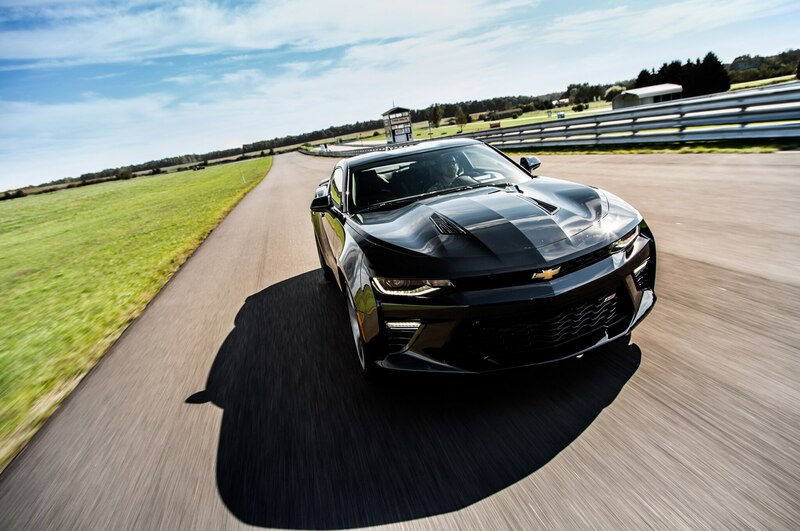 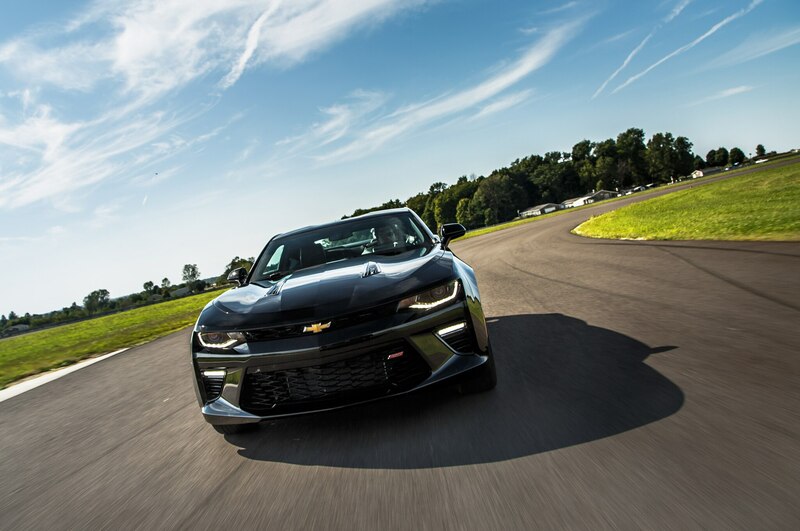 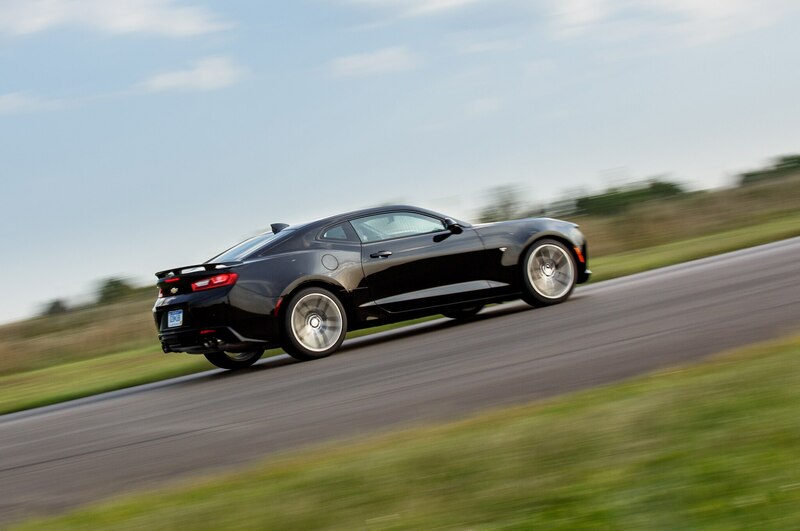 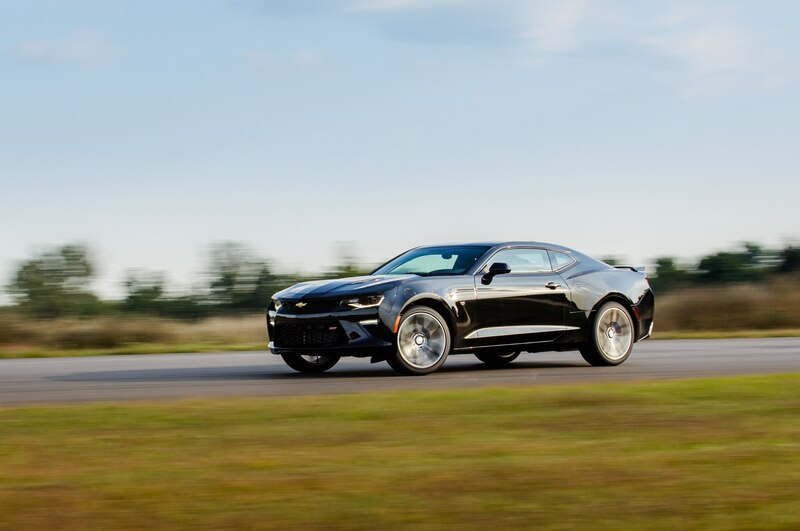 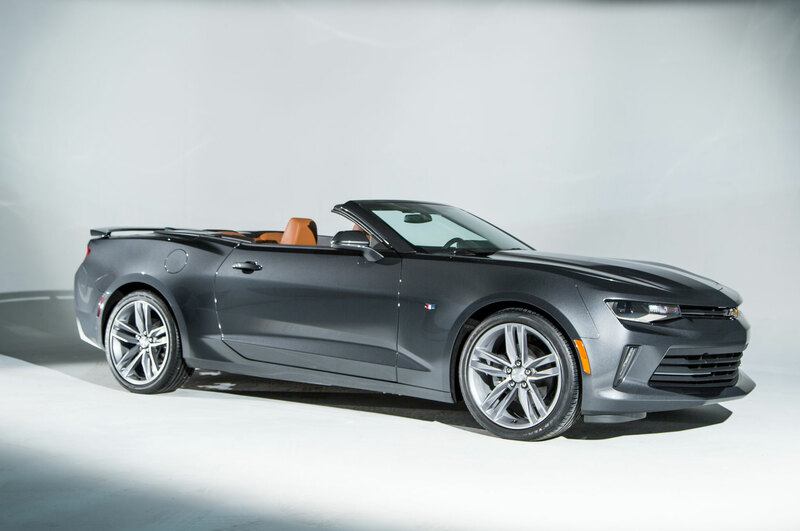 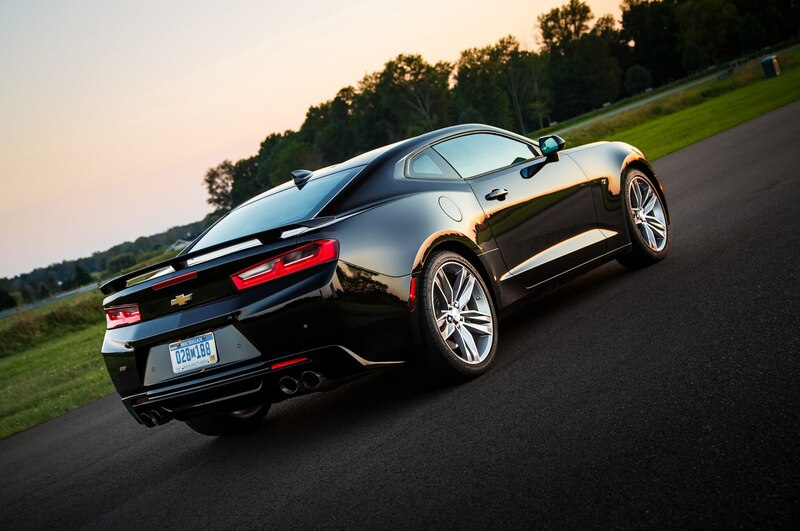 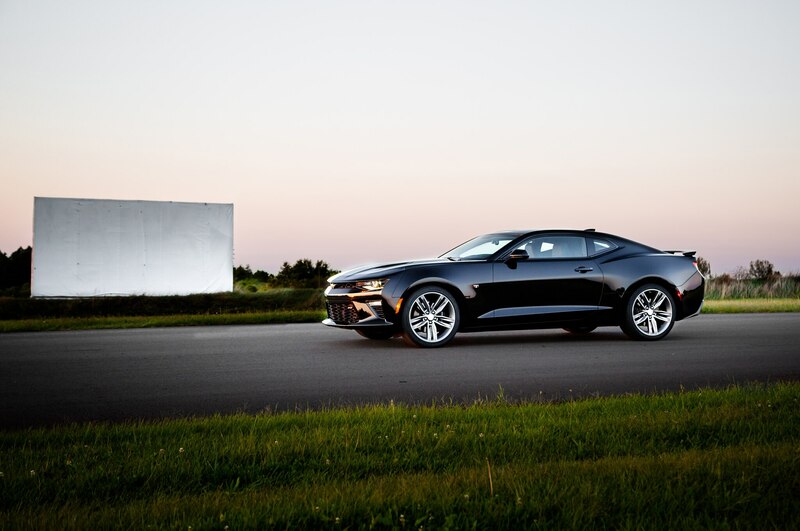 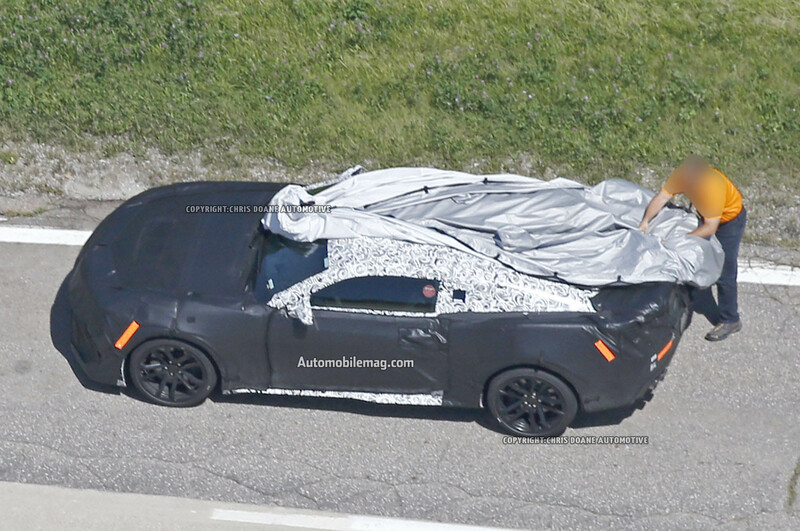 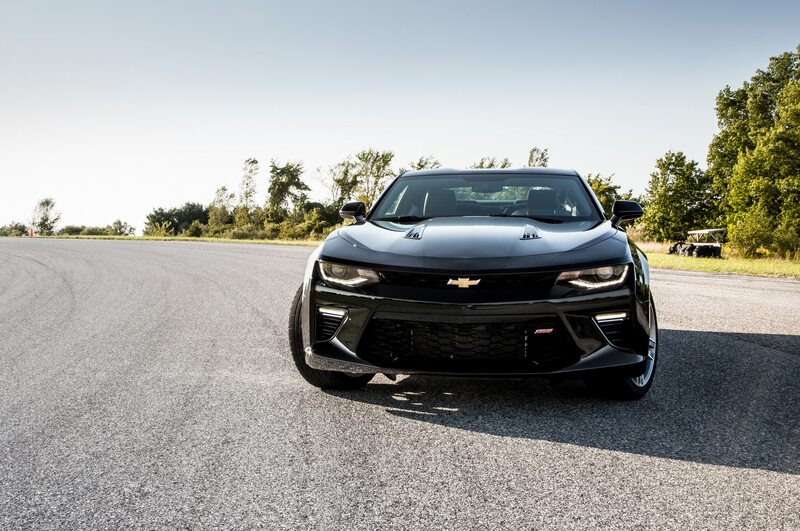 SOUTH HAVEN, Michigan — The look of the 2016 Chevrolet Camaro SS might seem familiar, and the surroundings here at Gingerman Raceway have been a familiar stage for the Camaro since the model’s rebirth for 2010, but really this is a whole new deal. 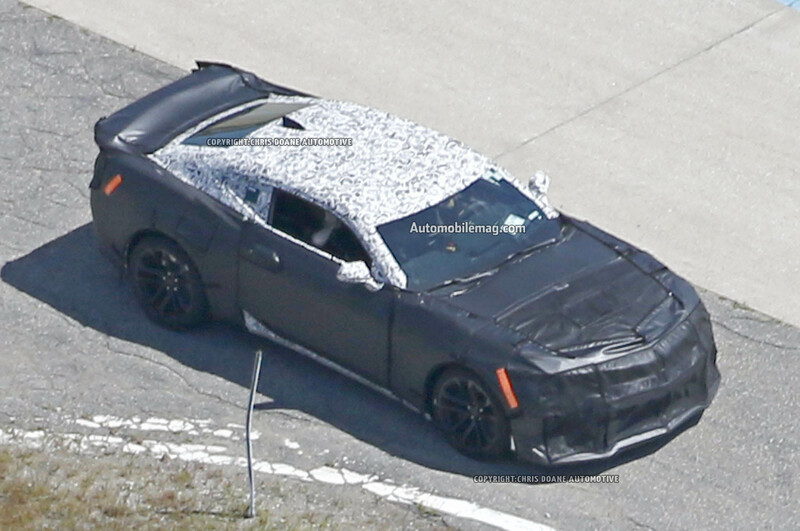 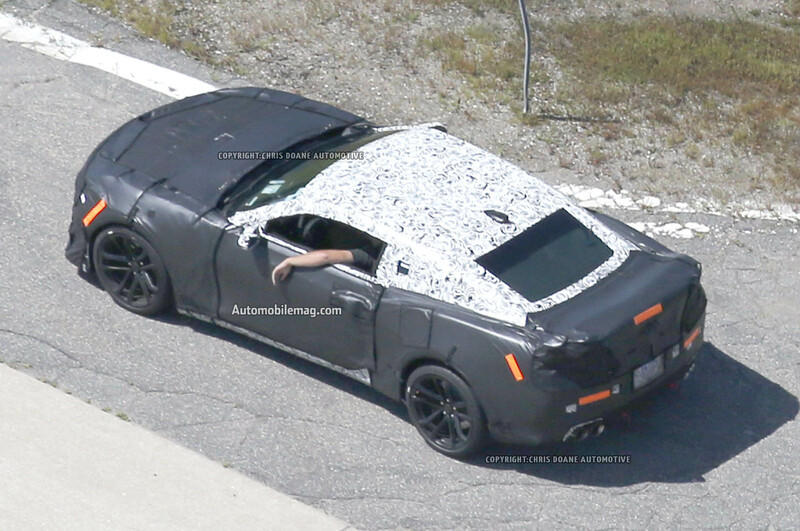 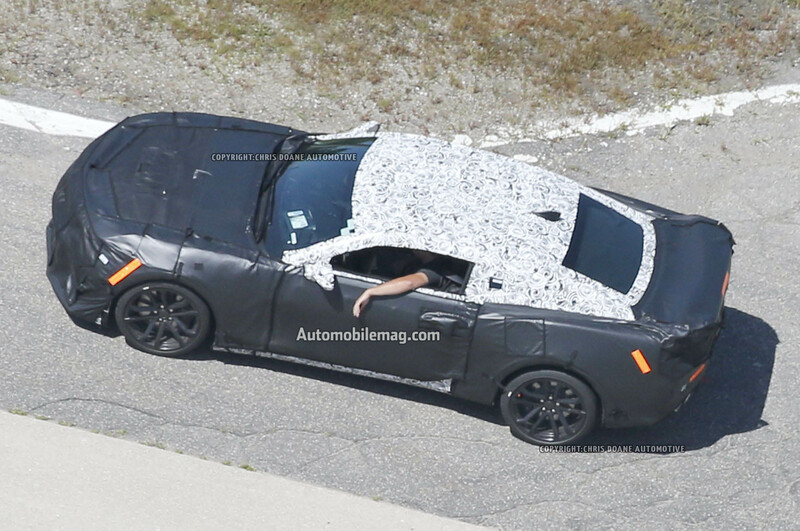 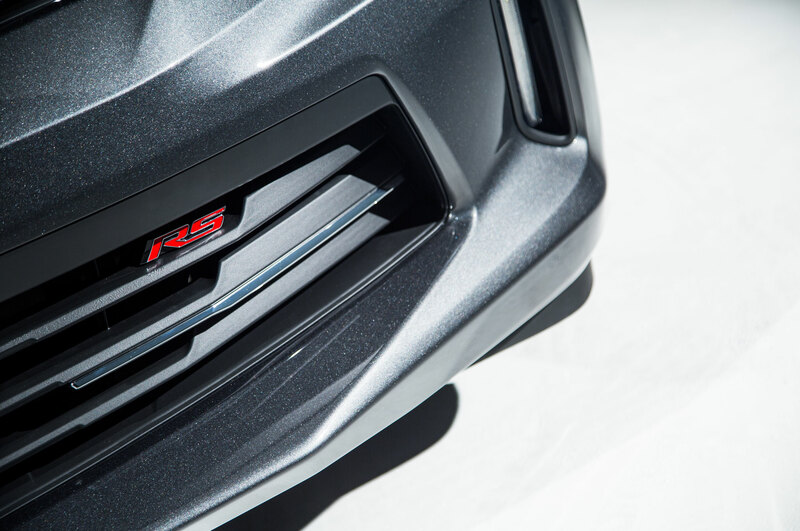 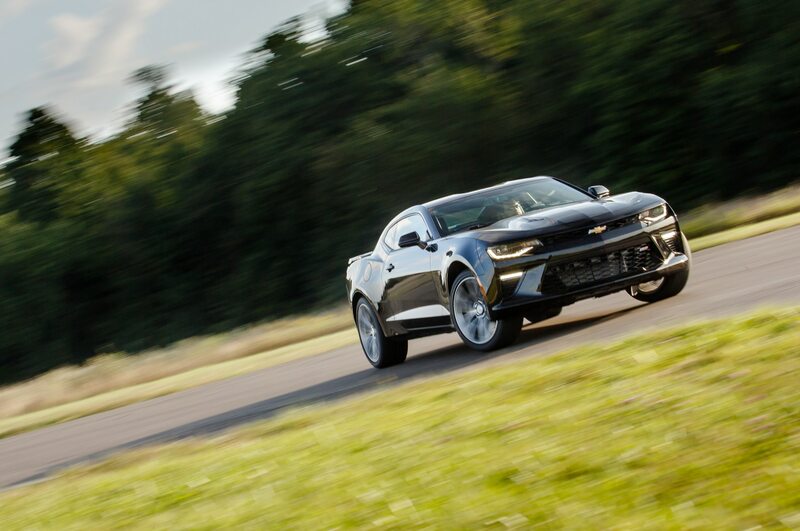 The 2016 Camaro is actually a brand new package under the skin, and we’re going to find out here on this 1.9-mile road circuit if the new car measures up. 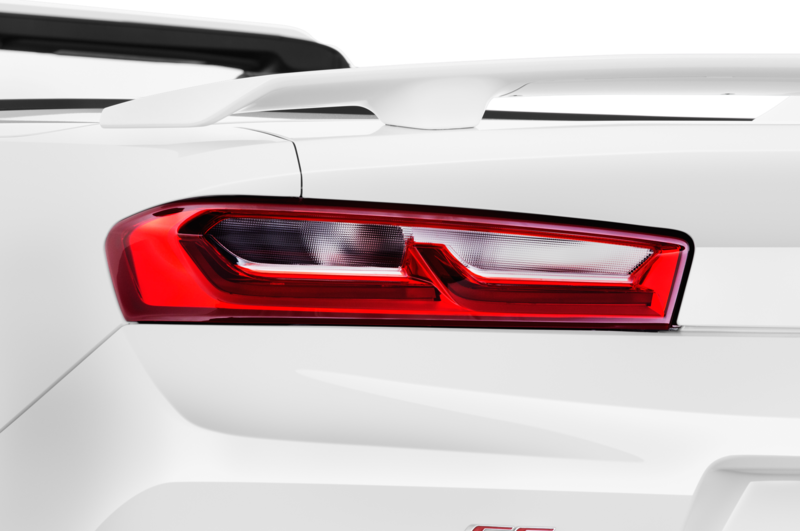 After all, this sixth-generation Camaro has some big shoes to fill. 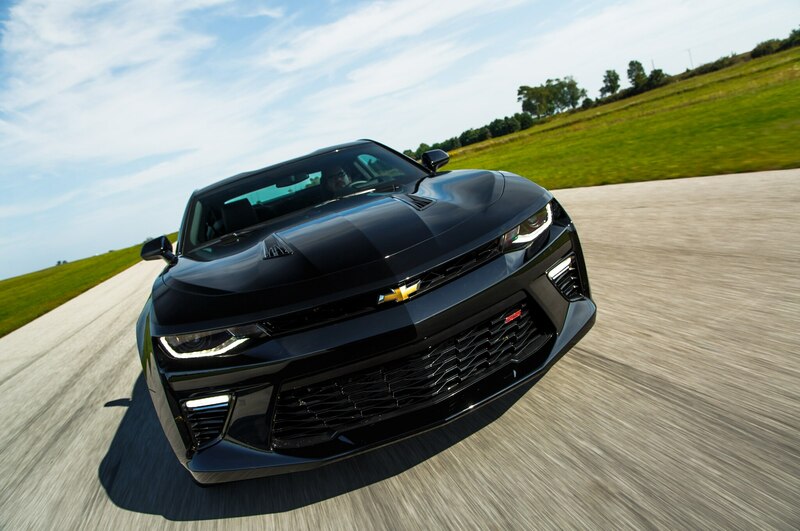 Chevrolet engineers worked hard to give the fifth-generation Camaro the same magic that the Camaro earned on the track back in the 1960s when it carried the racing colors of Roger Penske’s team, and the track-focused Camaro 1LE, supercharged Camaro ZL1, and race-ready Camaro Z/28 did the job. 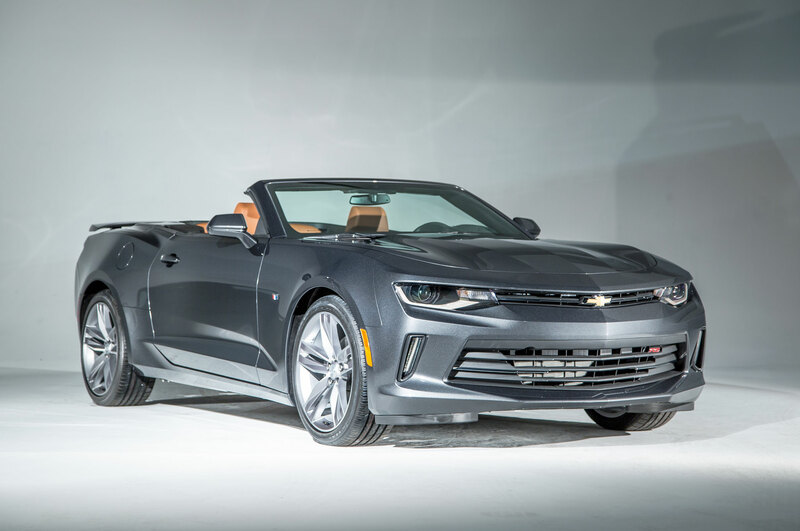 We’ll see if the 2016 Camaro SS is good enough to belong to the club. 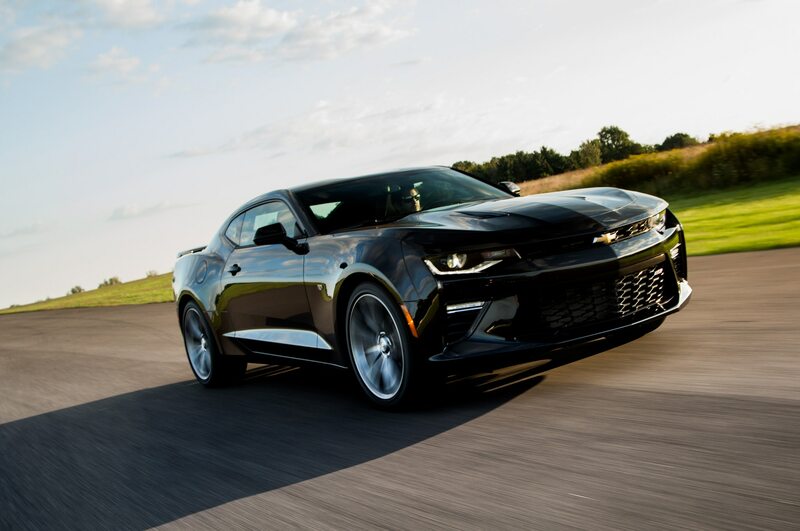 The 2010 Camaro made its mark with a version of the rear-wheel-drive chassis developed for the Australian-built Holden sedan, and just as you’d expect from something created in the Land Down Under, it was a real bruiser on the track, making its statement with a big motor and big tires. 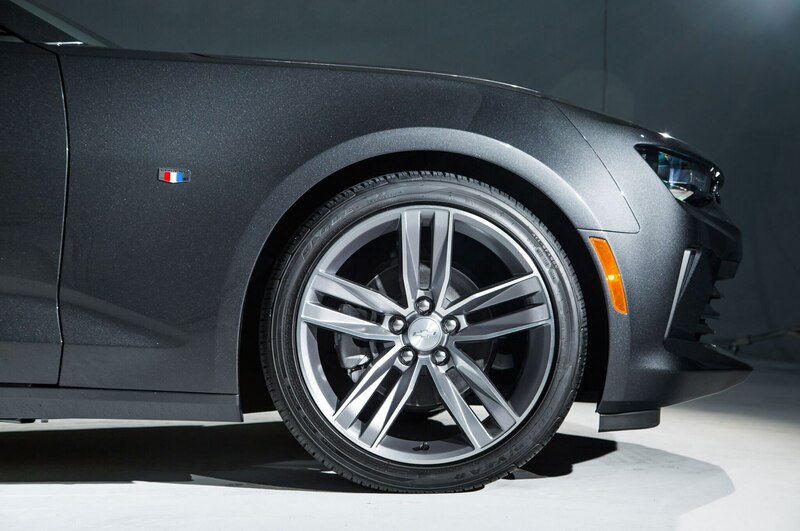 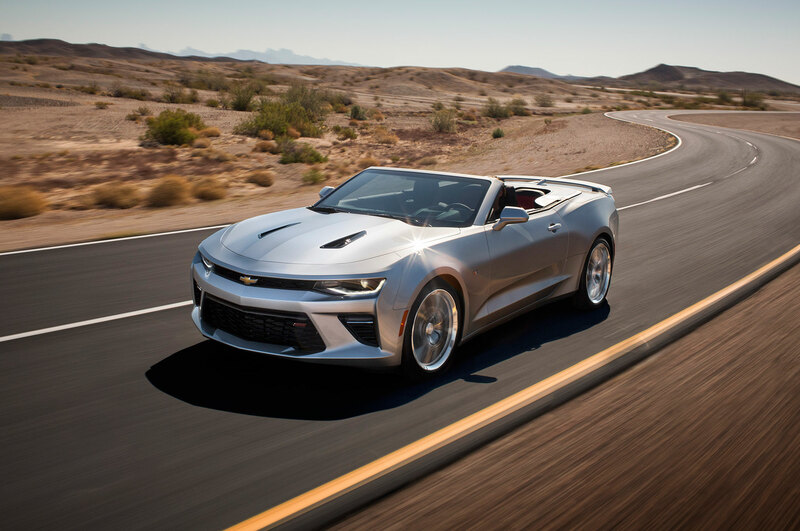 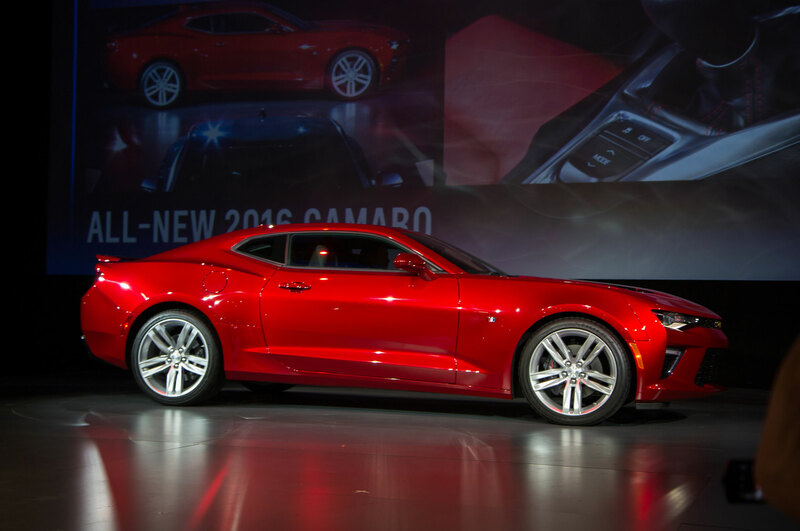 But now the 2016 Camaro has a new, more sophisticated chassis shared with the Cadillac ATS and CTS. 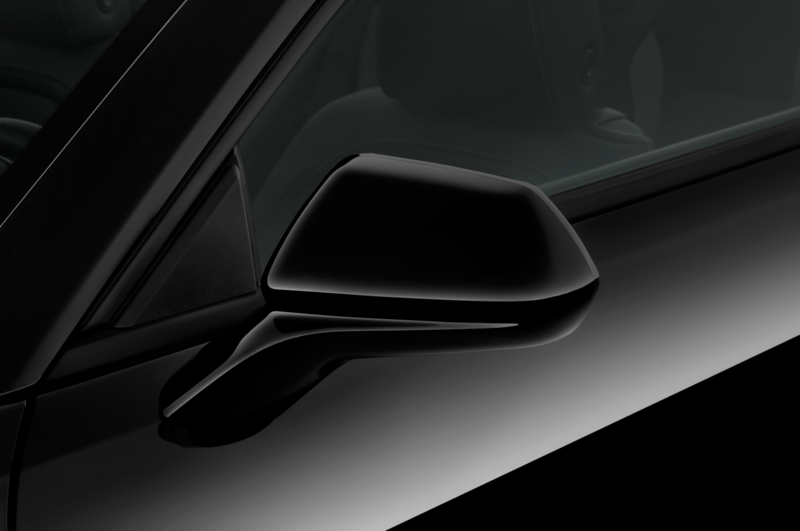 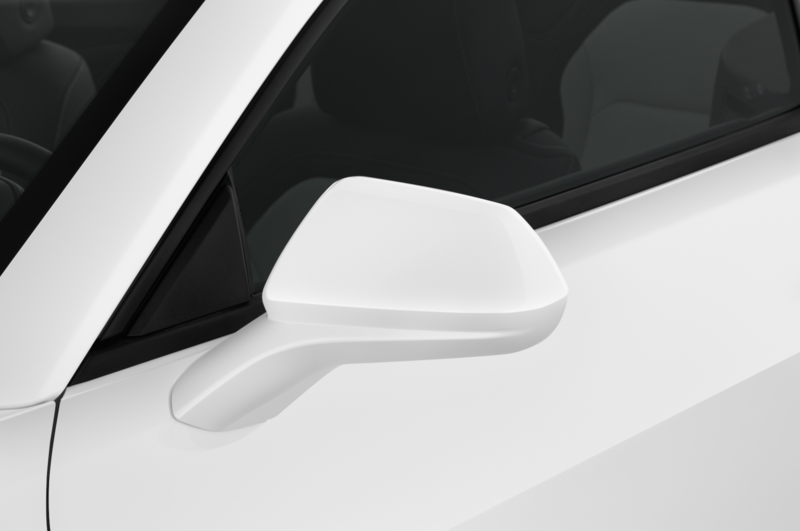 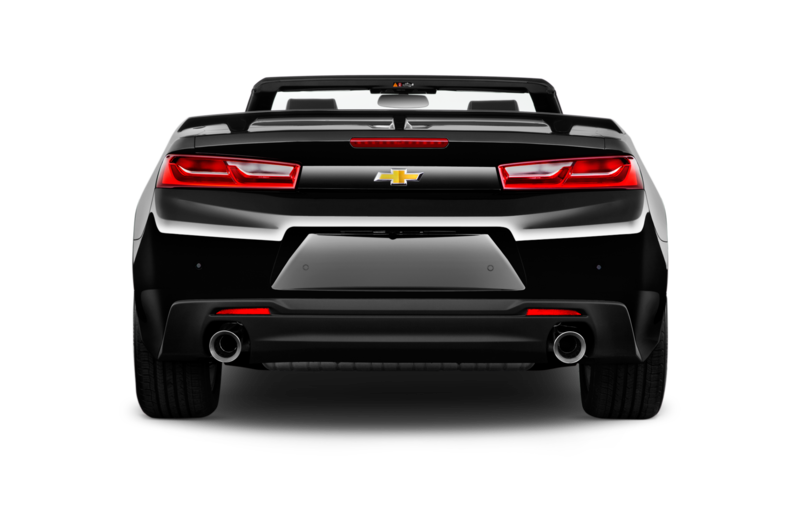 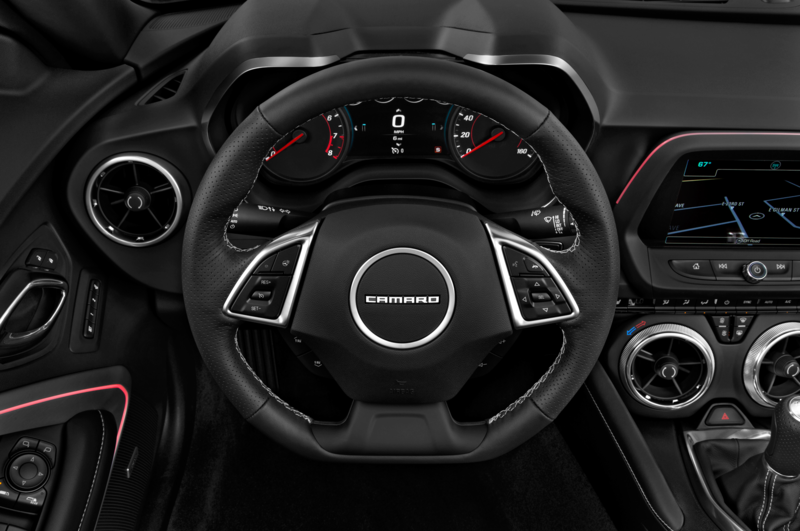 As a result, the new Camaro’s exterior dimensions shrink by 2.1 inches in overall length, 0.8 inches in width, and 1.1 inches in height, while the wheelbase shortens to 110.7 inches from 112.3 inches. 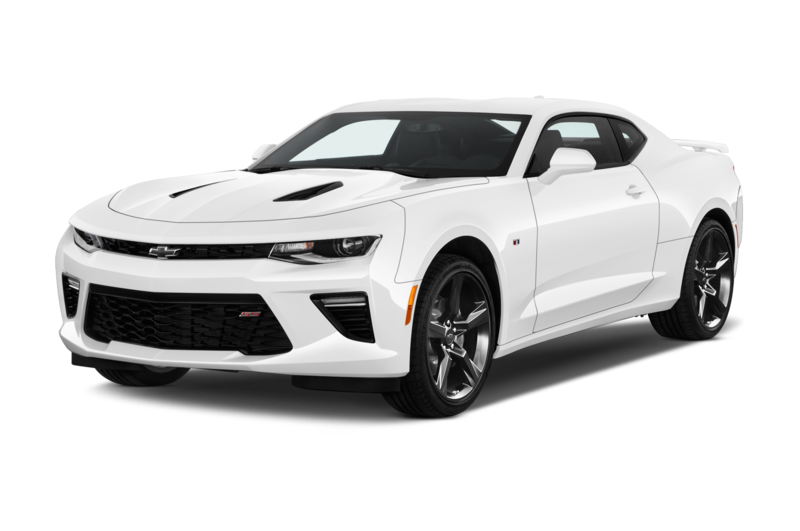 The Camaro SS with its V-8 engine also sheds 164 pounds compared to the former SS. 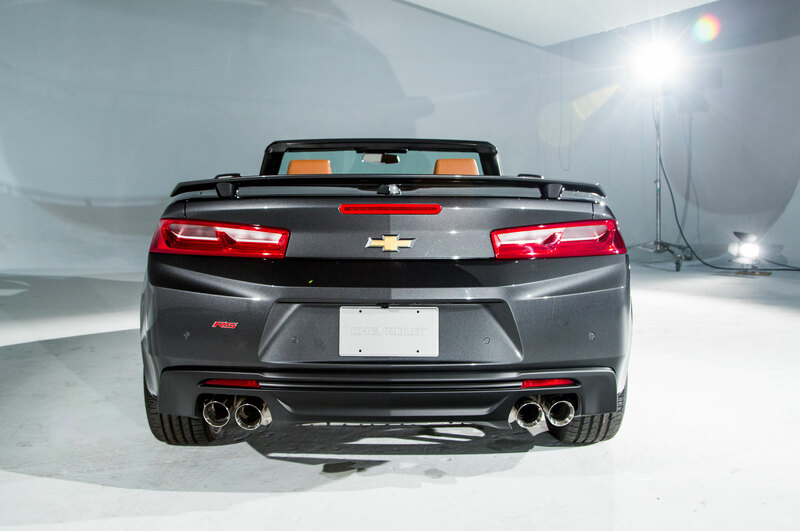 Meanwhile the new Alpha platform also brings the latest, fast-acting MagnaRide dampers as an option to the Camaro SS. 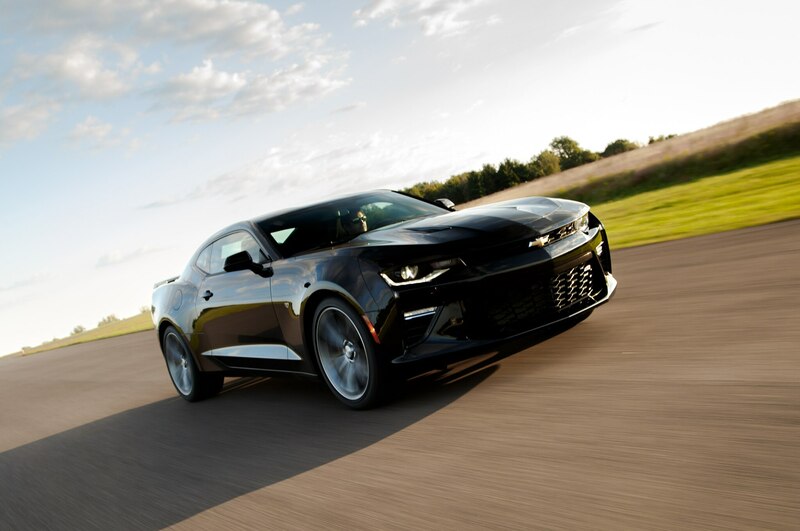 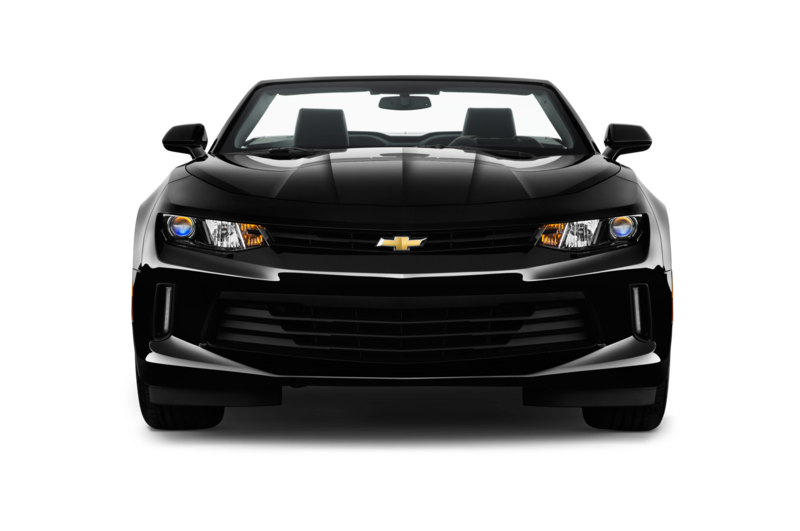 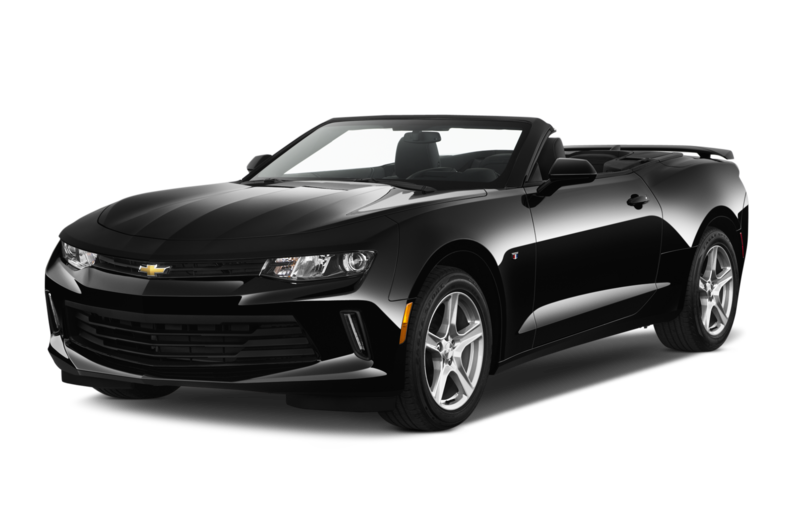 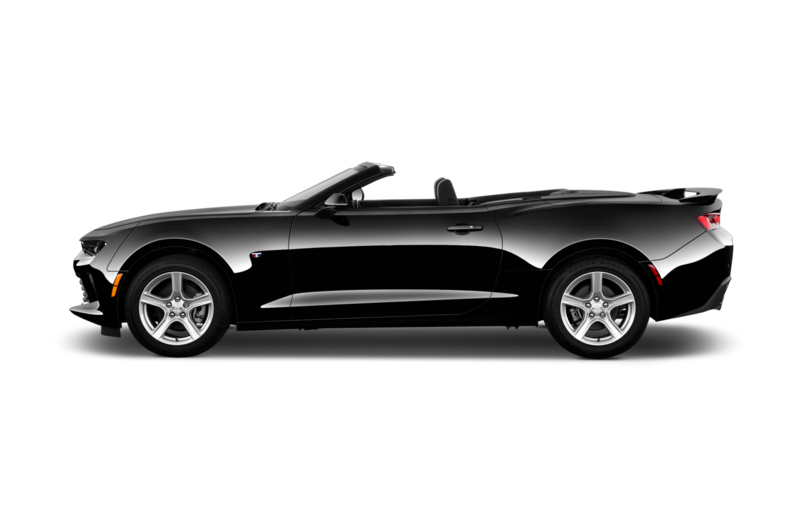 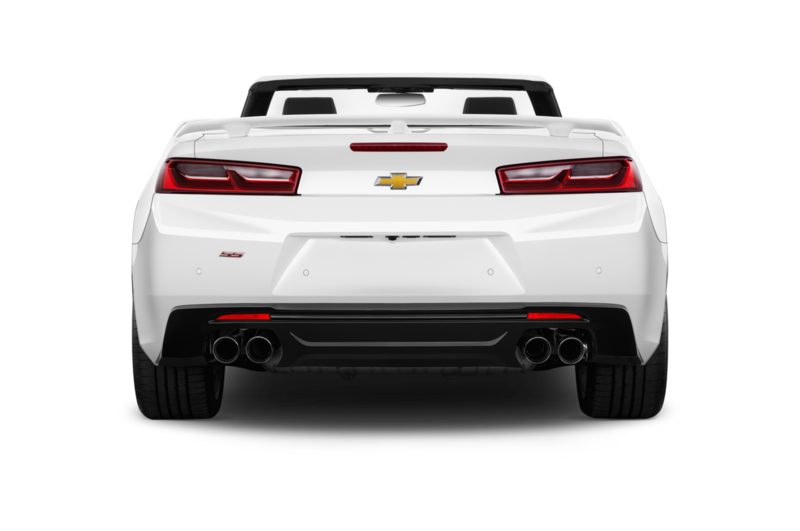 Even better, the Camaro SS carries the same LT1 V-8 that comes with the Chevrolet Corvette Stingray. 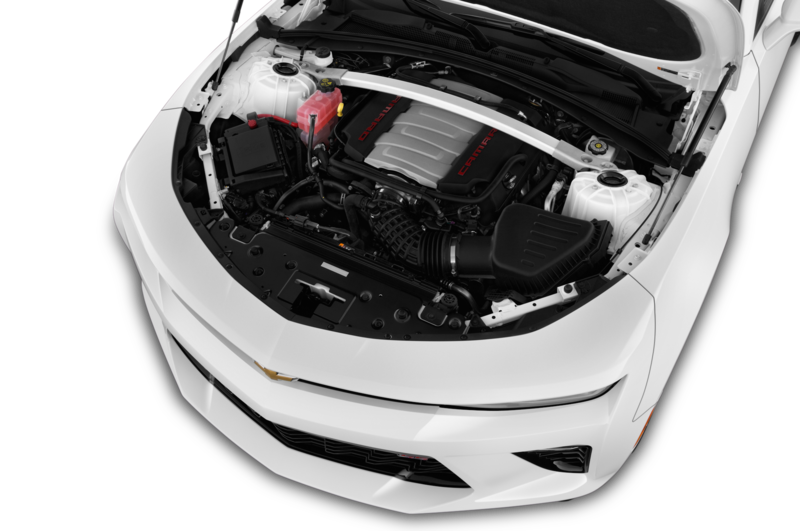 This engine with its direct fuel injection and variable valve timing produces 455 horsepower, some 29 hp more than the V-8 of last year’s Camaro SS. 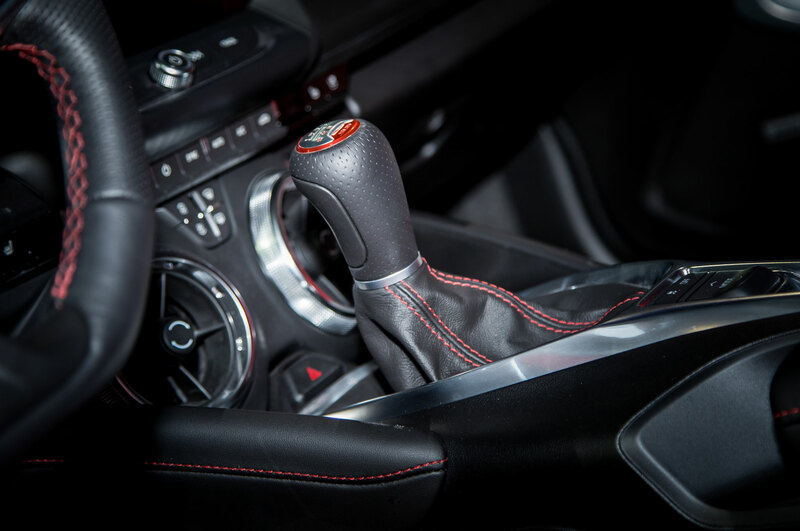 The ratio splits of the six-speed, Tremec TR6060 manual transmission give you a 1.00:1 ratio in fourth gear just as before, but now this transmission comes with automatic rev-matching for quicker, smoother downshifts. 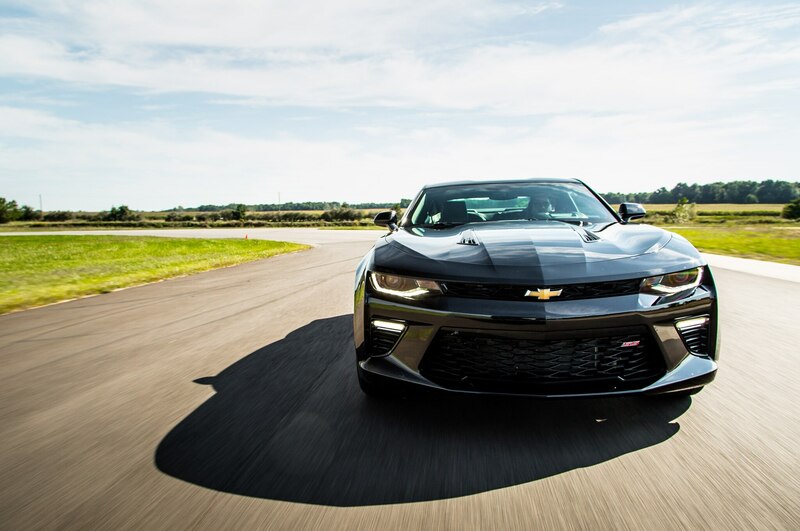 When you dial the SS’s four-mode chassis setting to the Track calibration, you get firmer damping and a higher effort level from the electric-assist steering, and this is certainly a good start to creating a worthwhile weapon on the track. 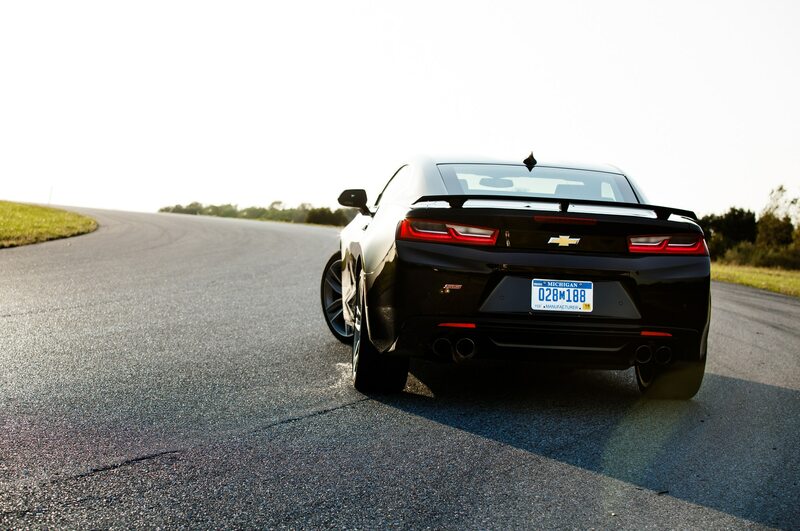 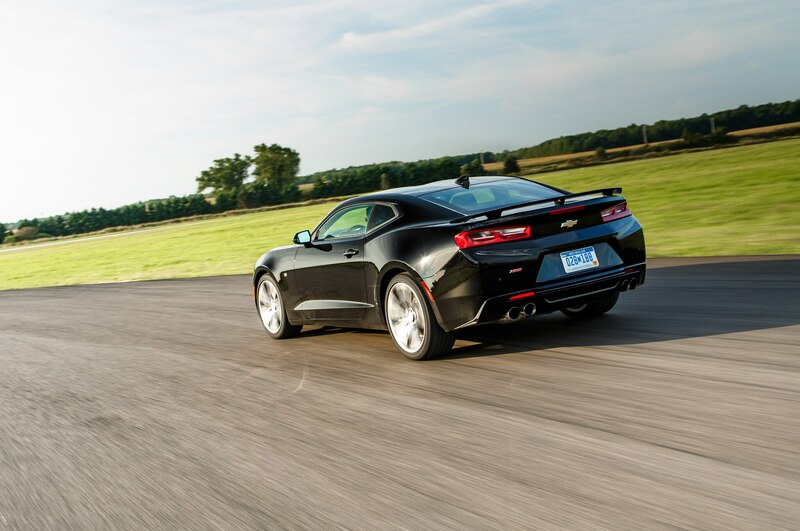 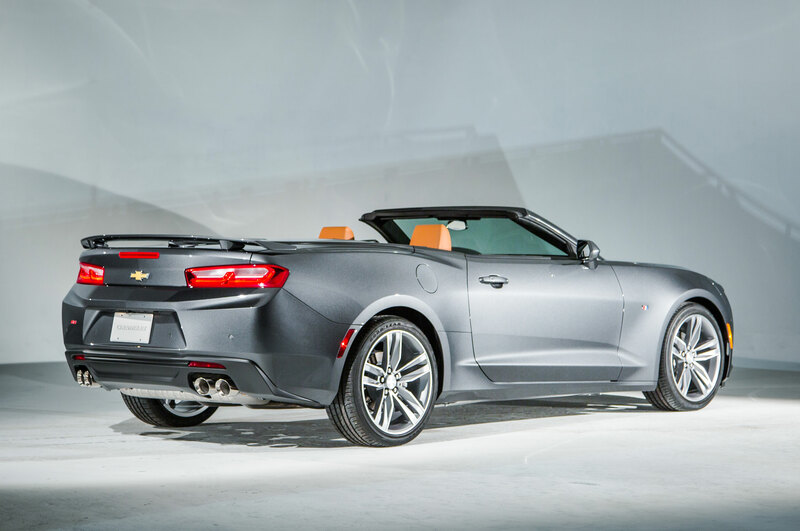 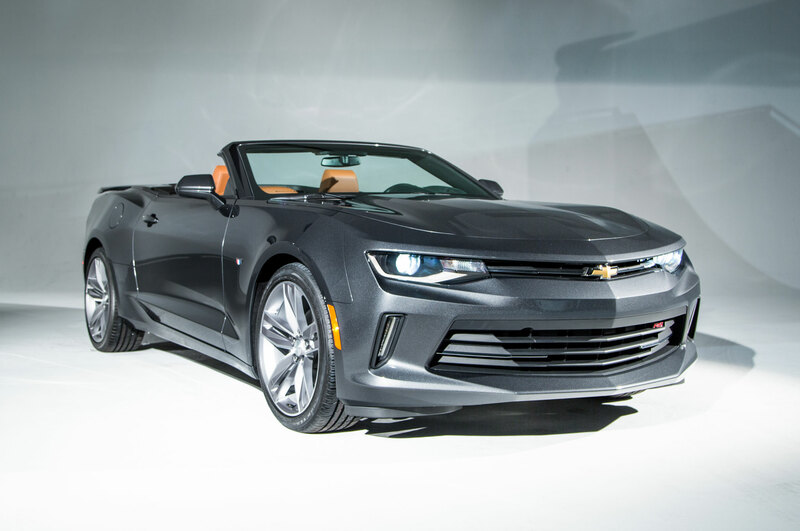 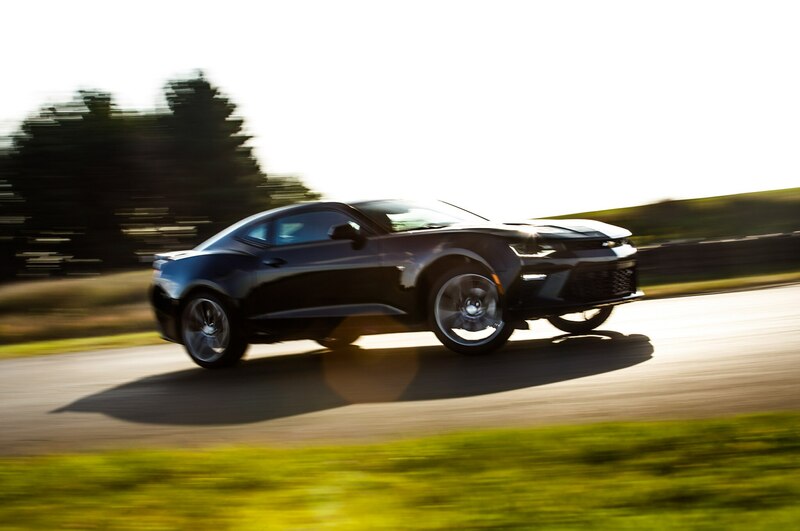 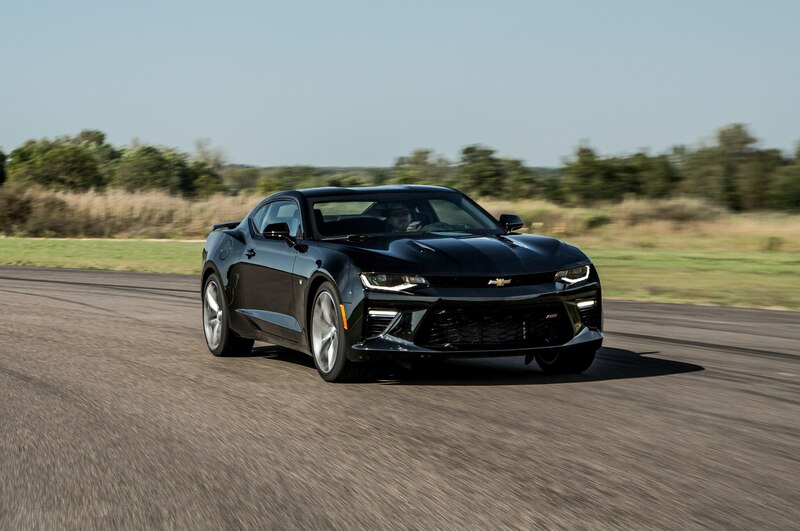 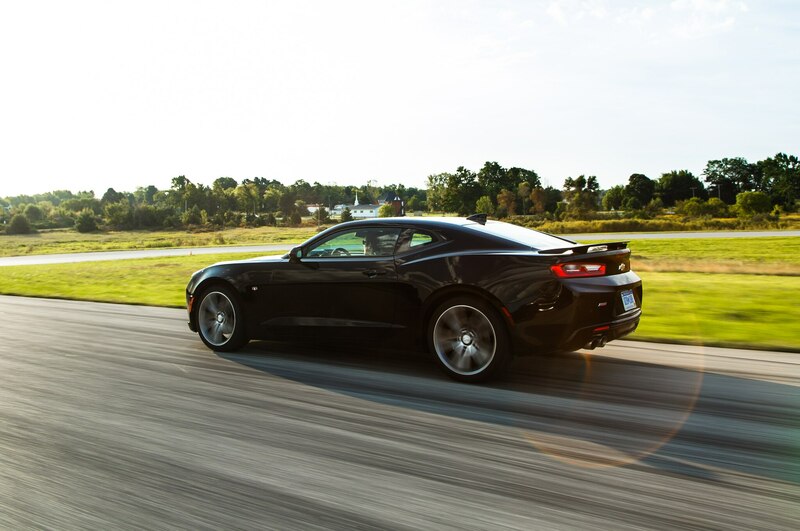 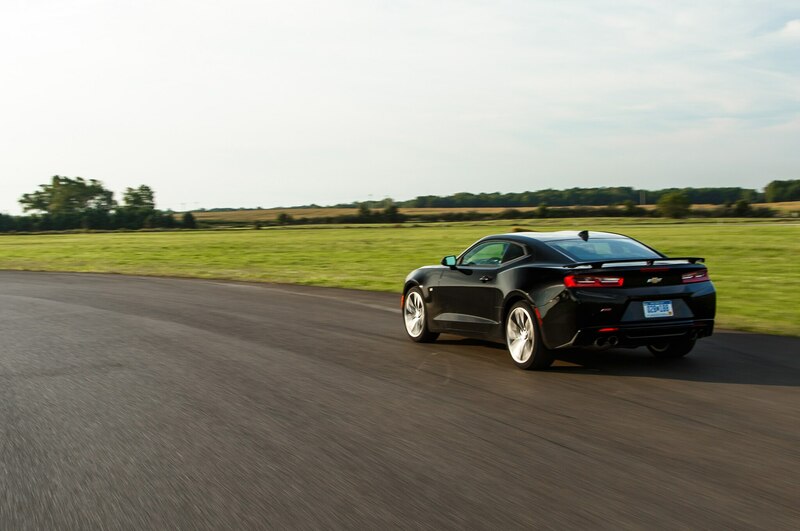 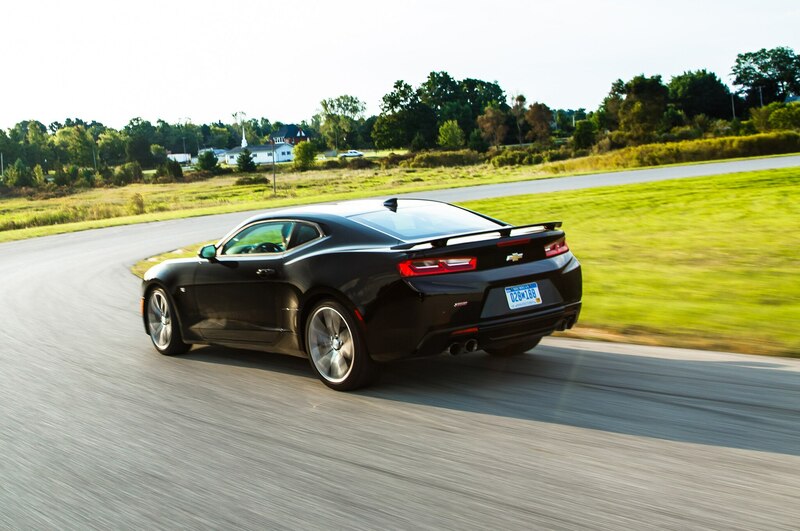 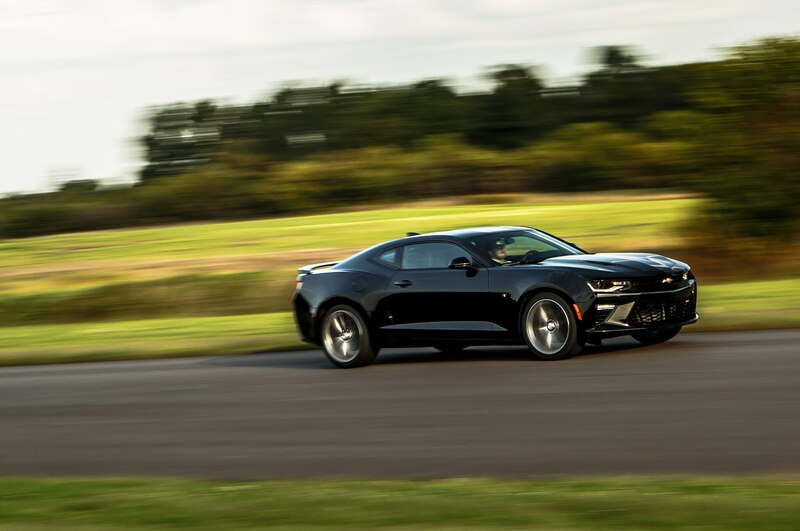 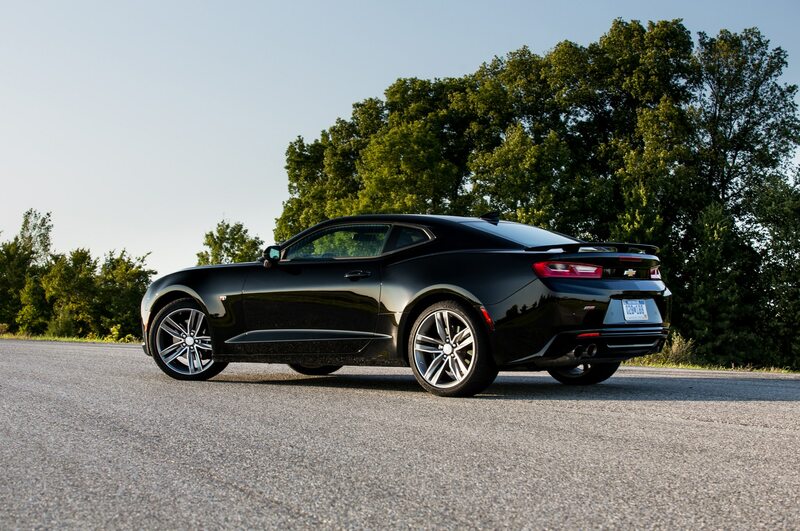 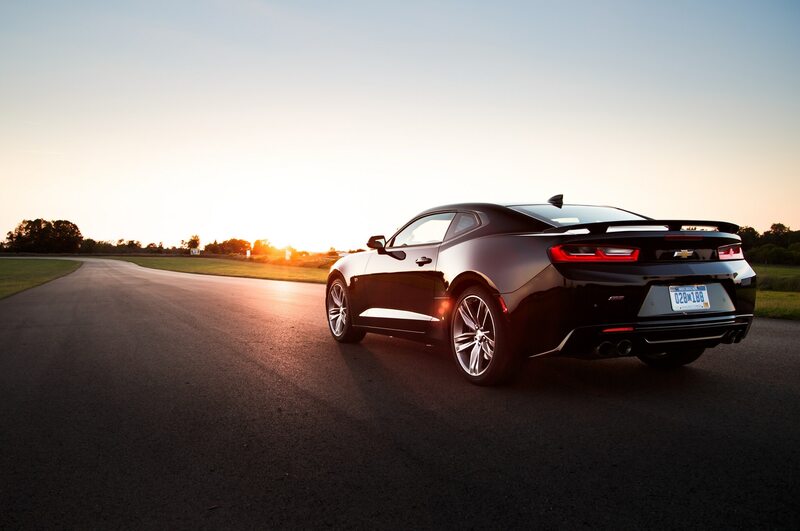 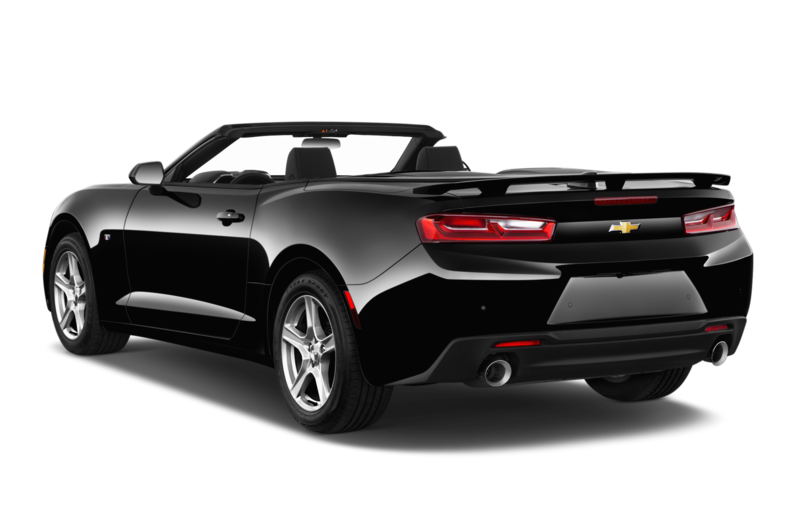 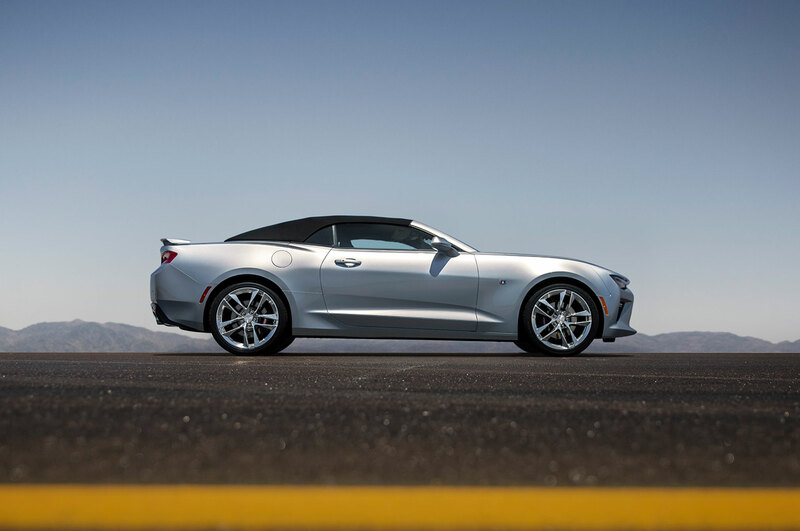 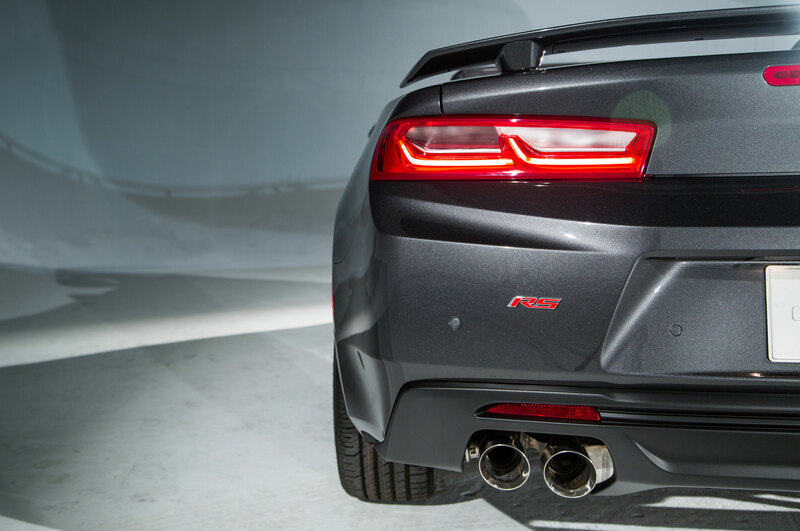 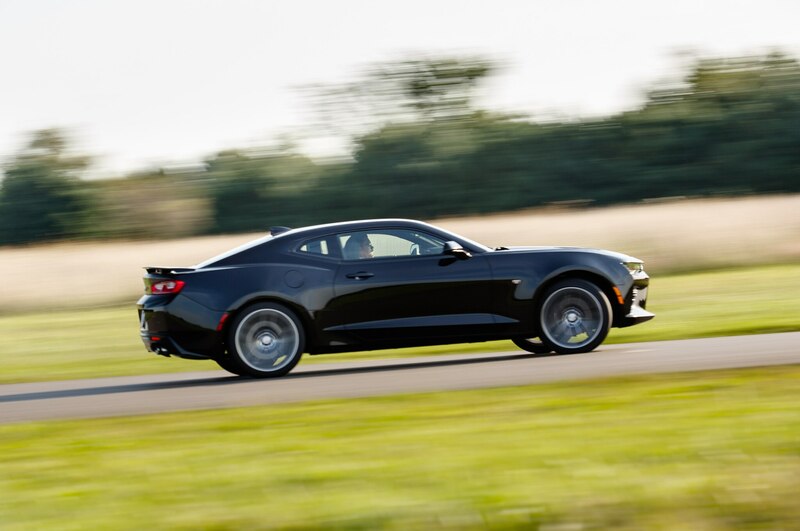 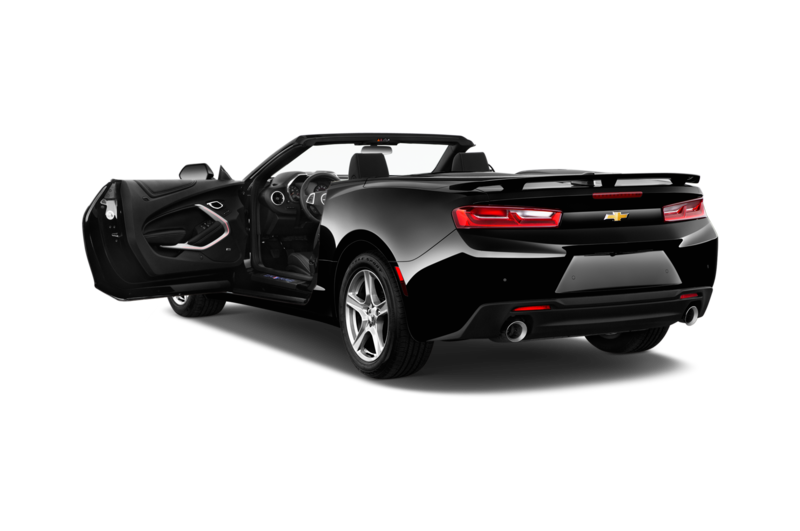 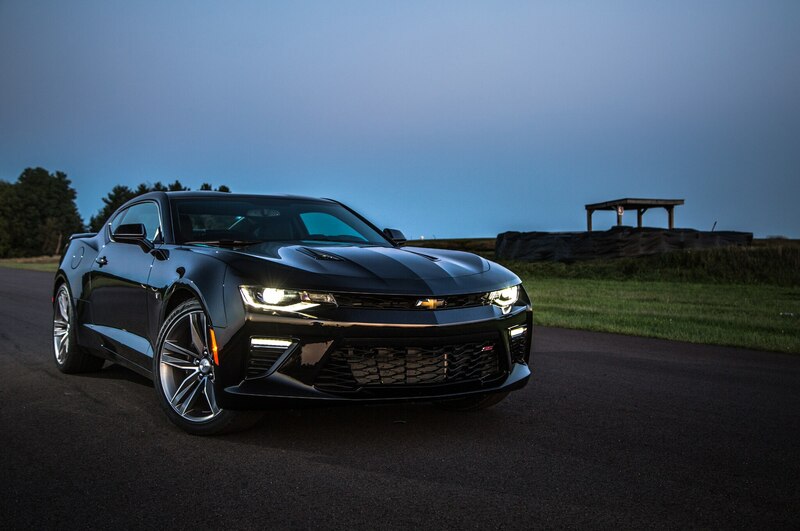 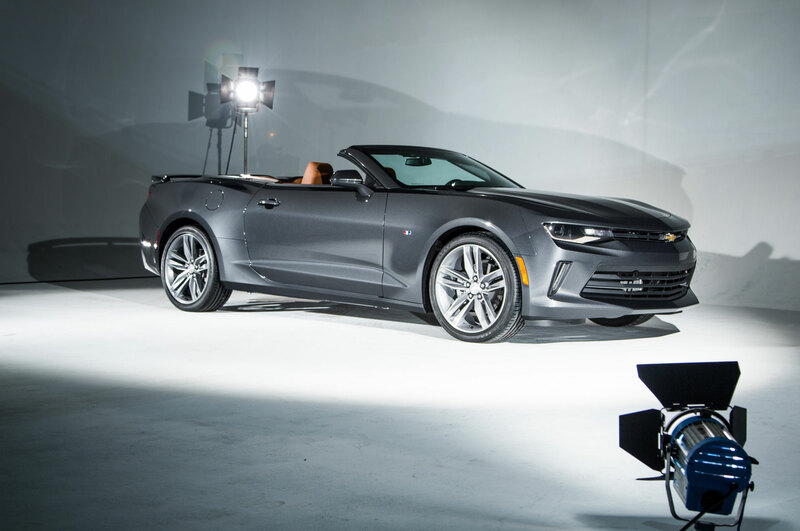 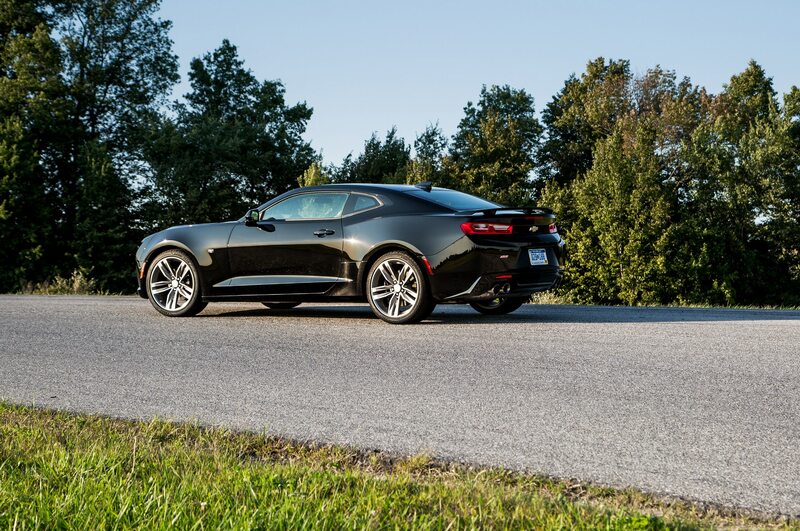 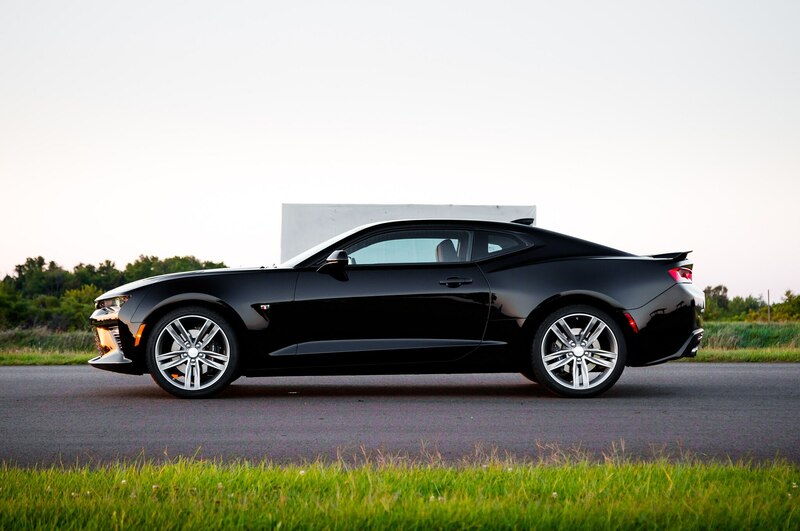 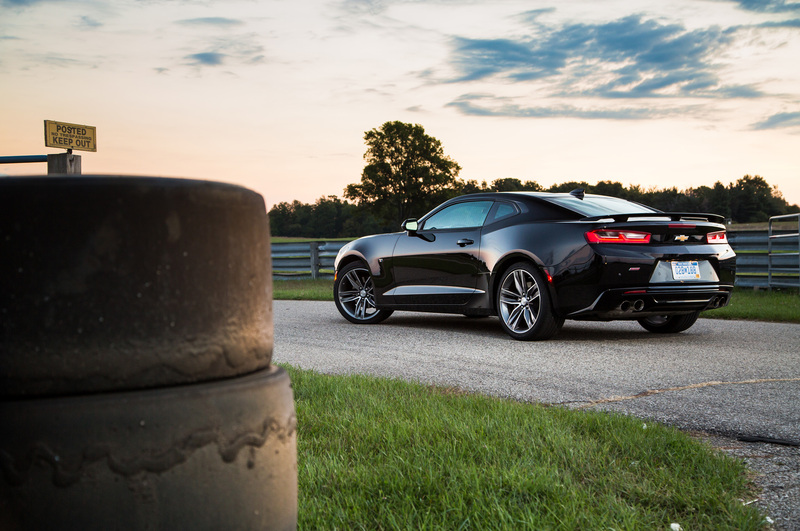 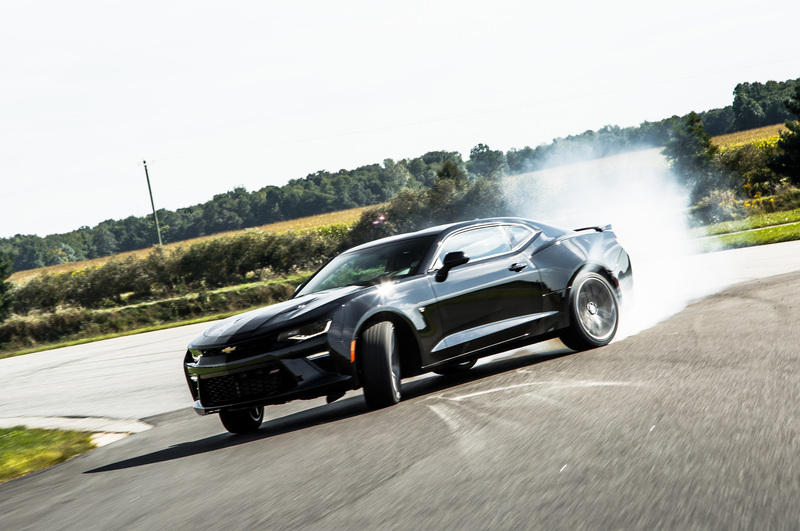 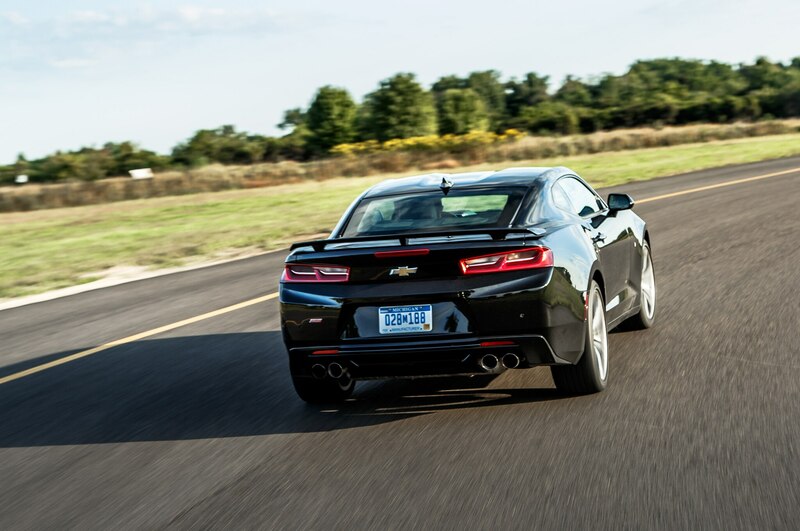 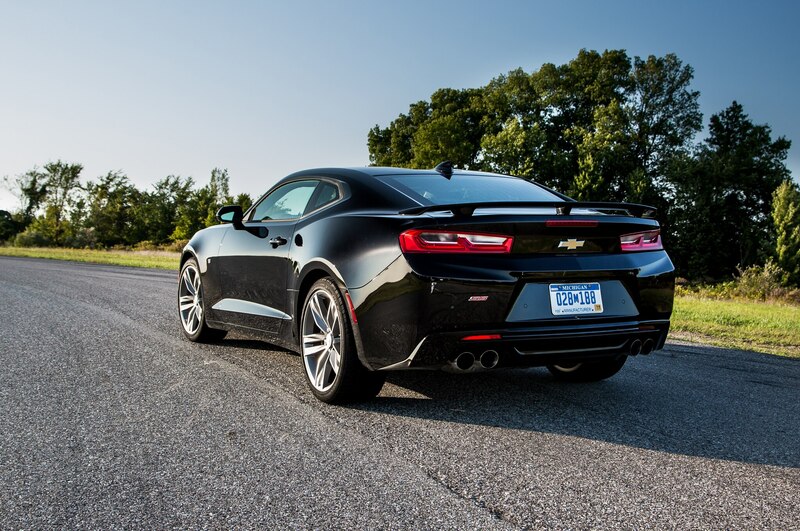 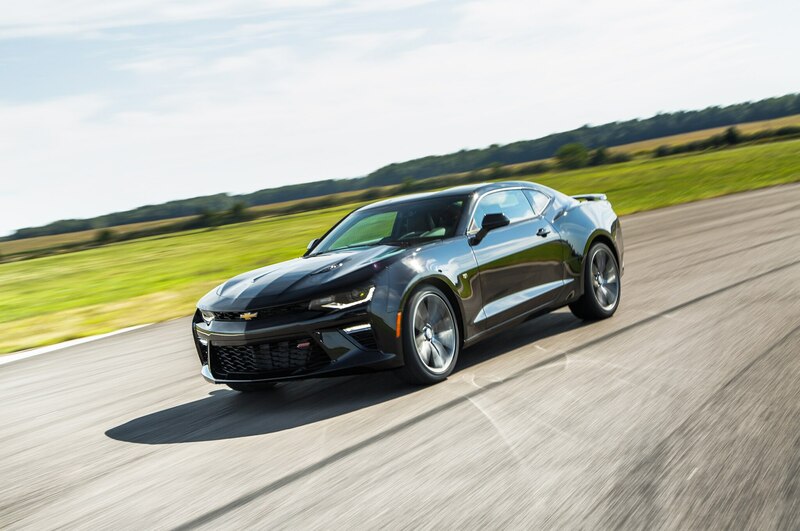 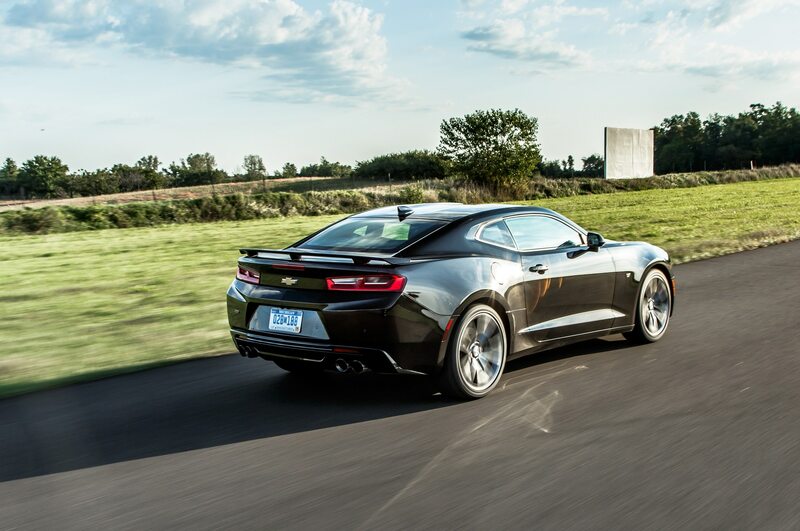 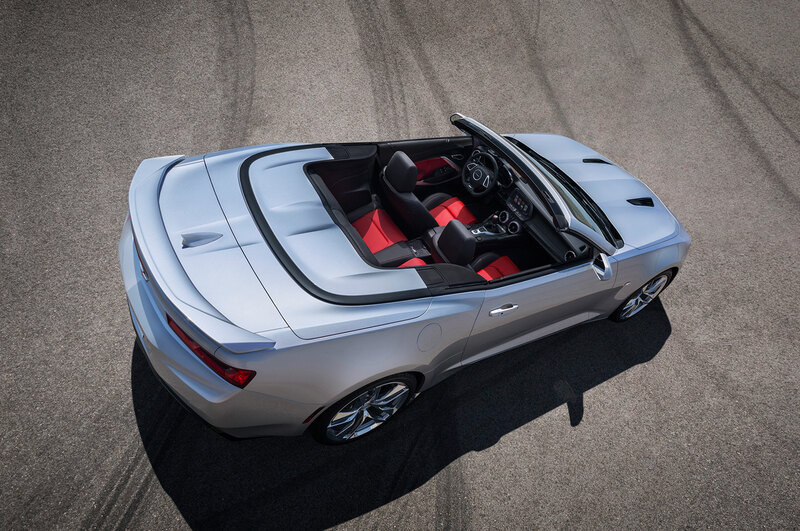 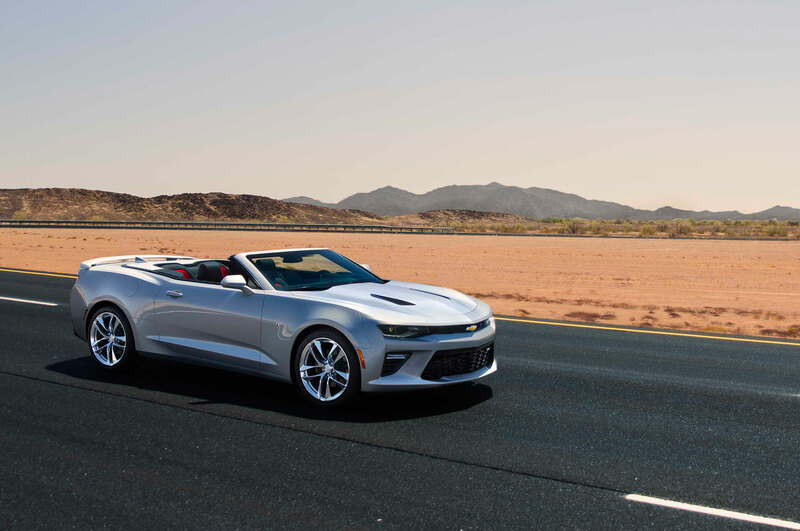 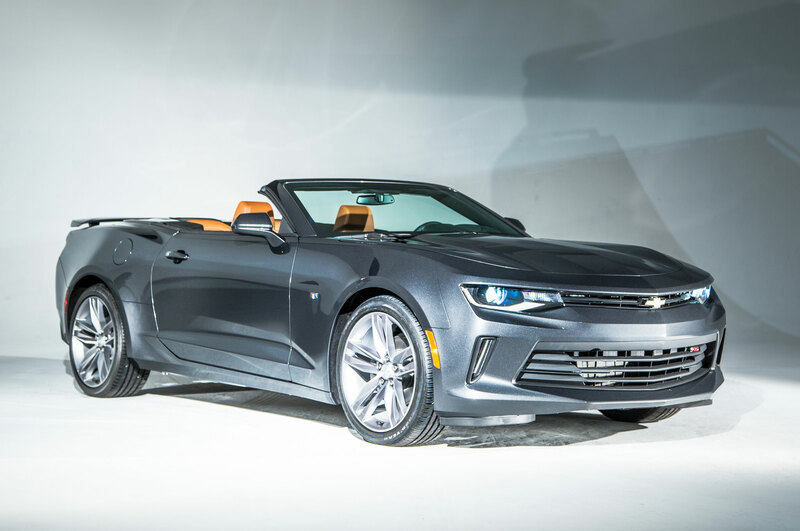 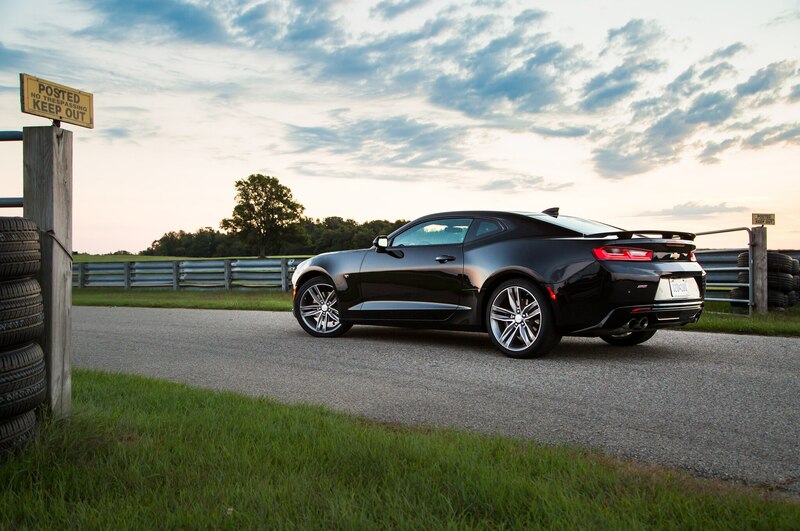 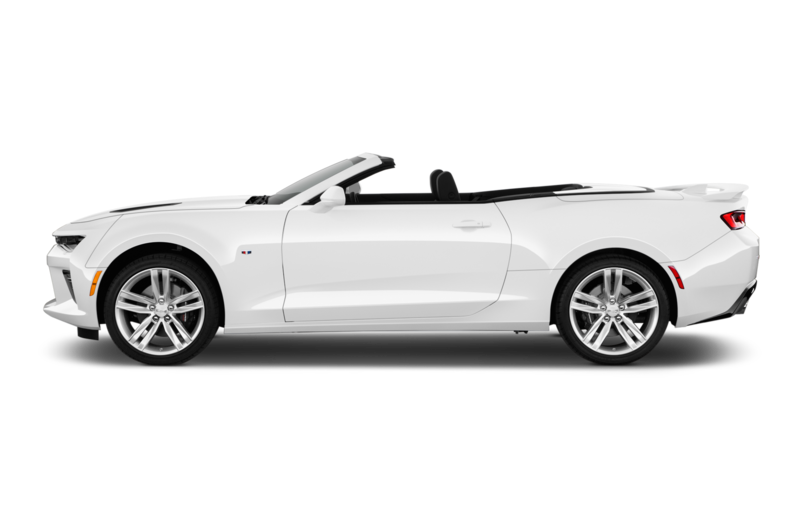 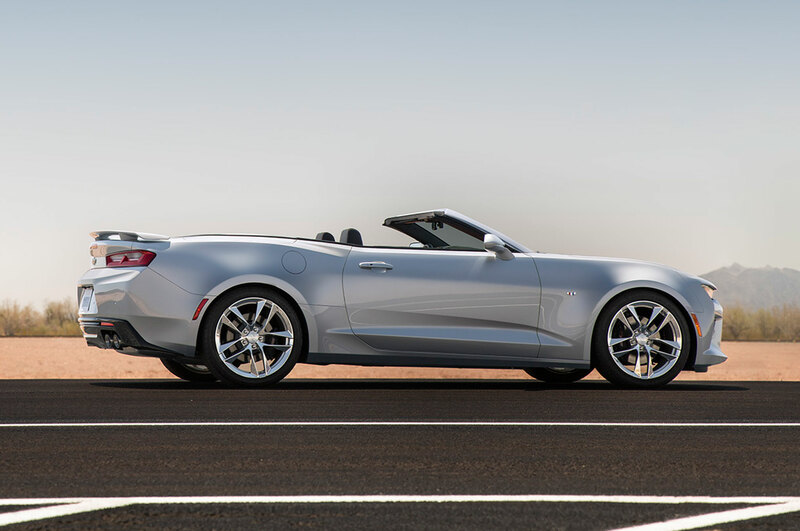 Track mode also quickens the LT1 V-8’s throttle response and lets the optional dual-mode exhaust system bark louder. 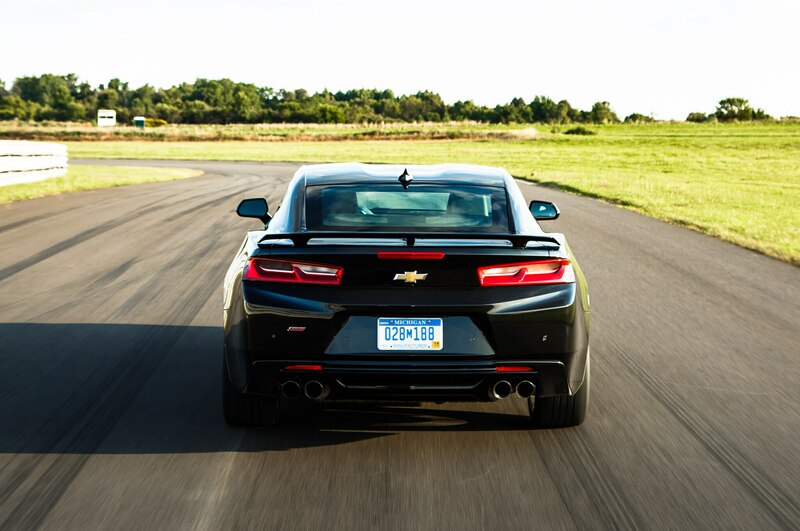 Since we think a ponycar is really about simple, pure fun, we fully disabled the stability control system during most of our time at Gingerman Raceway. 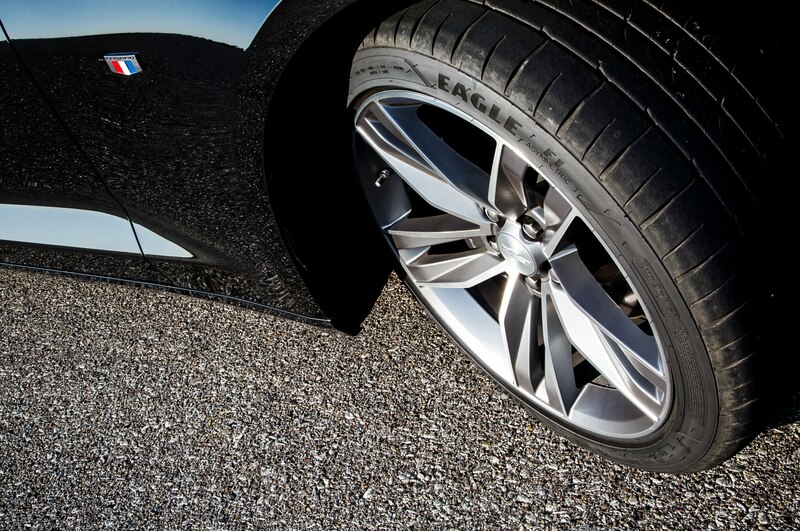 You would too, especially after seeing our accompanying video. 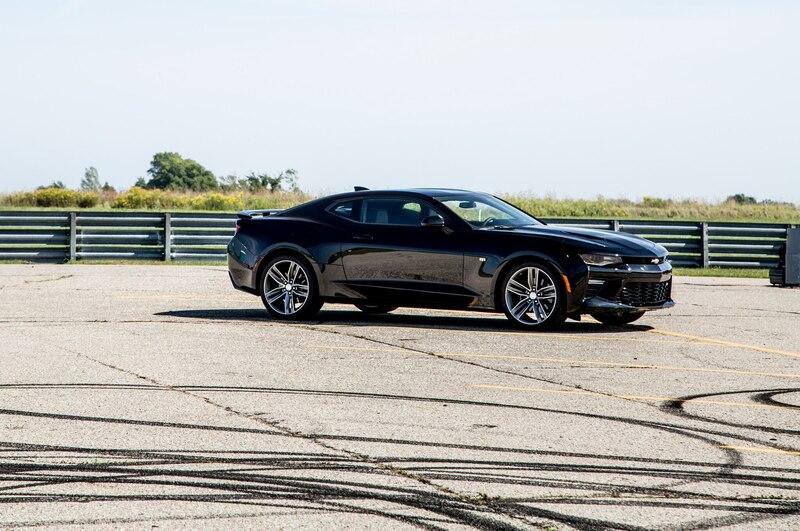 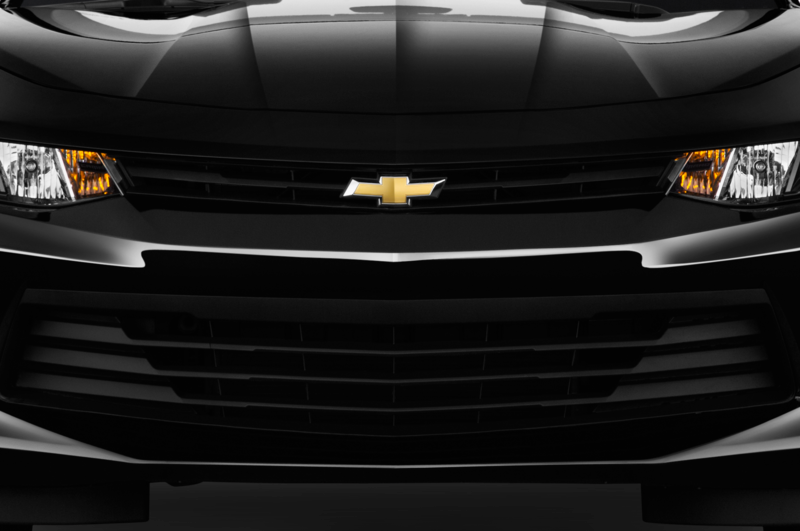 As always, the latest examples of stability control are far more permissive than such systems were a decade ago, plus the intervention is far from abrupt, but we appreciate that the Chevy engineers are willing to let us make our own decisions on the track. 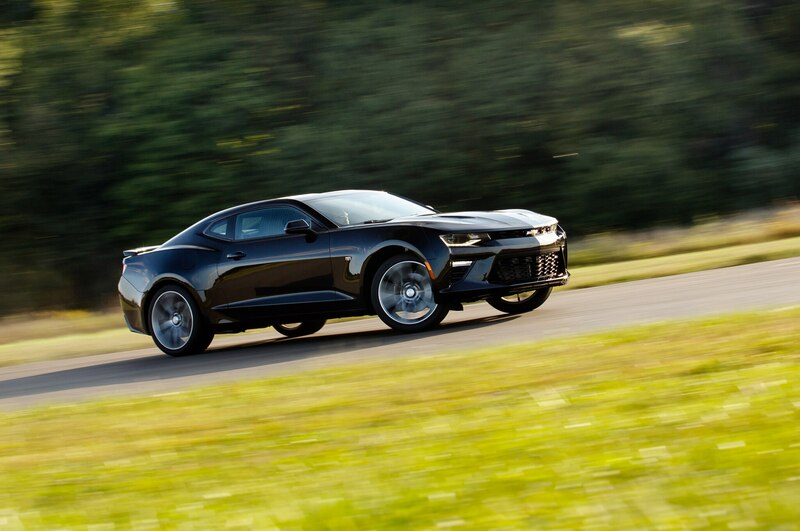 That’s not to say the Camaro SS is a proper track car in the way you’d expect from a Camaro Z/28. 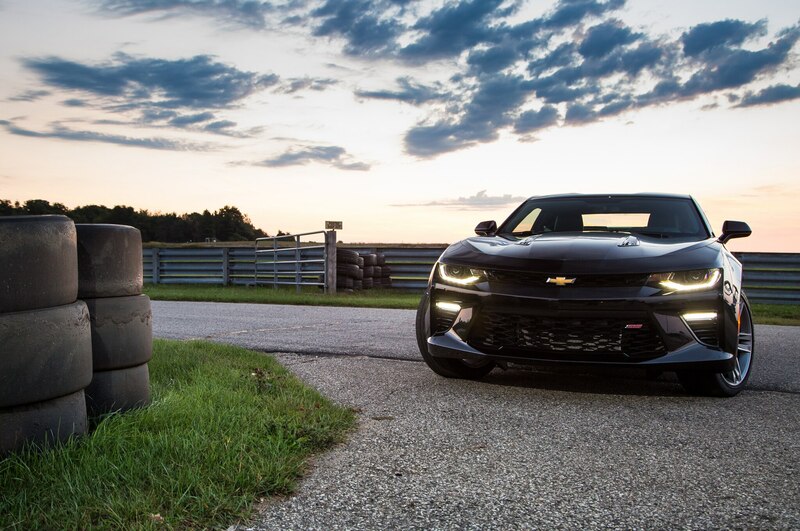 It’s certainly more than capable of some grin-inducing activities, but it’s still a rather hefty car at 3,685 pounds, and we expect that the options loaded into our test car made this SS even heavier. 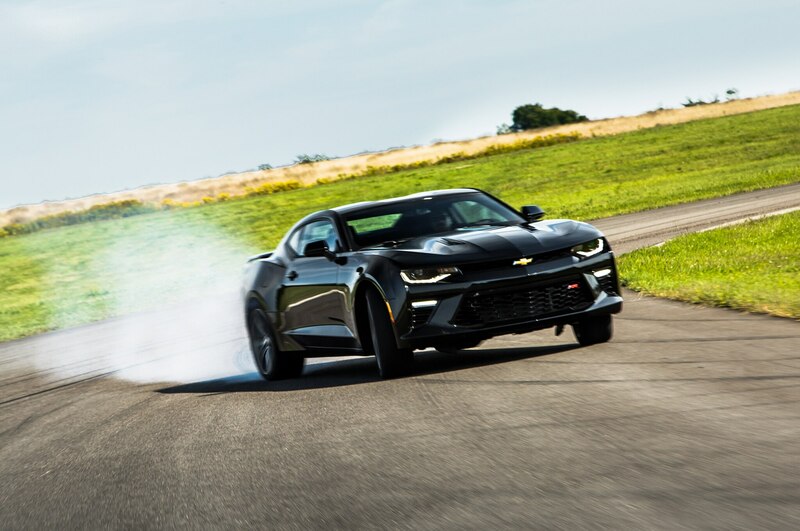 Though it’s a club-style track, Gingerman mixes the fiddly low-speed corners that you’d expect with some legitimate high-speed corners. 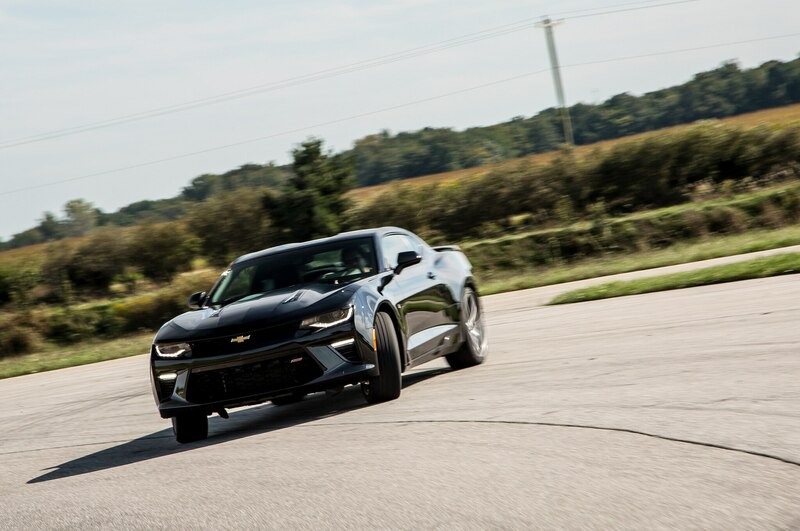 MagnaRide dampers or not, the Camaro SS struggles for traction in low-speed corners, and we battled some understeer in higher-speed corners. 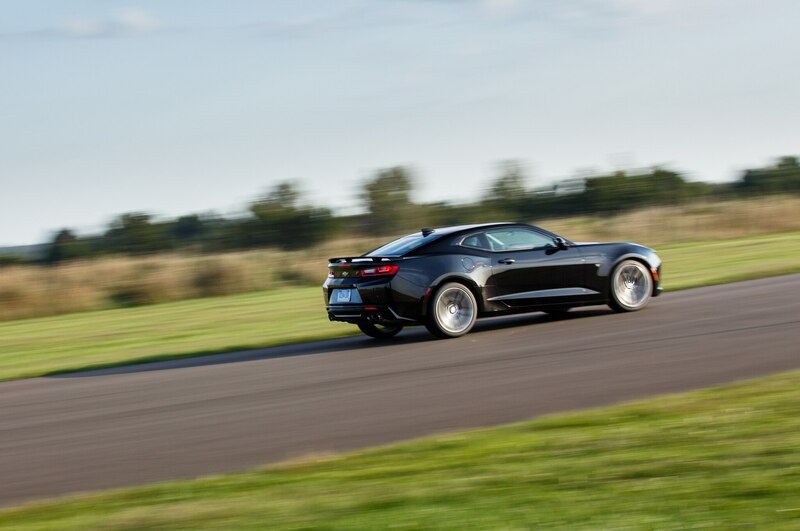 Even so, the shortage of cornering stick from the five-link, independent rear suspension means you use a gentle prod of the throttle can counter the car’s tendency to run wide in high-speed corners, initiating a little oversteer to better balance the car. 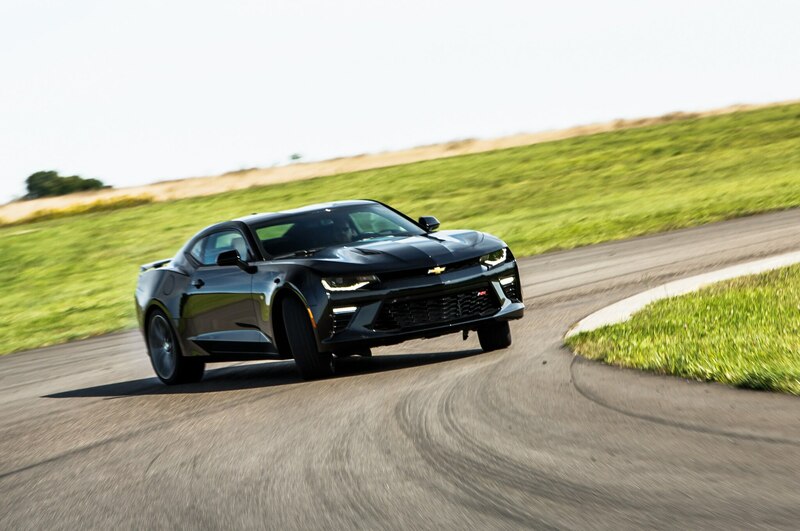 We were able get the Camaro SS to do this pretty predictably in third gear for 100-mph corners. 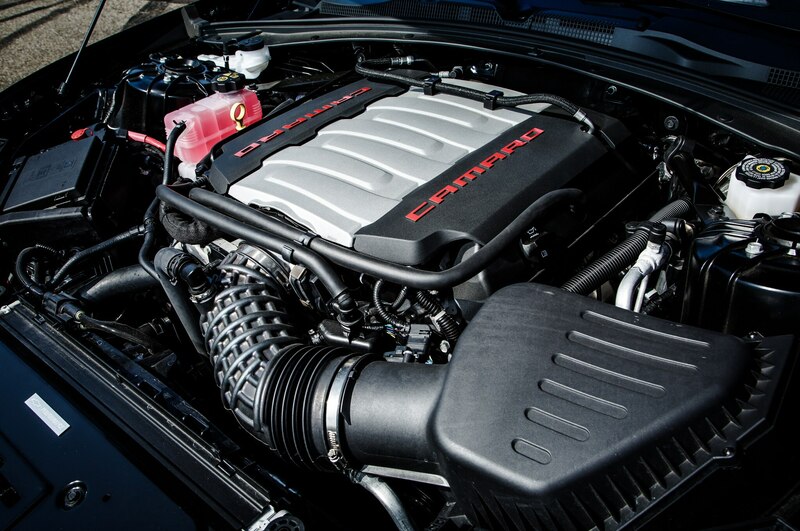 The direct-injection V-8 makes gobs of power. 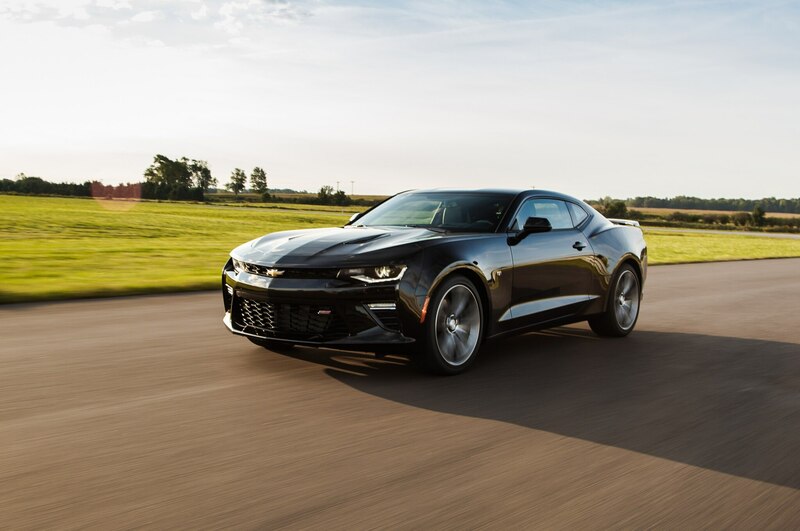 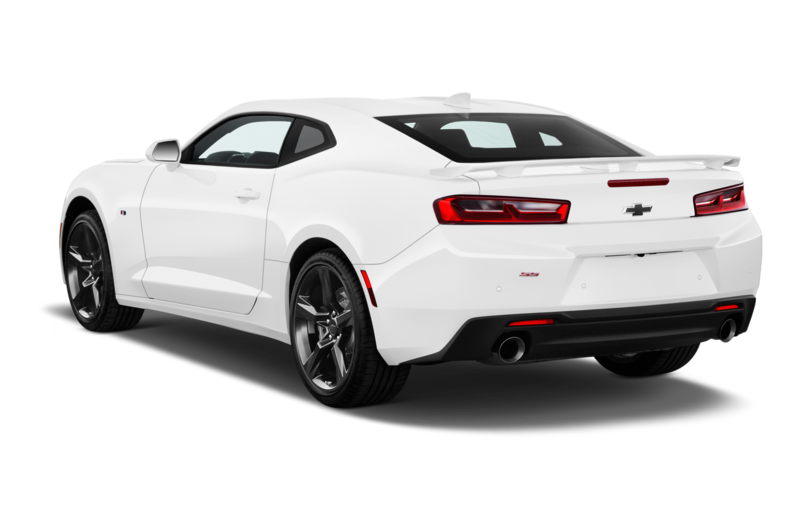 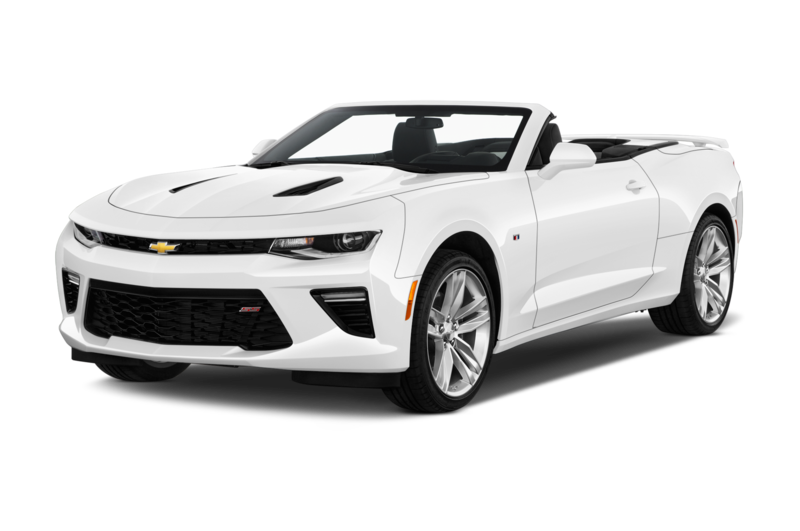 It’s a great fit for the character of the SS, even if the Chevy engine is missing the last burst of power at the top of the rpm range that’s delivered by the Mustang GT’s 435-hp Ford V-8 with its 7,000-rpm redline. 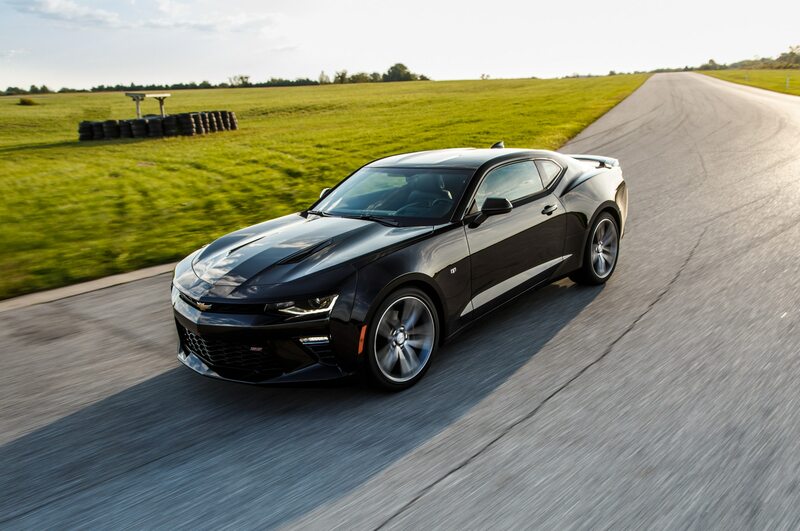 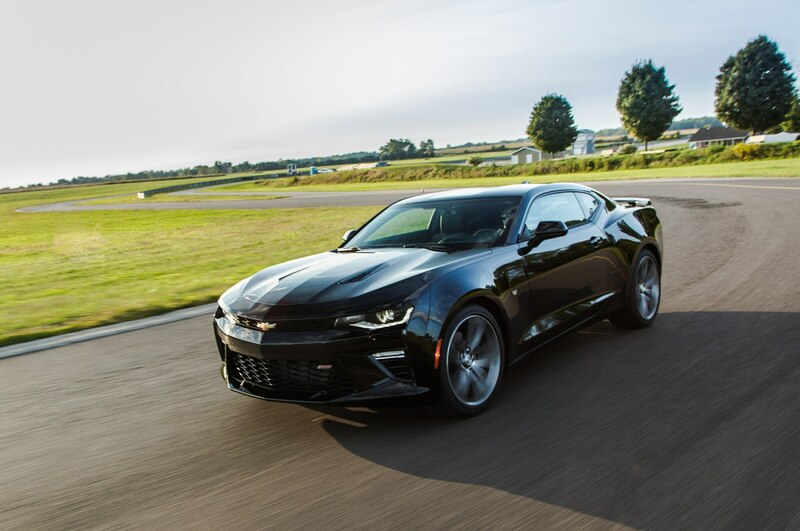 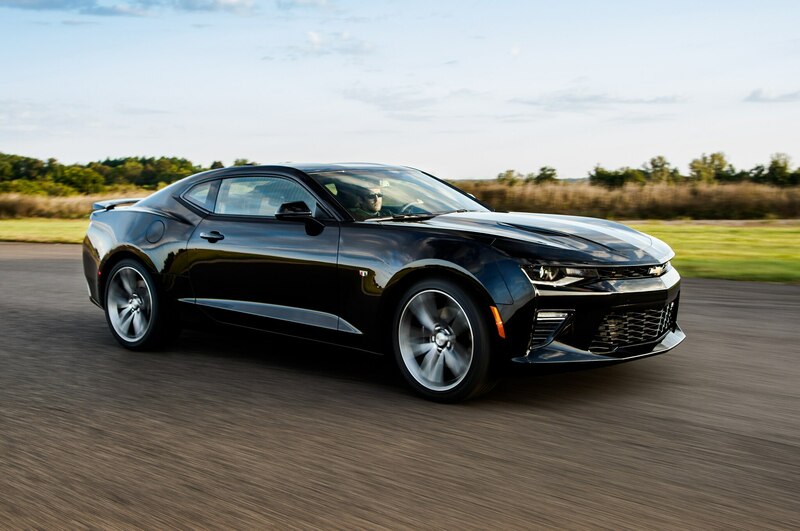 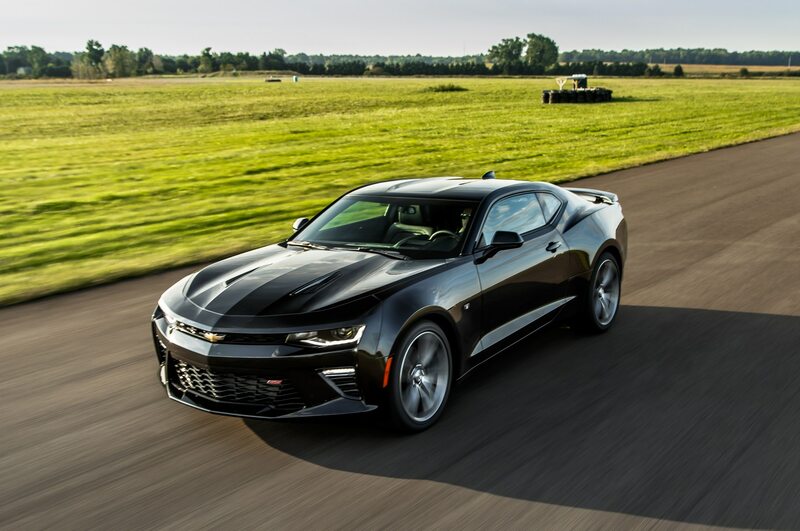 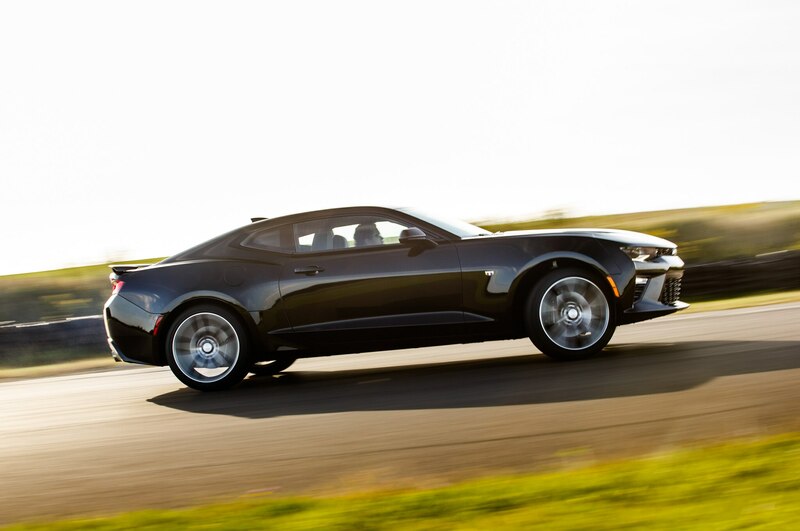 The 6.2-liter OHV V-8 in the Camaro doesn’t pull very hard past 6,000 rpm, yet it does carry a substantial advantage of 55 lb-ft of torque more than the 5.0-liter DOHC Ford. 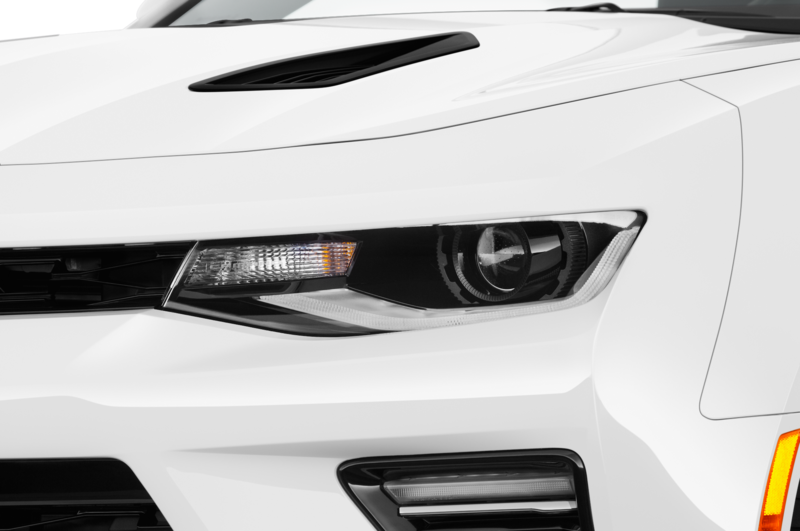 The added low-end grunt will surely be even more useful on the street, where most Camaro SS owners drive their cars. 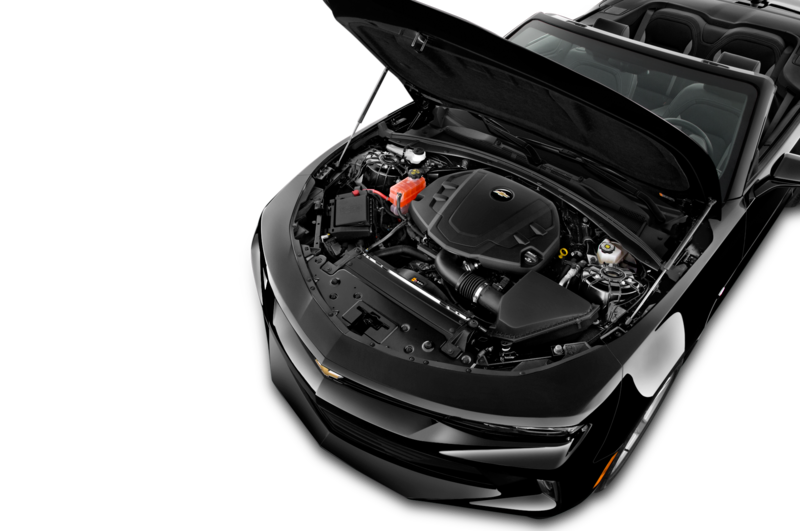 When you add up the cost of the direct-injection V-8, dedicated coolers for the transmission and differential, optional MagnaRide dampers, standard 13.6-inch front, 13.3-inch rear Brembo four-piston brakes, as well as 245/40R-20 front and 275/35R-20 rear Goodyear Eagle F1 Asymmetric 3 run-flat tires, it’s clear that Chevy spent a lot of money on the 2016 Camaro SS. 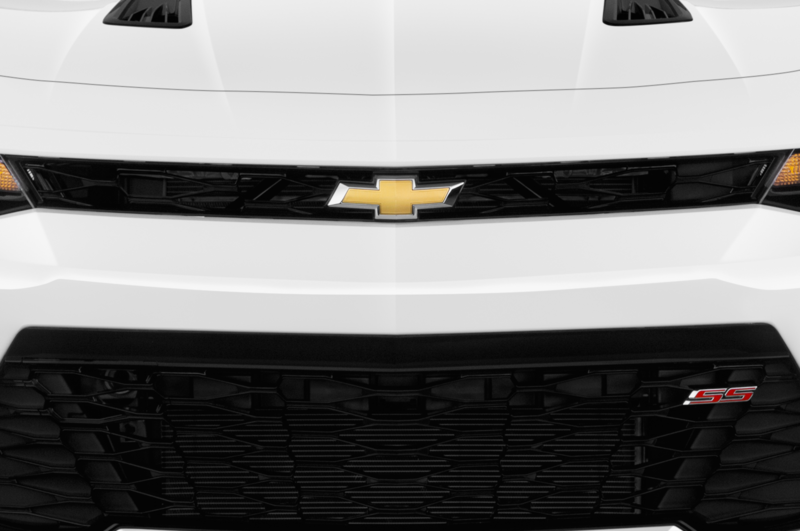 But we also discovered that Chevy clearly spent some money inside the new Camaro as well. 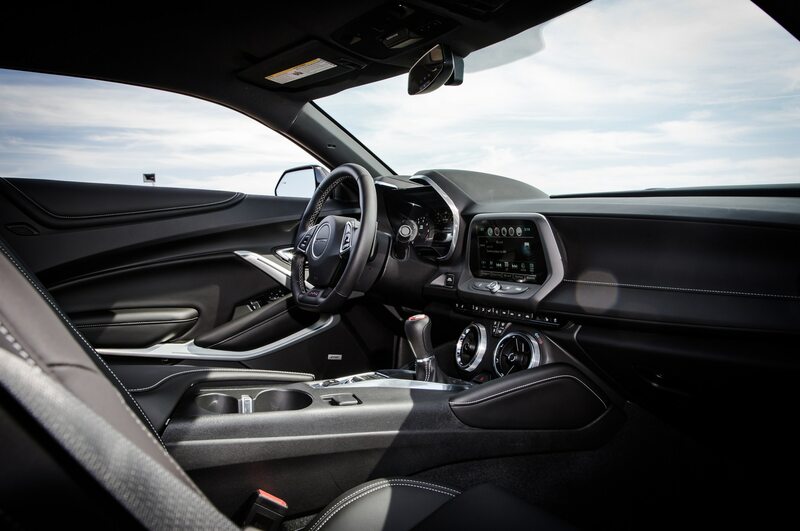 The design architecture and the quality of the execution is a welcome step up from the previous Camaro, not to mention much nicer than the new-generation Ford Mustang. 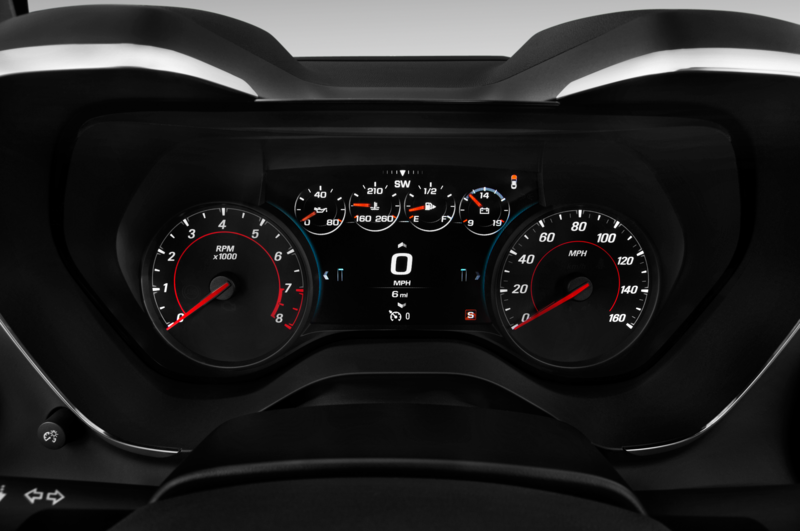 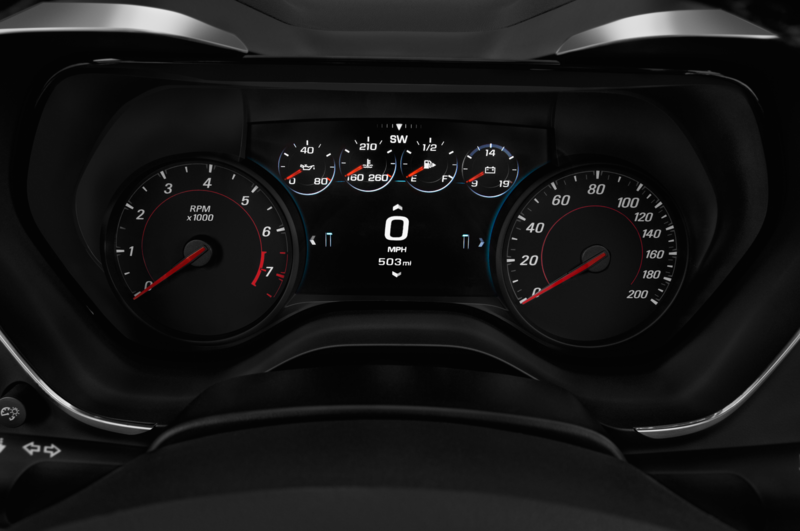 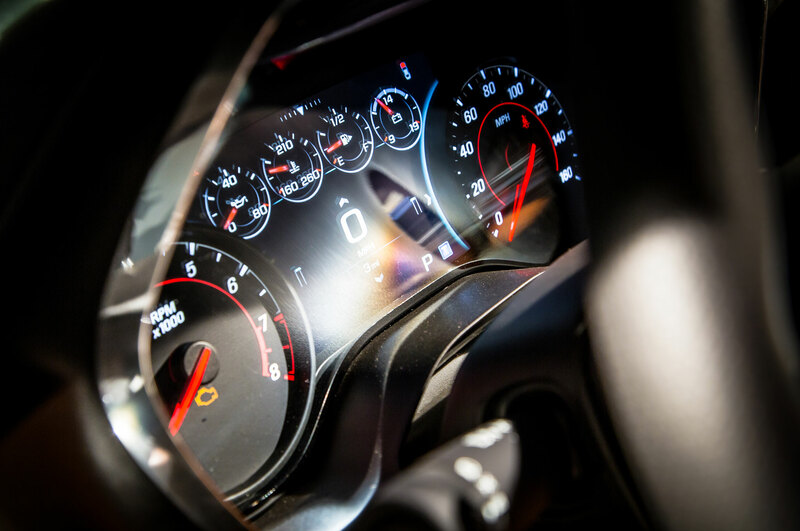 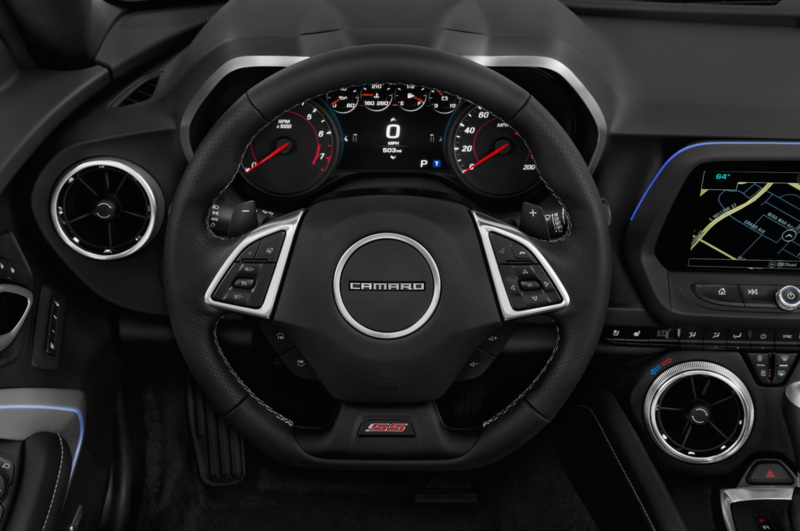 The 2016 Camaro doesn’t feel like it’s trying so hard to be retro, and you don’t see contrived details like the Mustang’s speedometer. 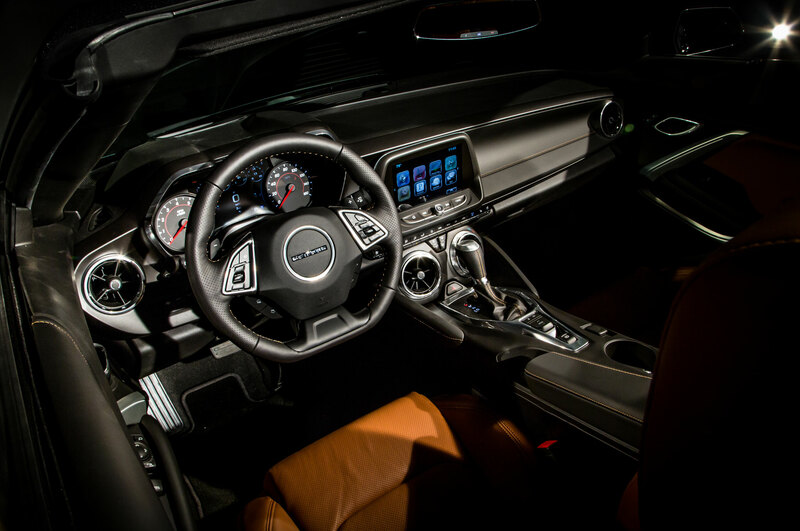 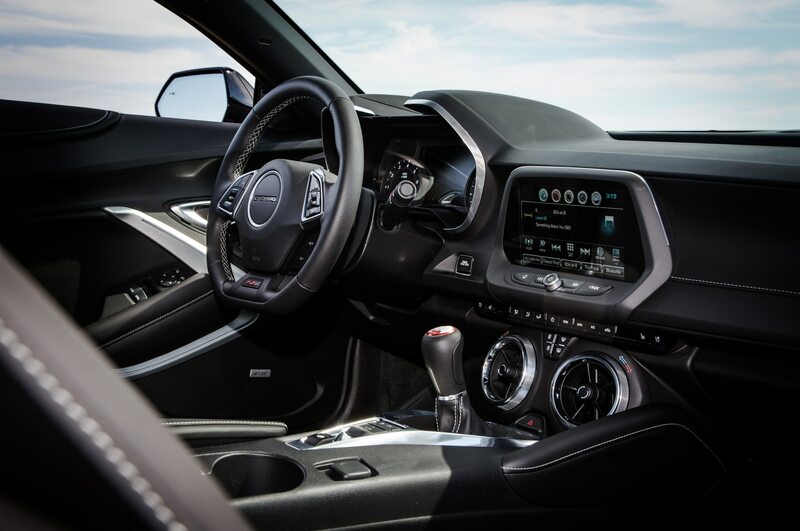 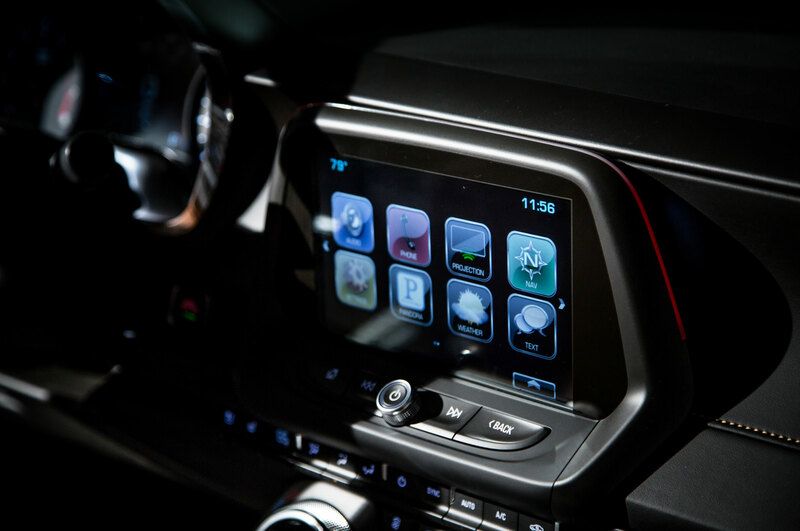 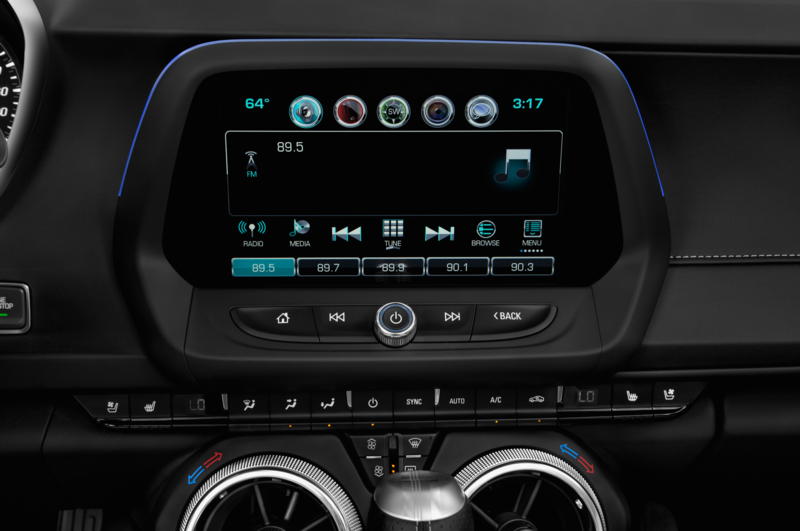 It’s simply a more mature experience inside the Chevy. 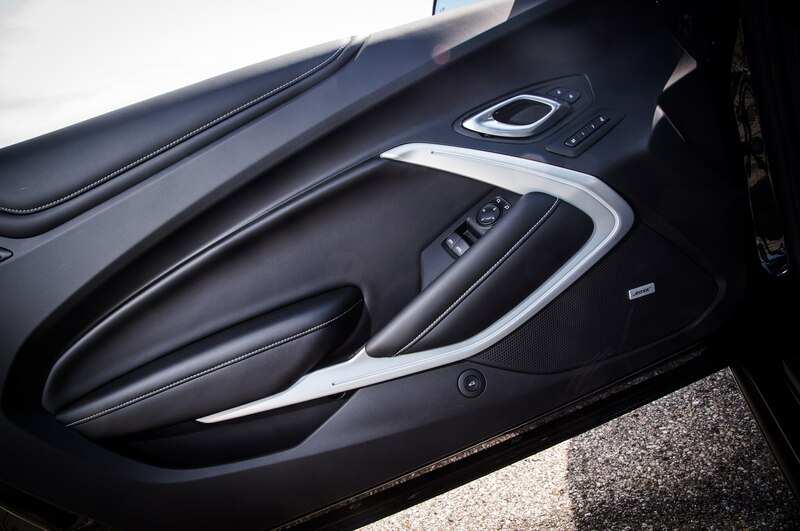 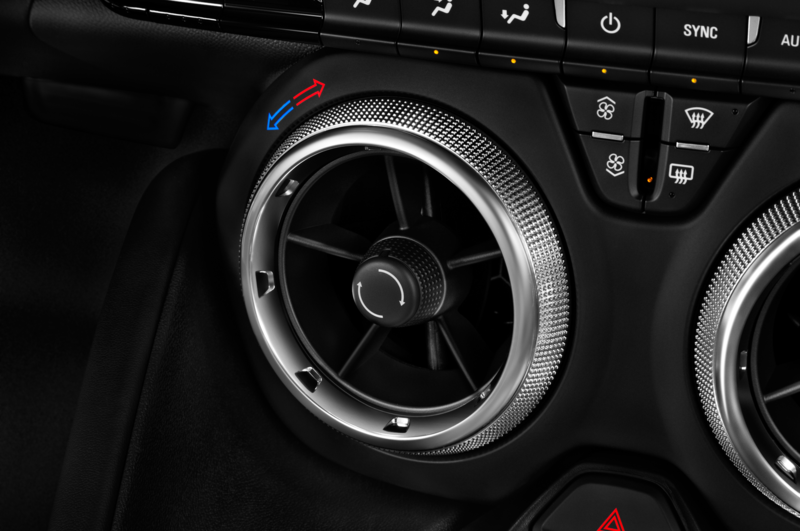 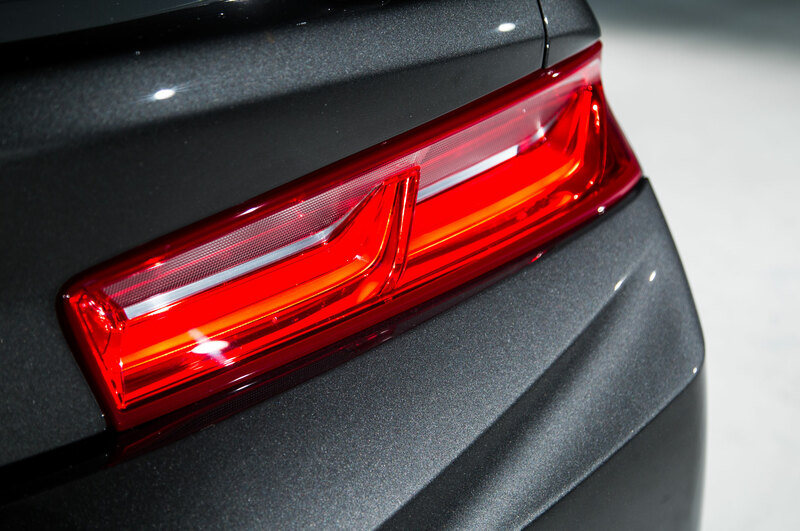 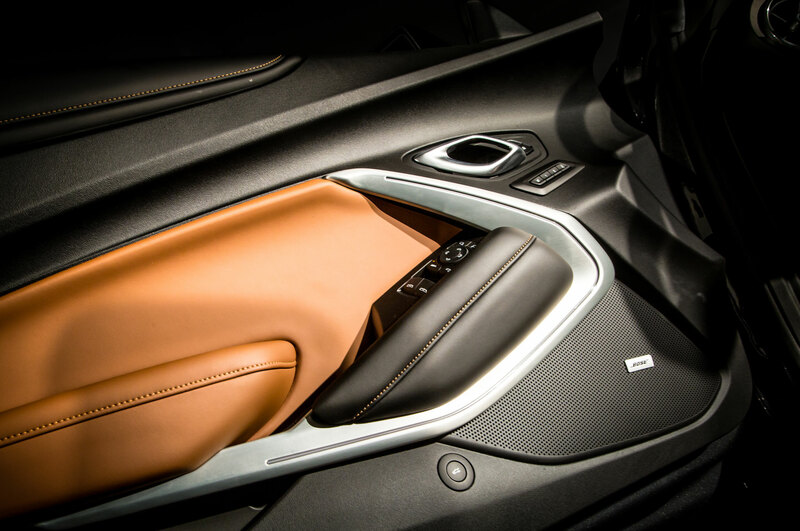 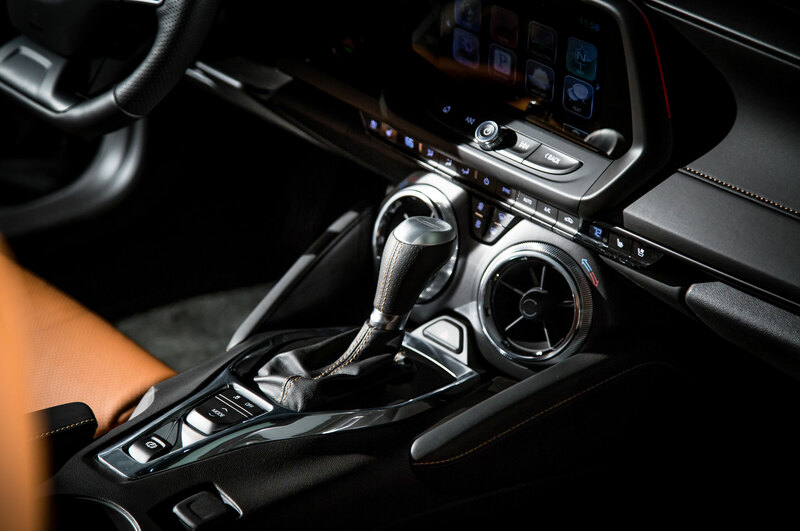 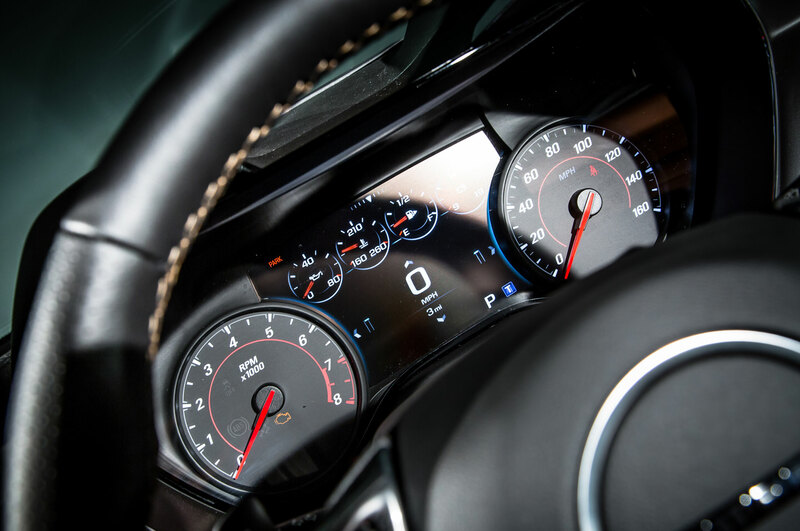 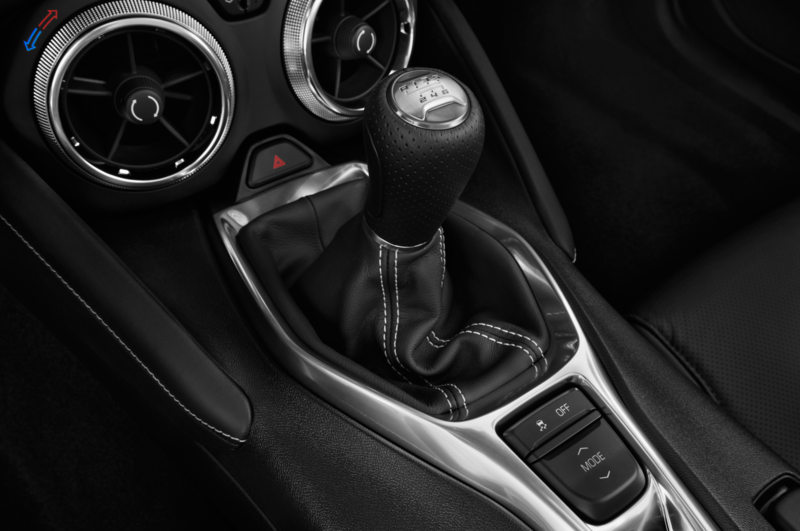 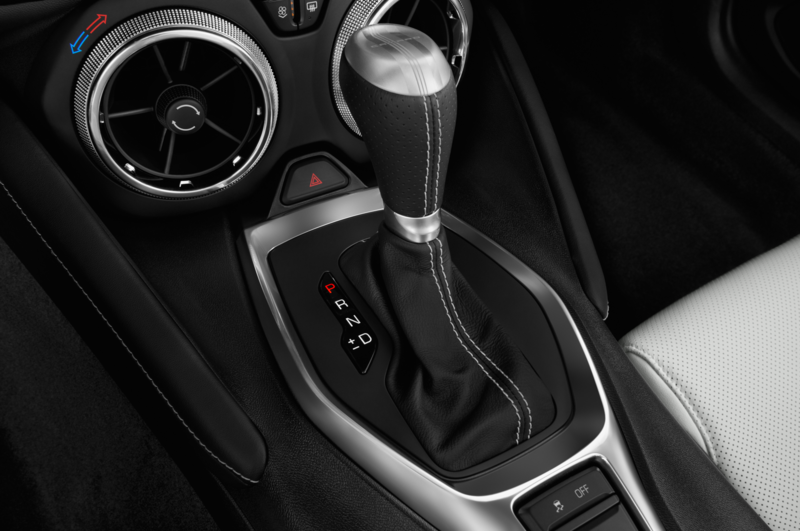 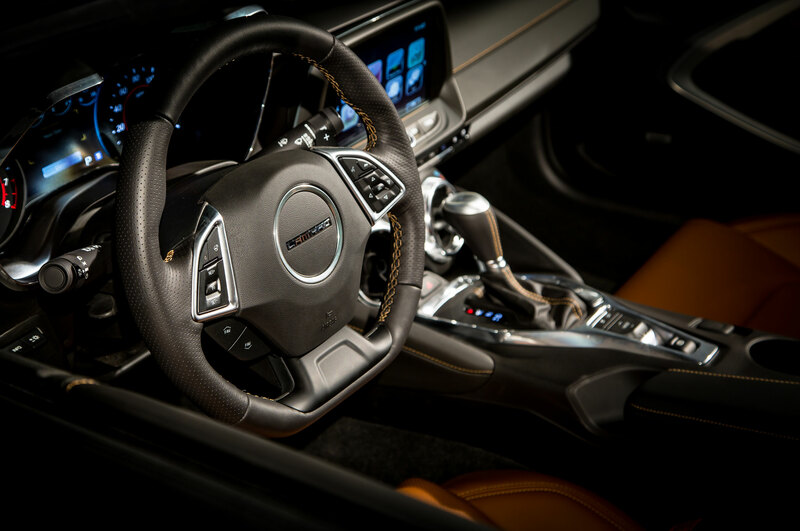 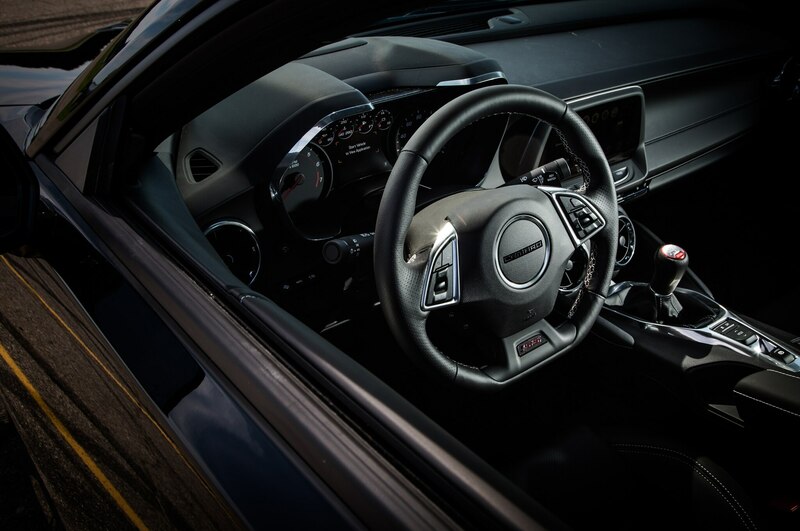 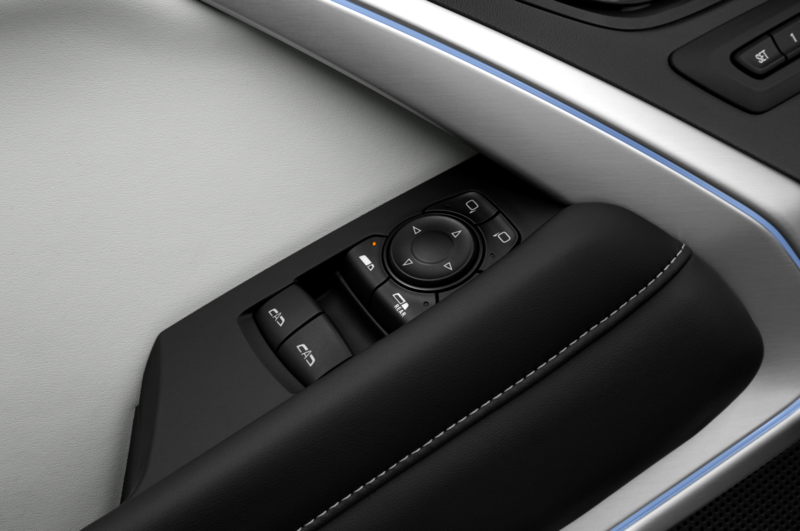 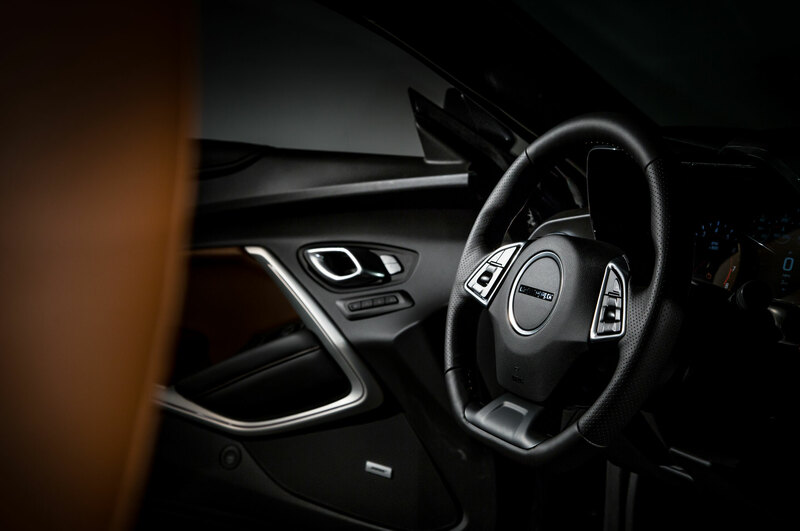 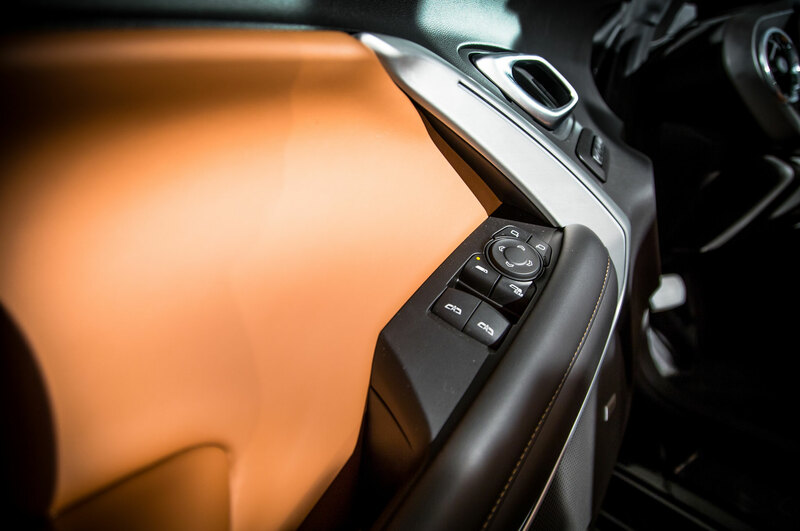 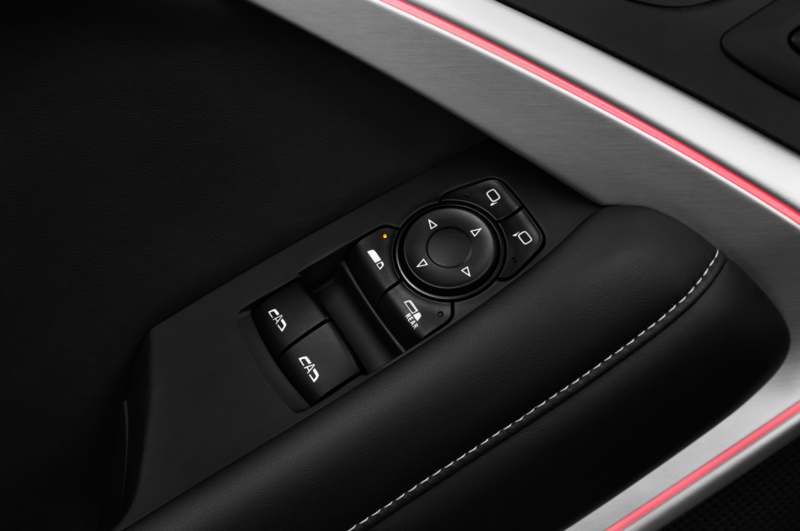 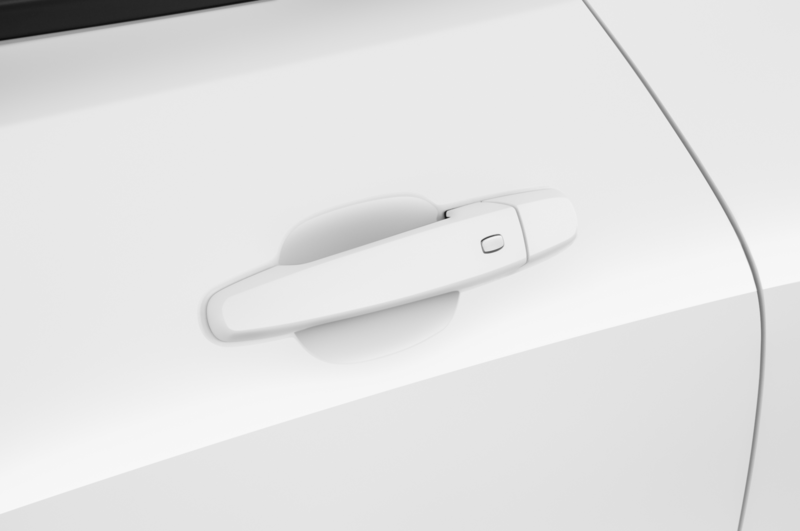 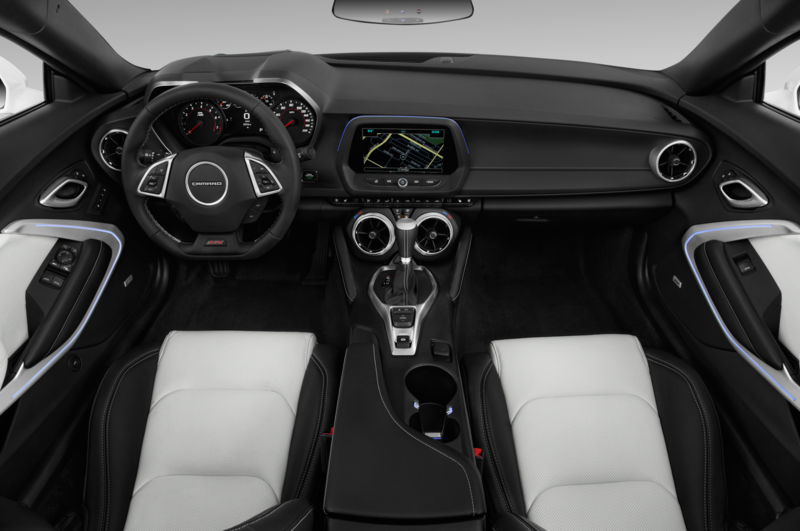 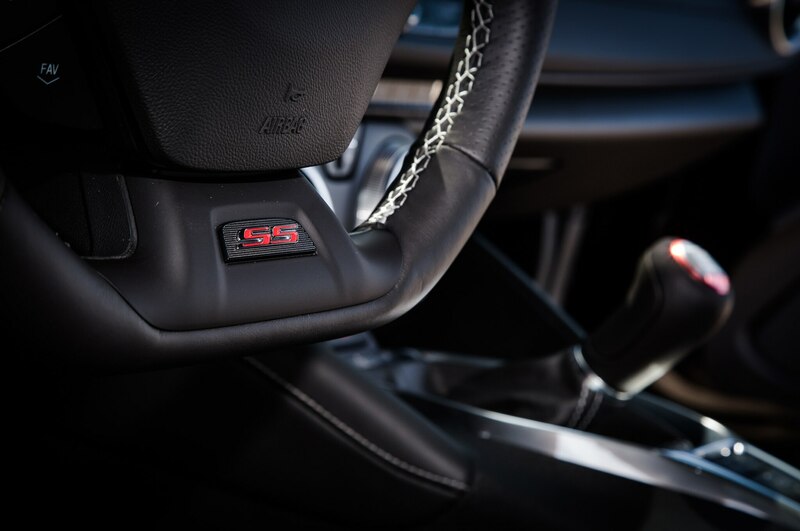 We also like the clever, Audi-inspired way in which the climate control’s temperature adjustments for both driver and front passenger are integrated into the outer rings of the Camaro’s central air vents. 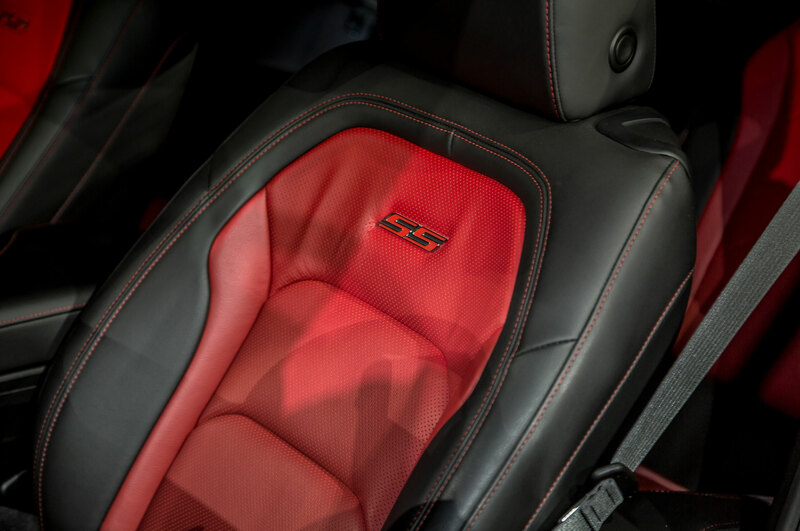 The only real negatives inside the Camaro are the seats. 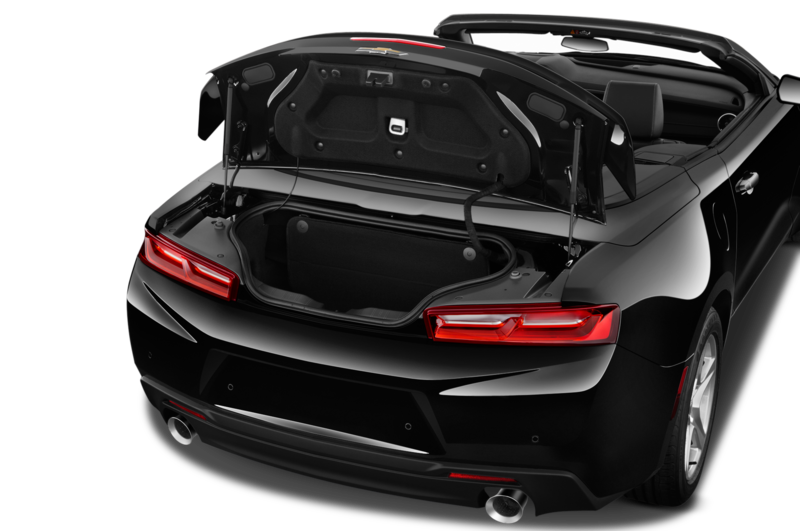 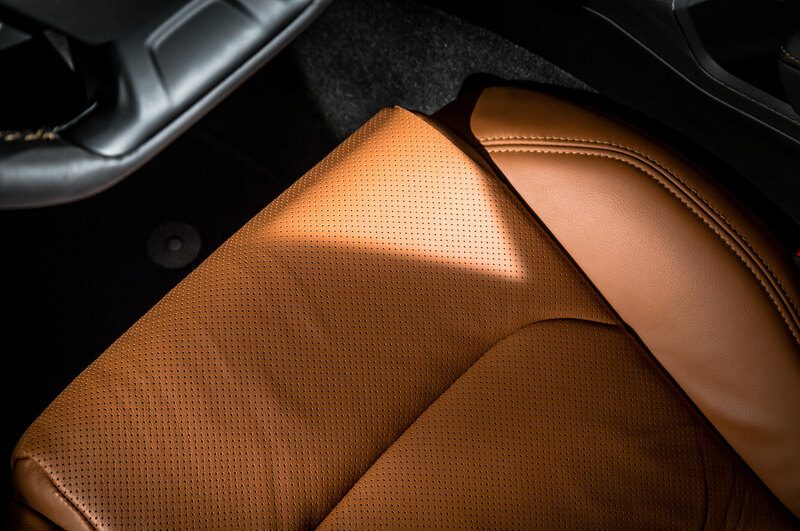 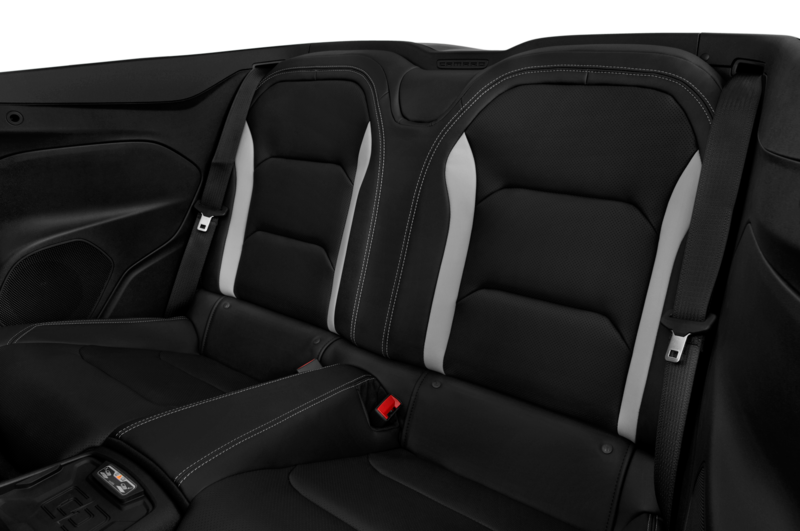 You’re stuck with seats that not only offer little support from the side bolsters but also don’t have even lumbar adjustment. 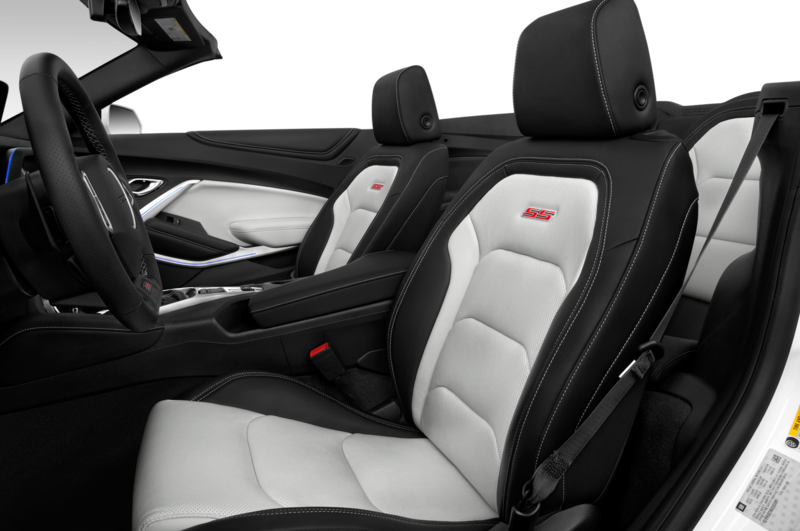 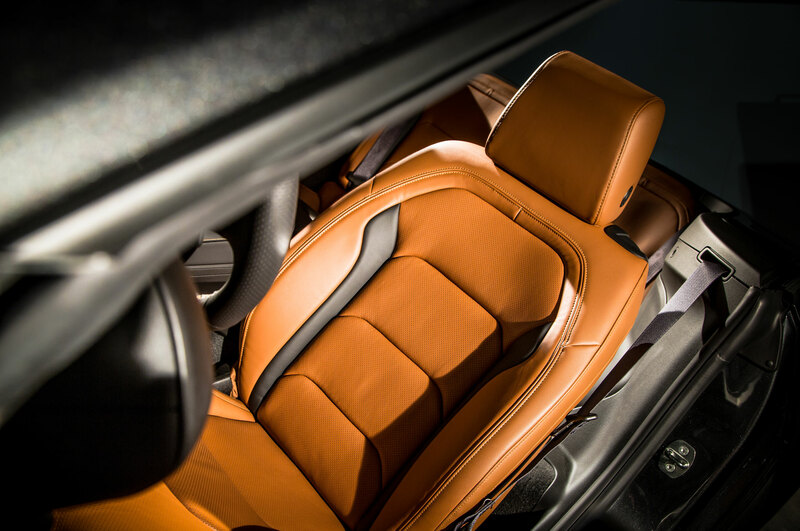 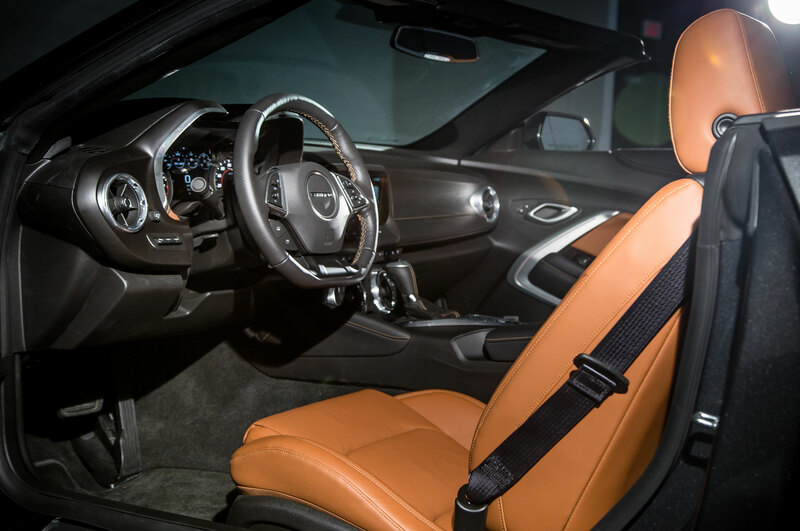 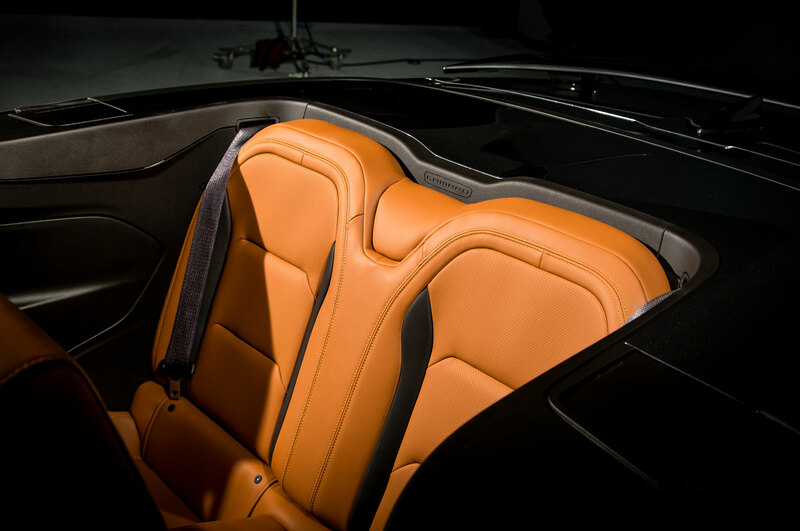 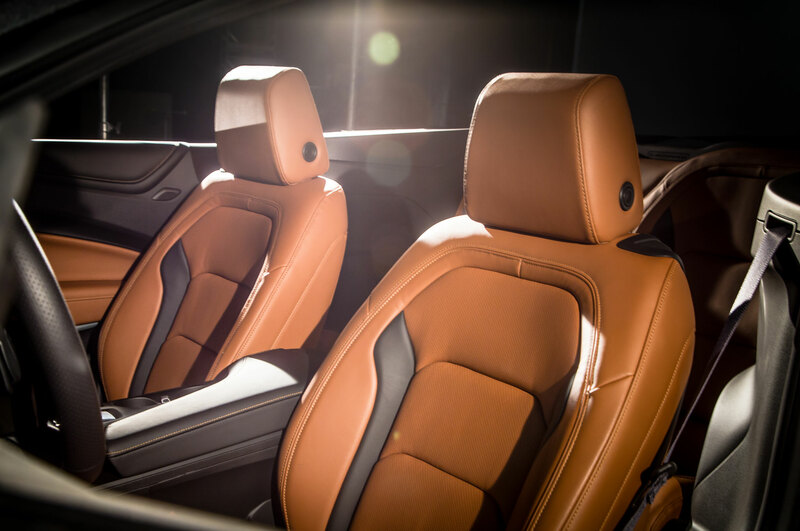 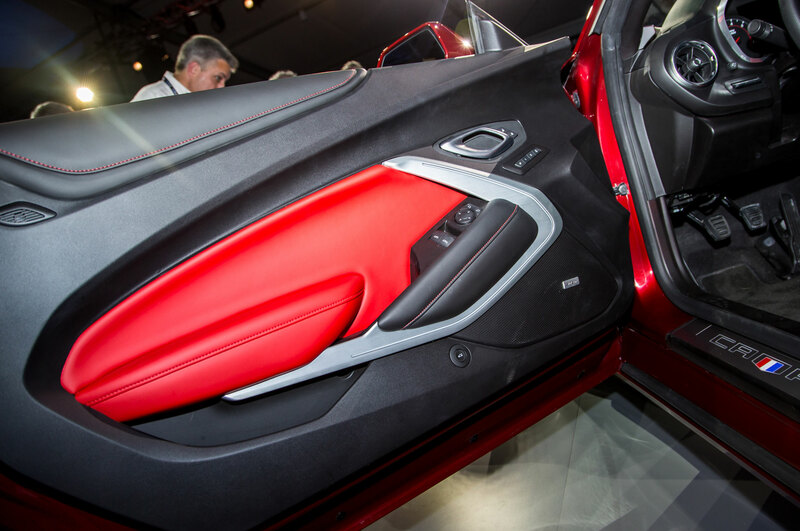 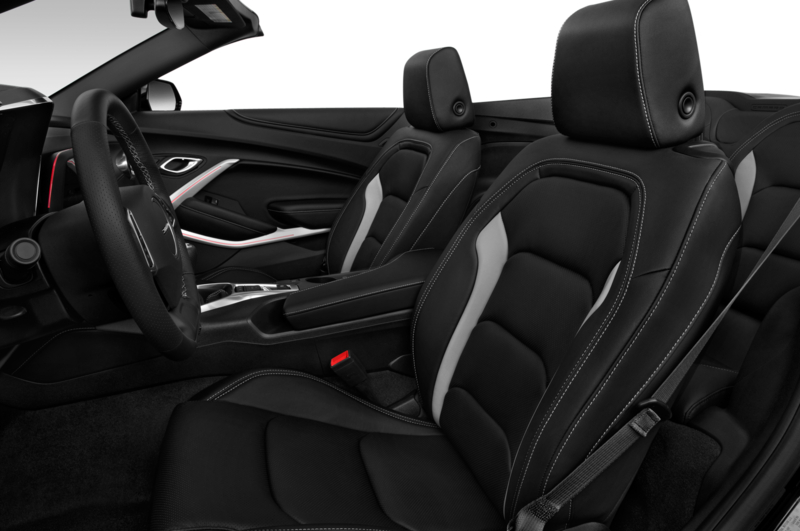 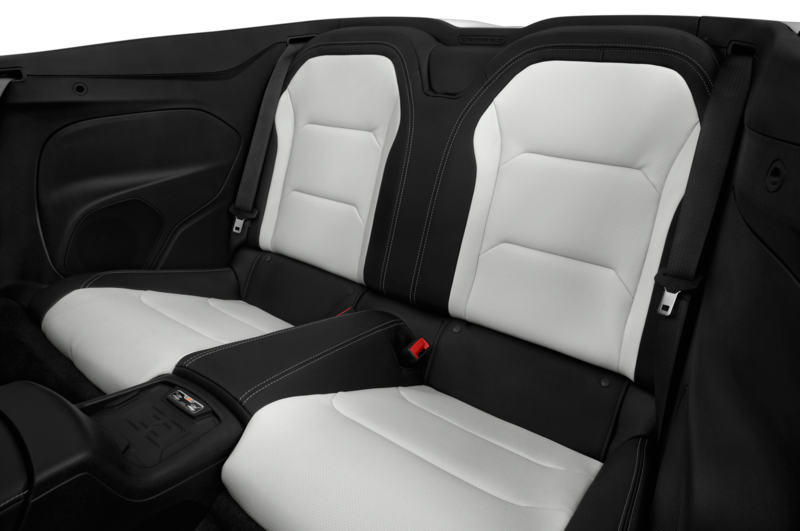 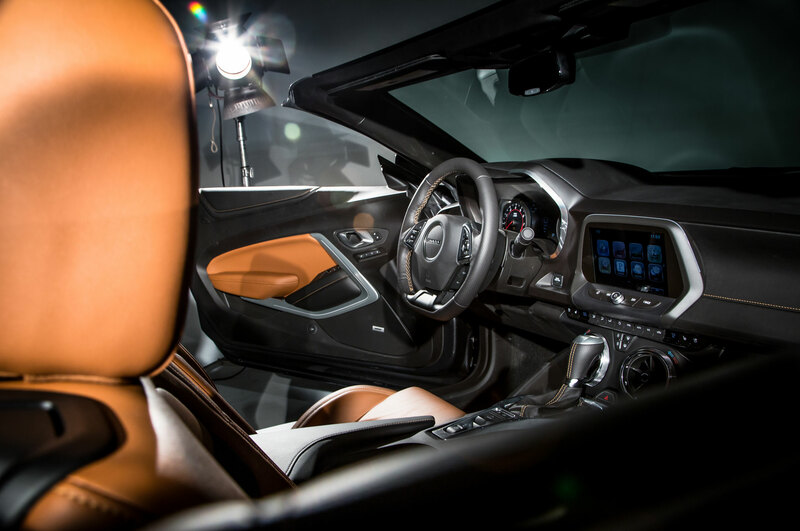 At least the Mustang offers buyers the opportunity to plunk down a little extra for a pair of Recaro chairs. 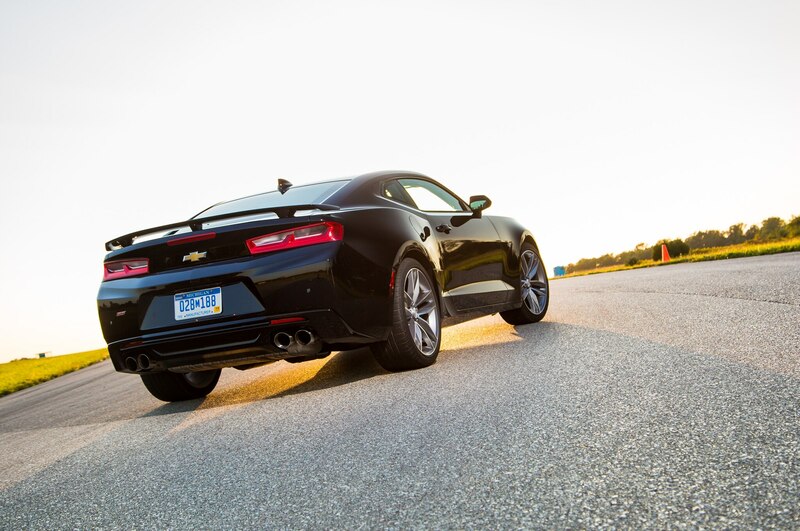 As you’d expect, the 2016 Chevrolet Camaro SS is more of a street car than a track car, and it’s easy to obsess about the little things that might help it get around Gingerman Raceway a little bit better. 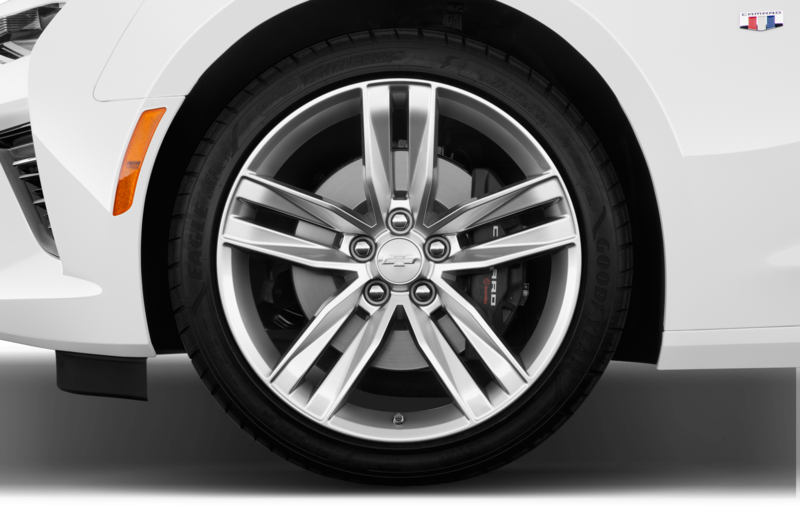 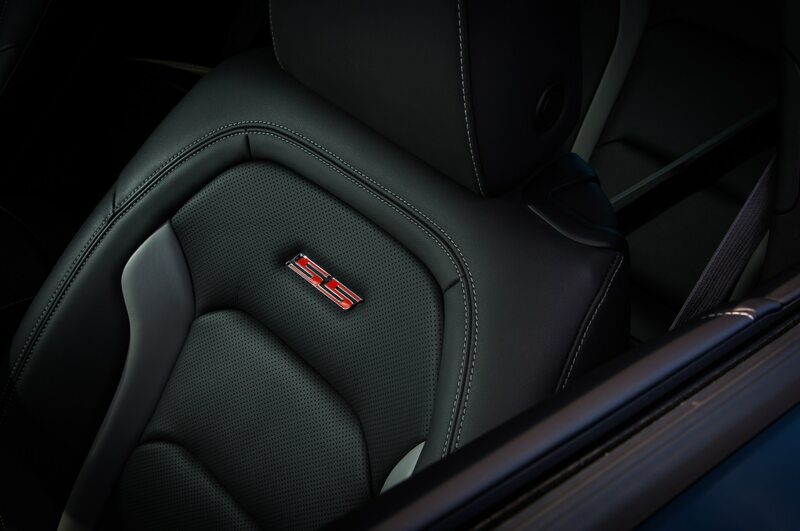 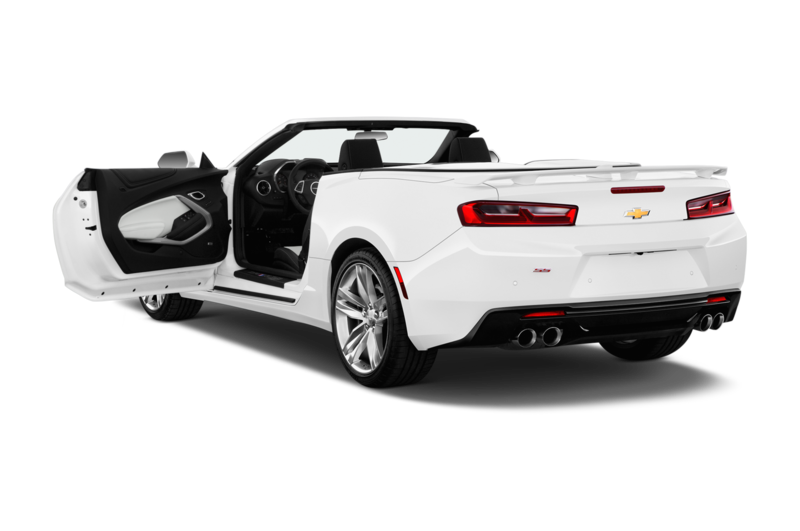 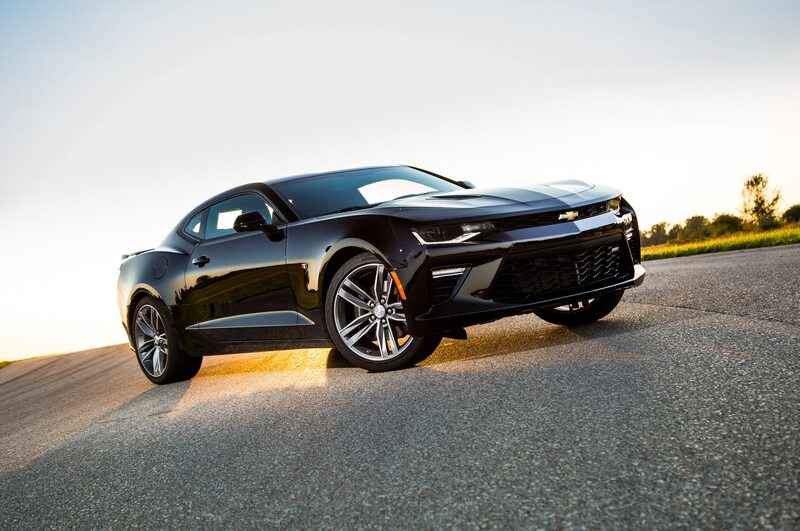 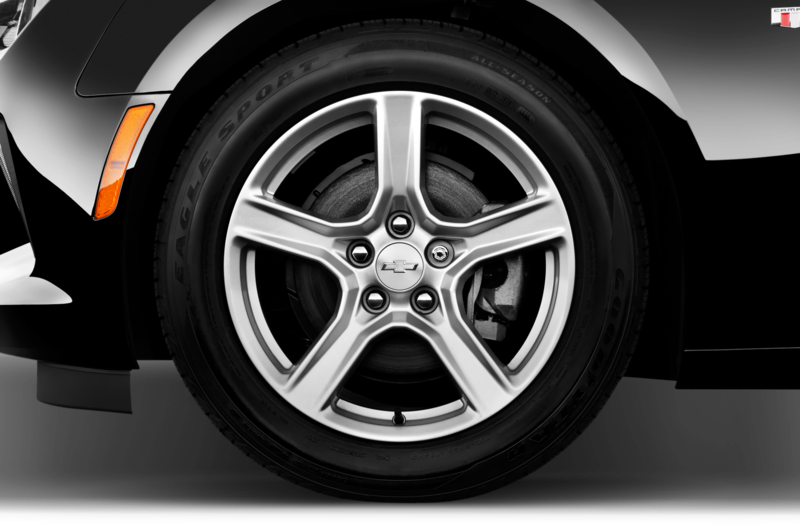 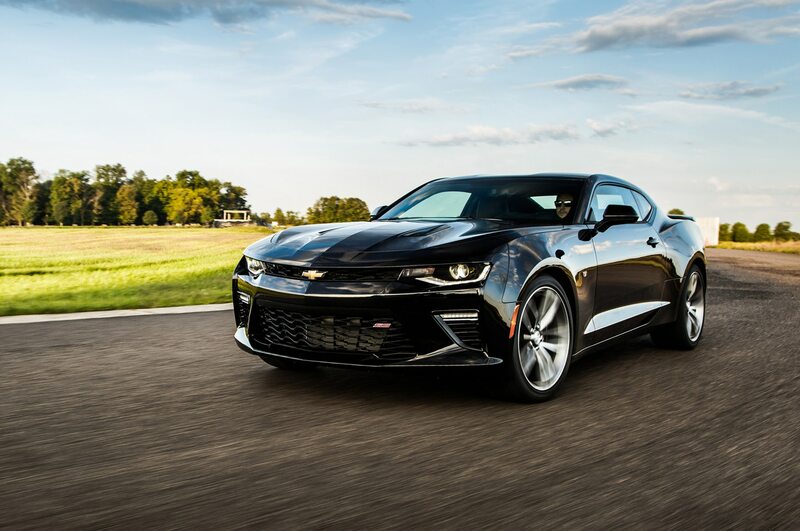 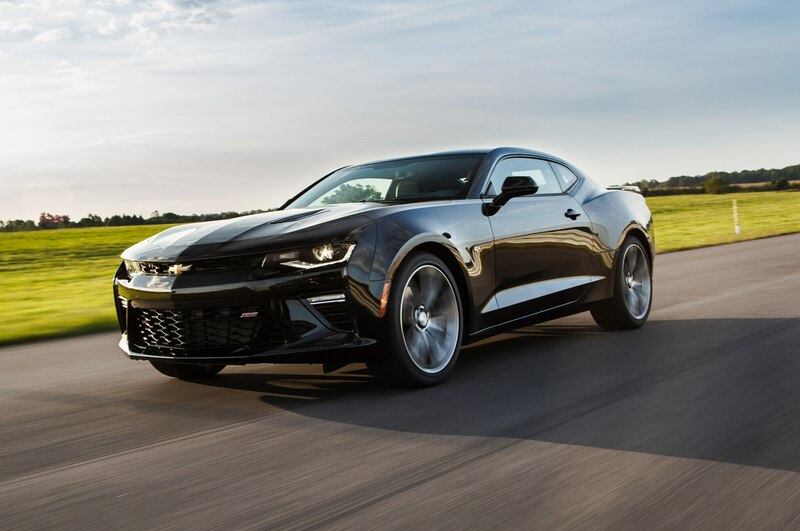 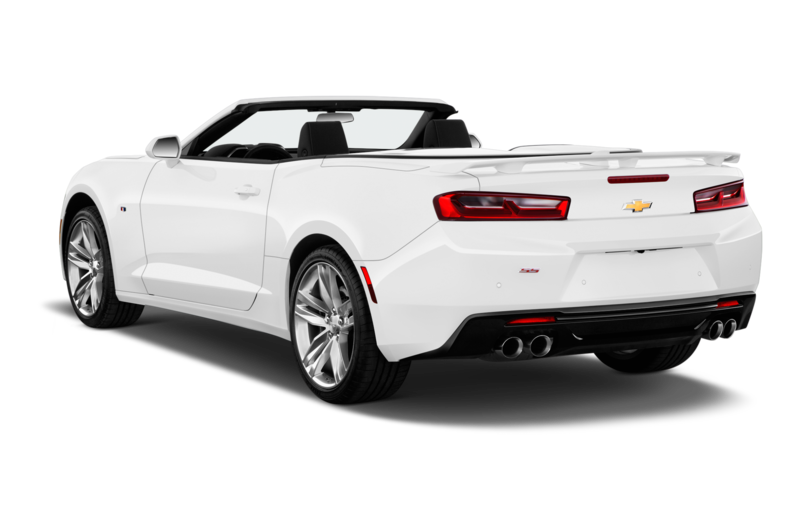 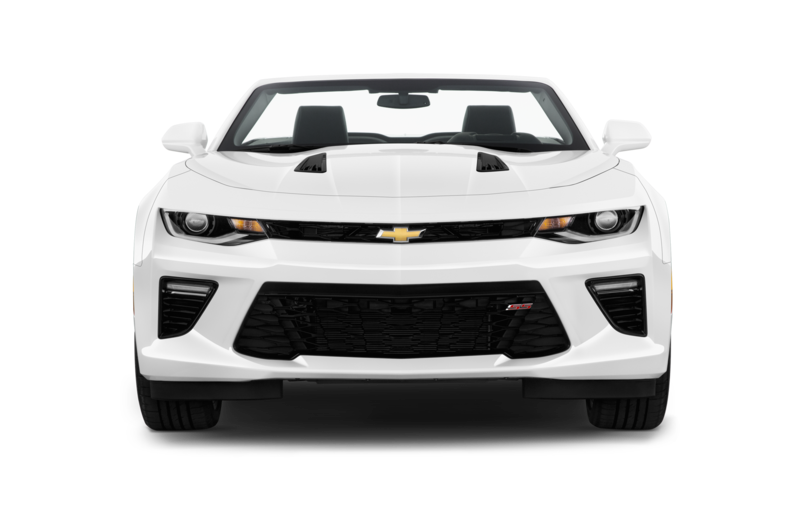 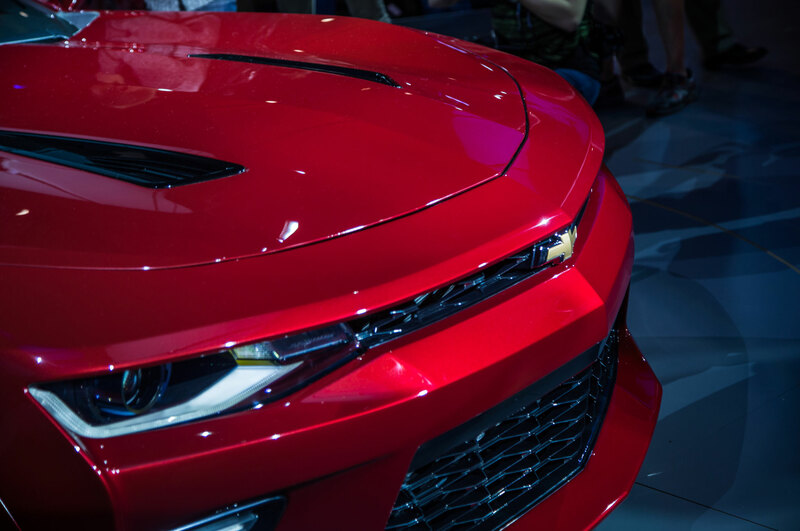 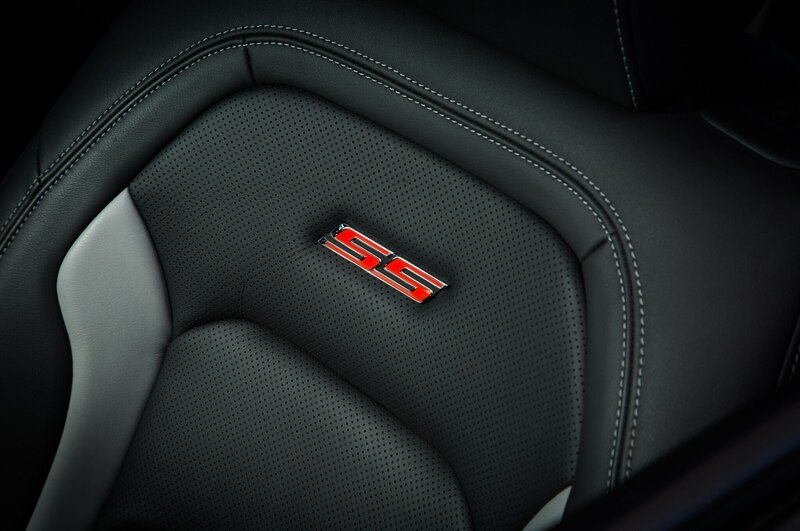 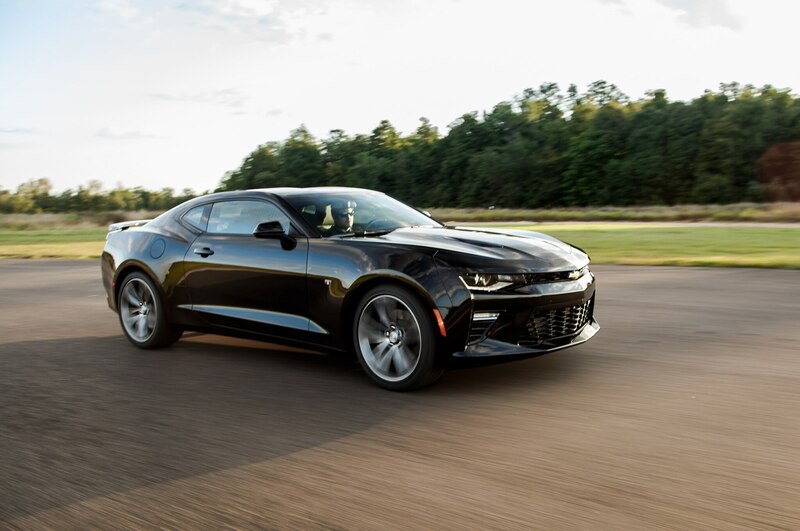 But when you take a step back, you realize that the 2016 Camaro SS is a bigger step forward than you realize, and it has serious track-ready hardware that includes responsive power, a manual transmission made for fast driving, special coolers for the powertrain elements, fast-acting multi-mode dampers, big brakes, and wide tires. 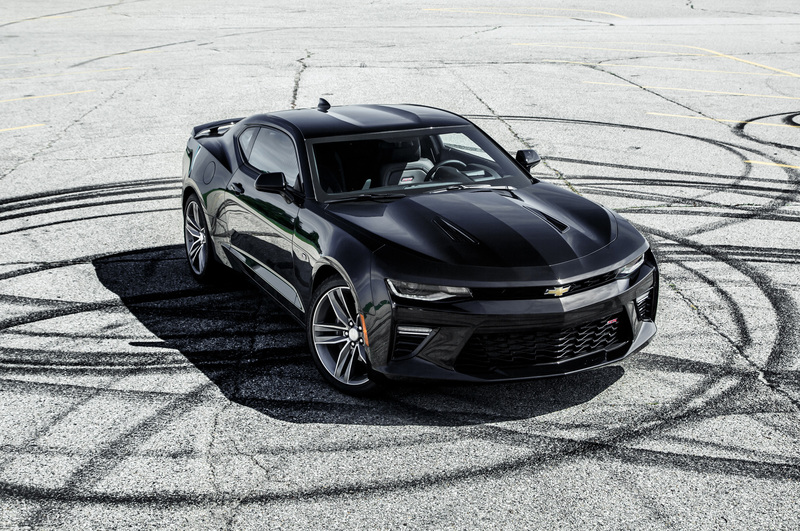 The 2016 Camaro SS practically begs to be driven at the track. 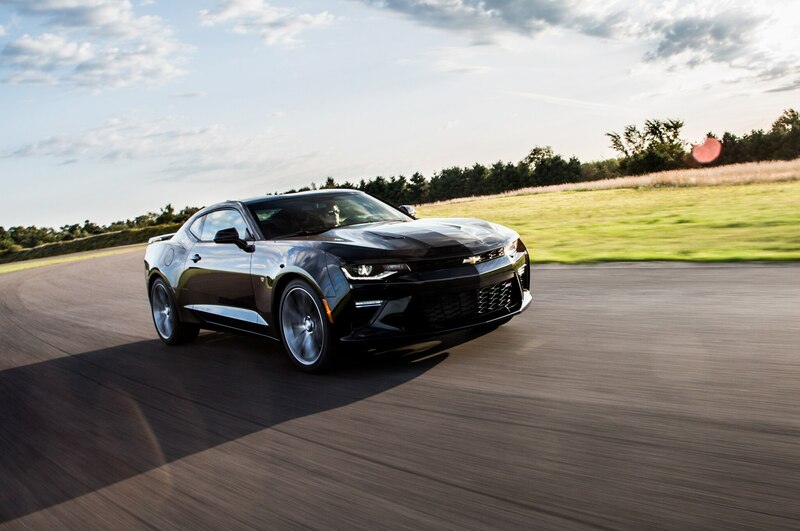 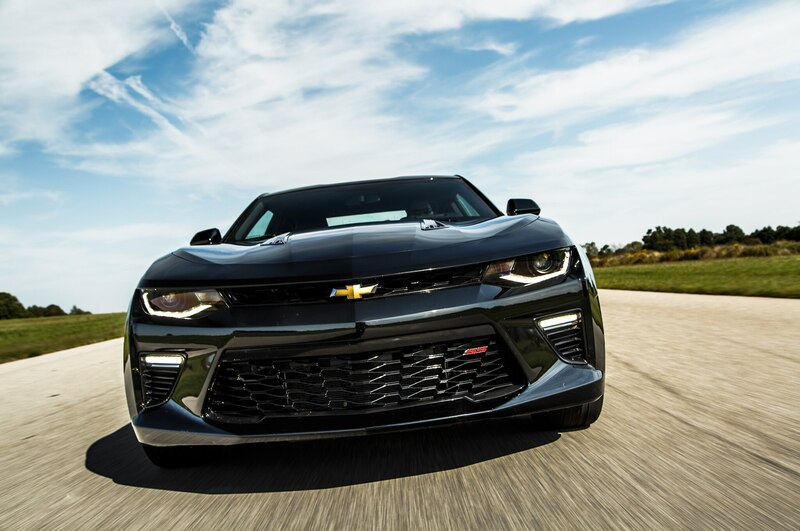 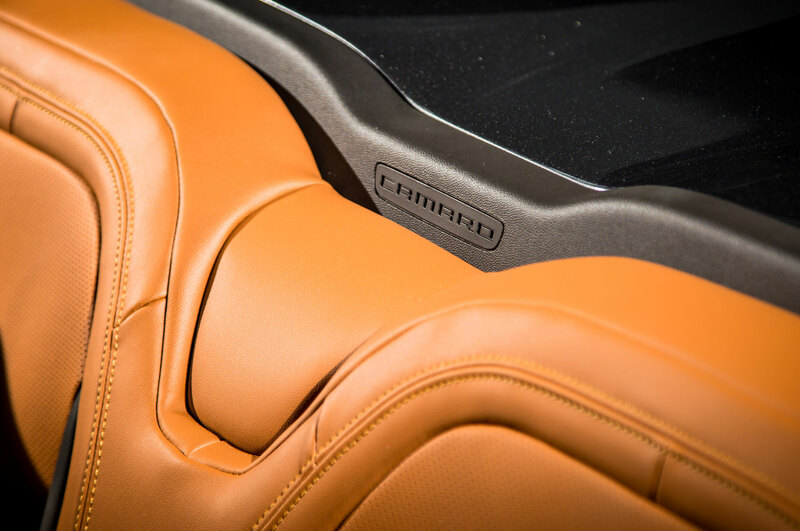 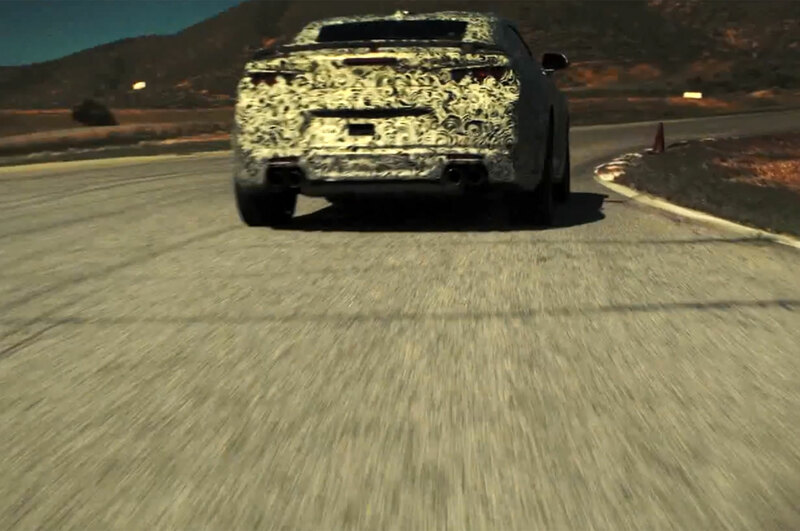 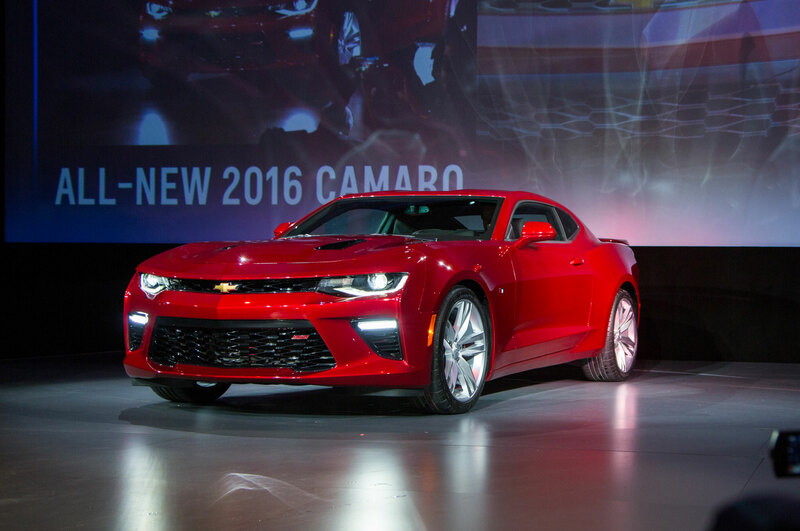 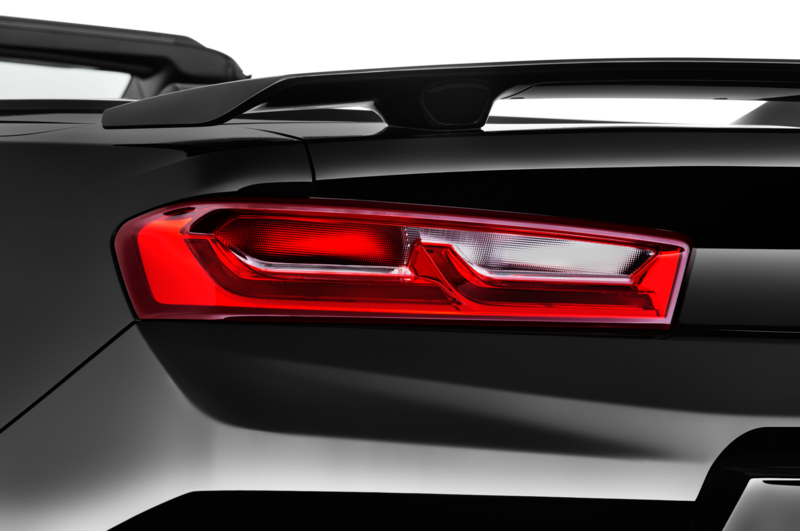 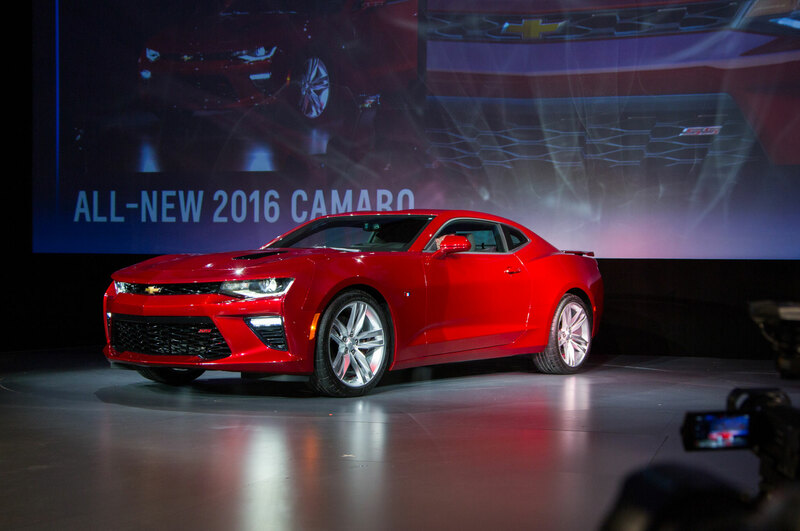 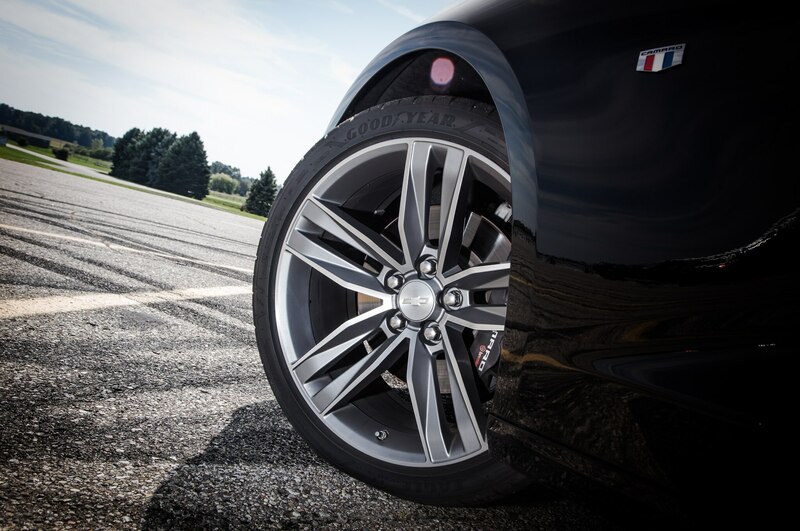 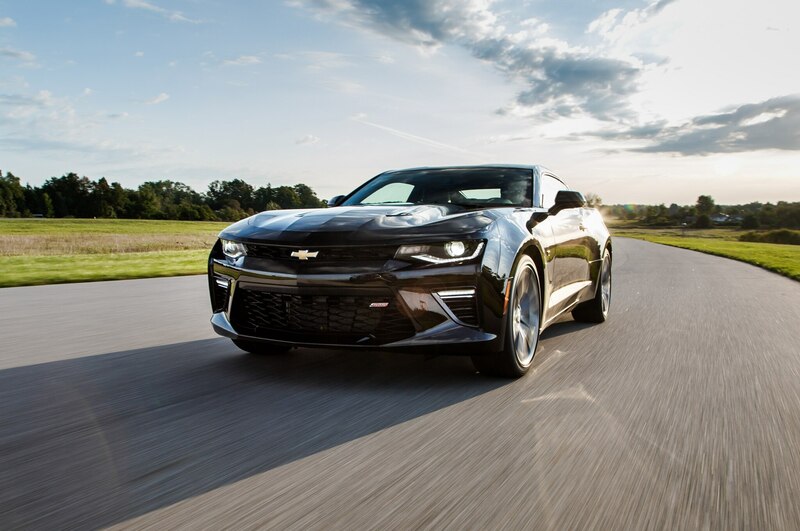 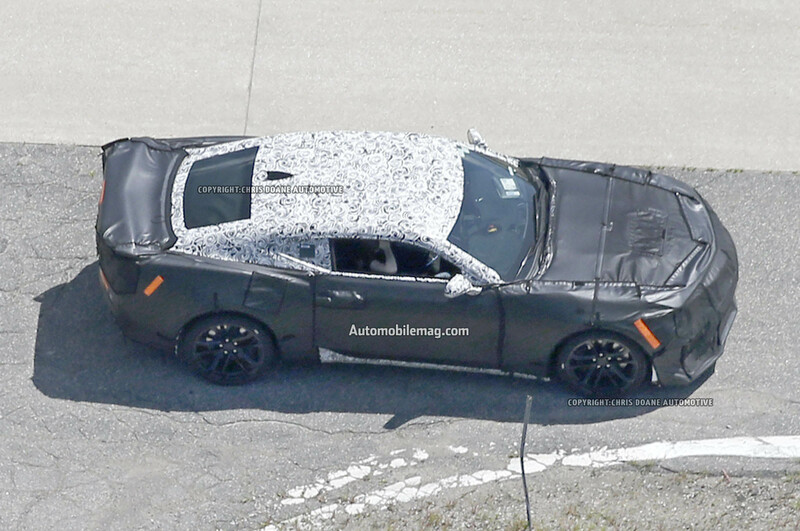 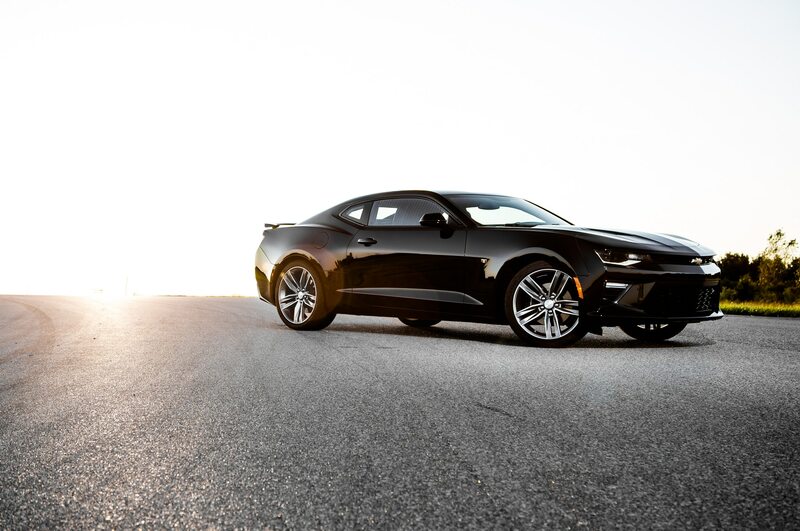 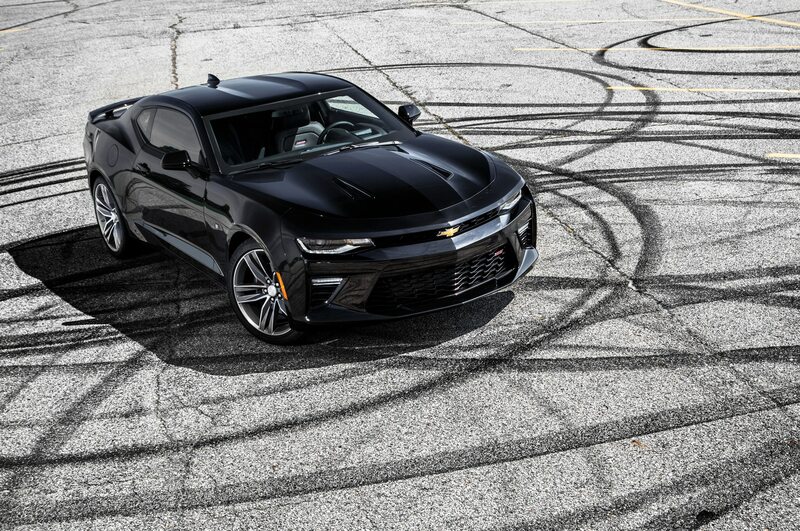 What’s especially exciting is thinking about the future high-performance variants of the 2016 Camaro. 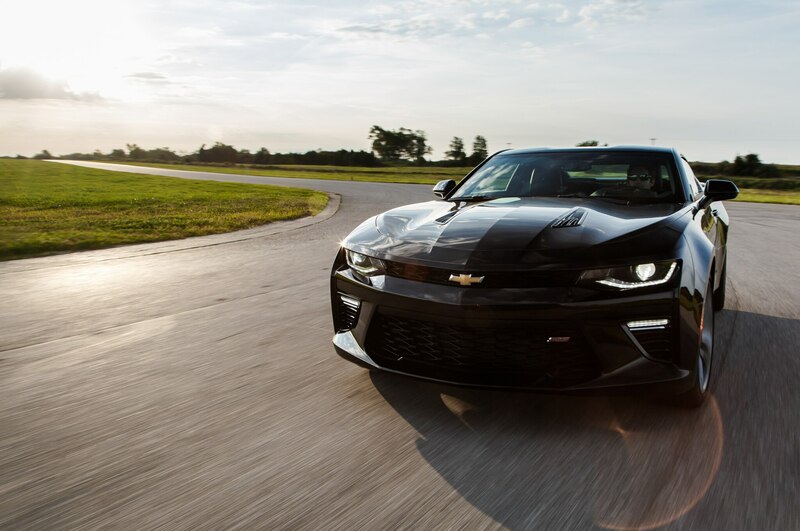 Now that Ford has introduced the brilliant 2016 Shelby GT350 and GT350R, Chevy has a target for the Camaro Z/28 that should be in the making even now. 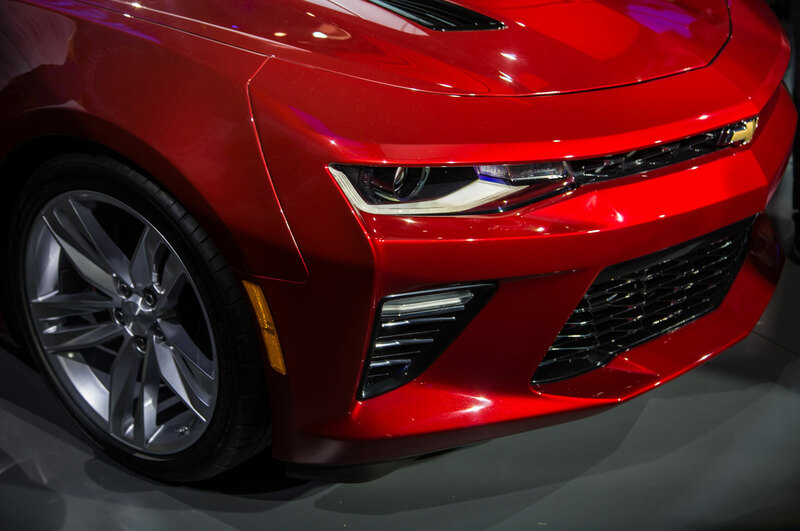 While Chevy engineers had to work wonders to get the most out of the Holden-engineered platform beneath the last generation Camaro, this new engineered-in-Detroit chassis beneath the 2016 Camaro should make development a speedier process. 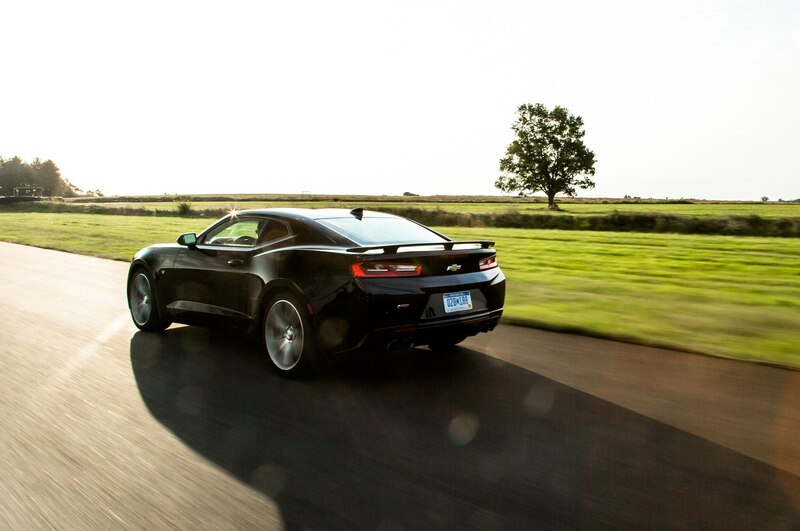 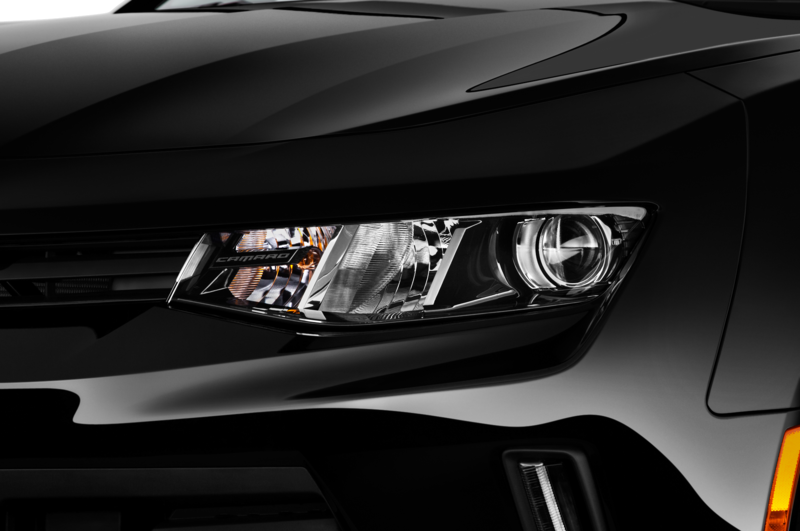 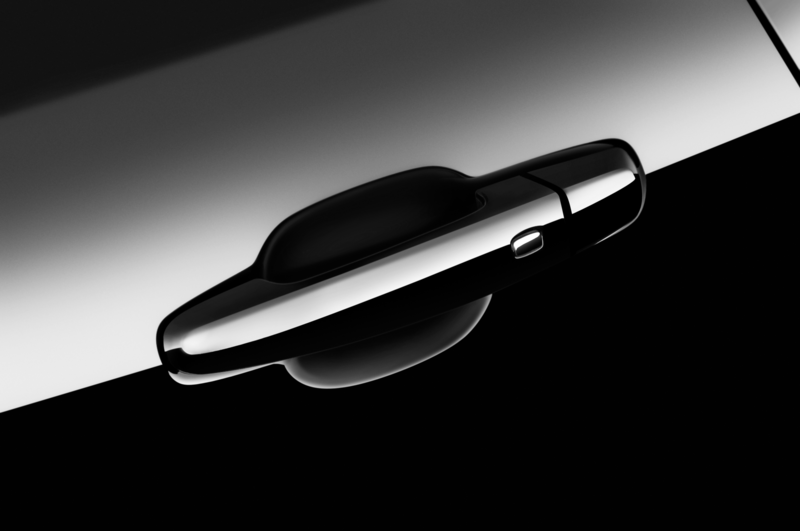 We can’t wait to see — and drive — the results.